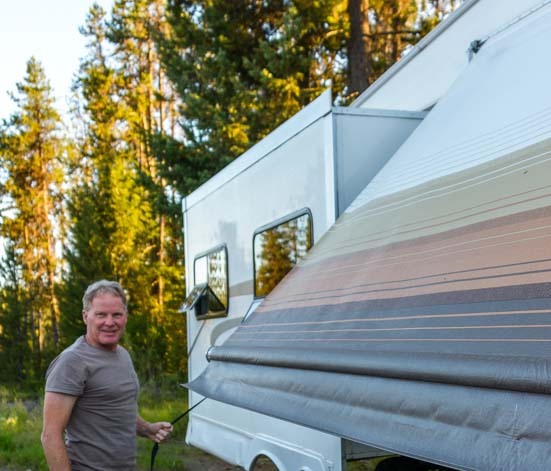 Our RV awning is 11 years old now, and the canvas fabric recently tore at the top and bottom. 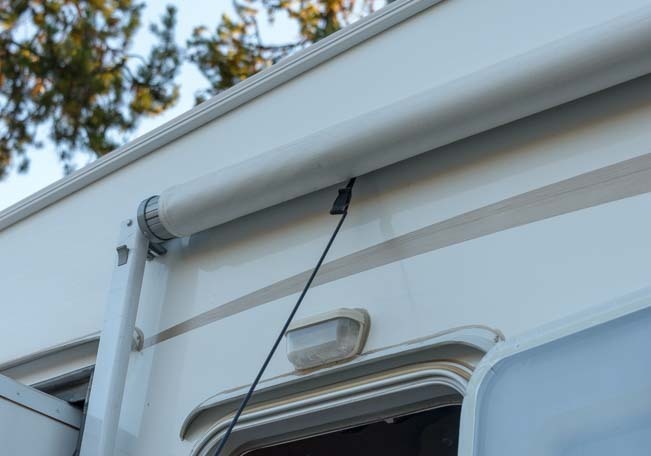 RV awnings are a pain in every respect (except for the wonderful shade they offer), and we knew we were in for a challenging DIY repair if we tried to do it ourselves. 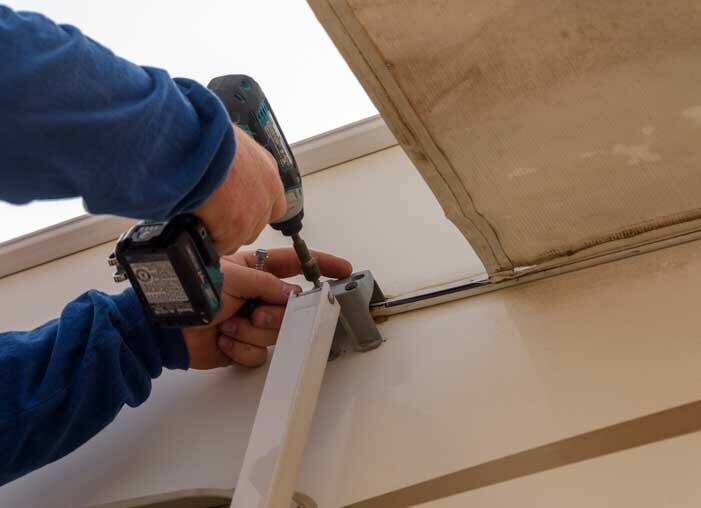 Fixing an RV awning is a job for at least two people, preferably three or four for certain parts of the job, and it’s easiest if someone in the group has done it before because it can be a little tricky. Oh no! Time for new RV awning fabric! 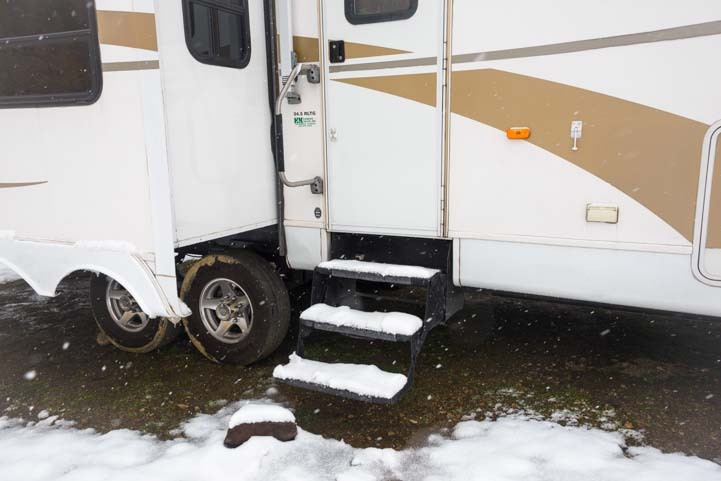 We were traveling through Rapid City, South Dakota, and recent hail storms had made a mess of many RVs and RV dealerships all around the area. 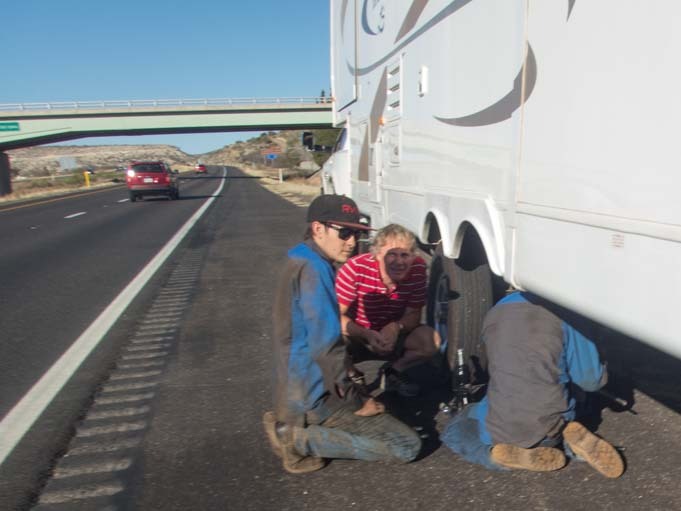 Only one of the local RV dealerships and repair shops could get us in within the week, so we were thrilled when we backed into a bay at Jack’s Campers. Fortunately, they had the fabric for a 17′ Dometic Sunchaser awning in stock, an old manual model that is not installed on new RVs any more. Luckily, there must be enough oldies-but-goodies on the road these days that Jack’s Campers stocks them. We got into position at Jack’s Campers in Rapid City, South Dakota. 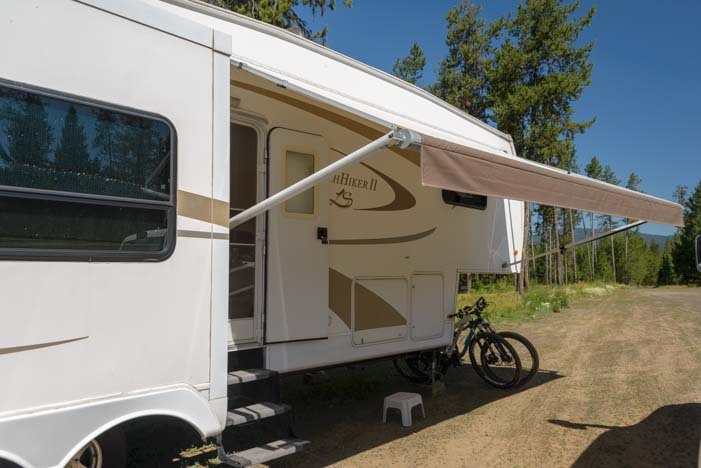 We called our RV Extended Warranty folks, Wholesale Warranties, to find out if this awning failure would qualify for reimbursement under our warranty plan. 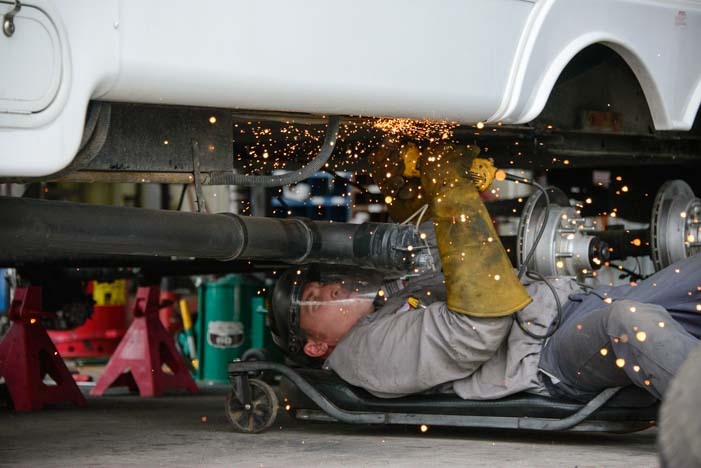 We have had so much good luck with our extended warranty on major repairs like our refrigerator, trailer axle, suspension, toilet and window leaks and plumbing, that we were hopeful this repair would be covered too. However, only the mechanical aspects of the awning were covered, not the fabric. 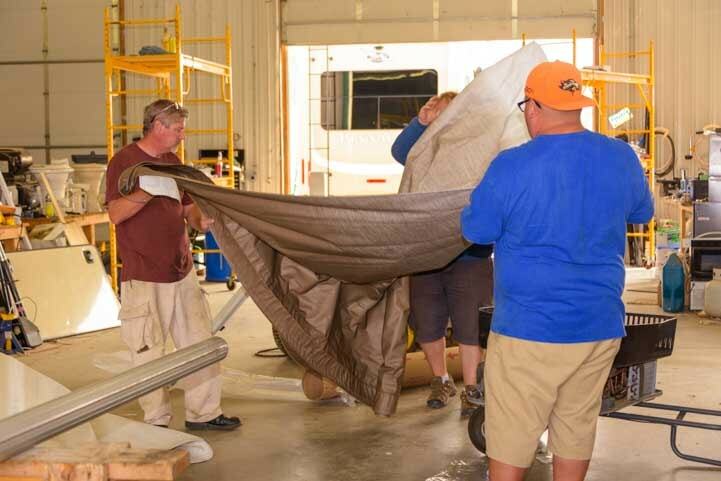 In the end, the whole RV awning repair job ended up costing $444 out of pocket, most of that being for the new fabric, and it took the guys at Jack’s Campers just 45 minutes to do it. 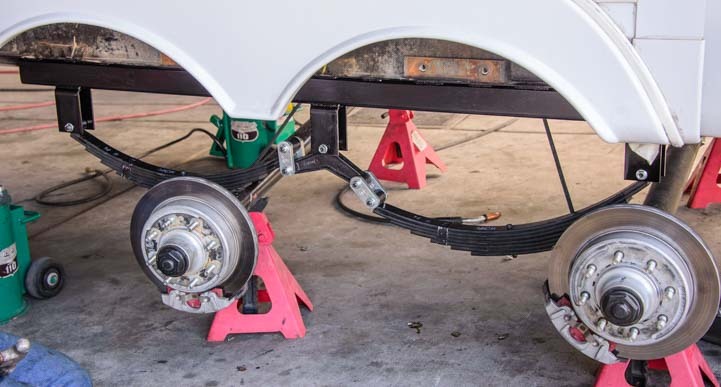 The first step was to remove the awning arms and roller from the sidewall of our fifth wheel. They unrolled the fabric about a foot and unscrewed the mounting brackets that attached the awning arms to the side of the trailer. 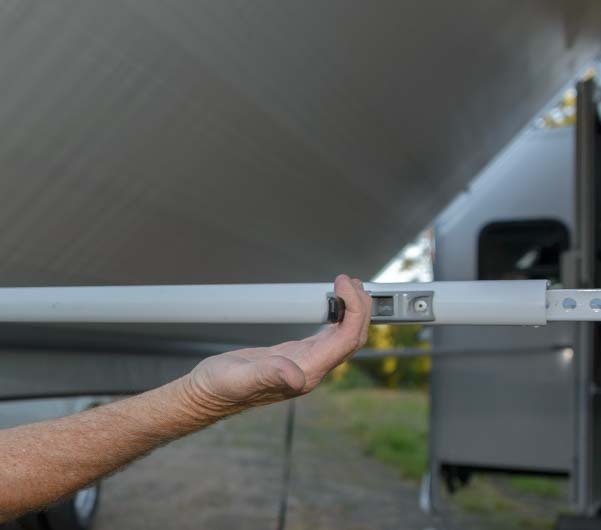 First, remove the awning arms from the sidewalls of the trailer. There was putty in the awning fabric track where the mounting bracket had been, so this had to be removed with a flathead screwdriver. There was some putty in the awning track, so it was removed with a flathead screwdriver. 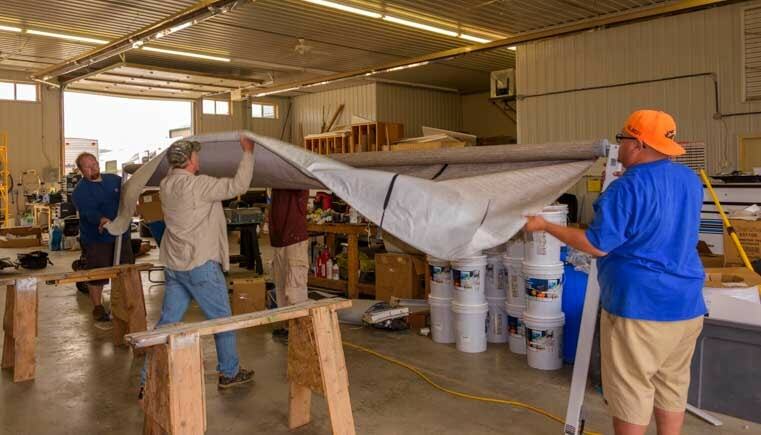 Next, two guys slid the awning fabric off of the awning track on the RV wall and marched the whole thing into the workshop and rested it on some saw horses. Two mechanics walked the awning out of the track on the trailer. Once in the shop the awning was laid across some saw horses. 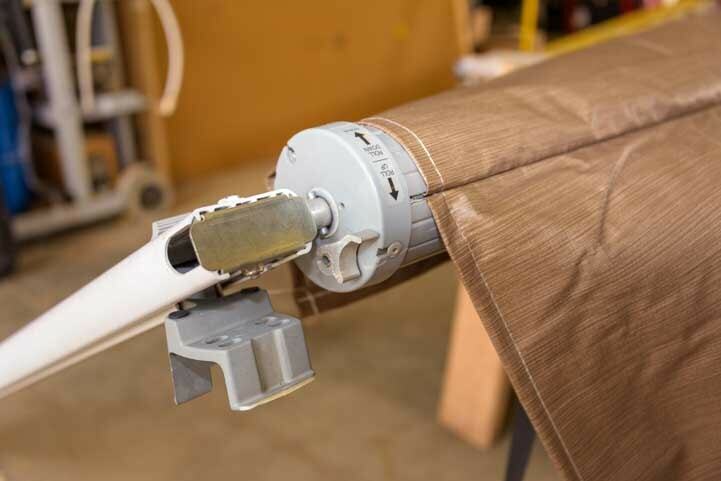 Manually operated RV awnings have a spring inside the roller mechanism (a “torsion assembly“) for rolling up the fabric. 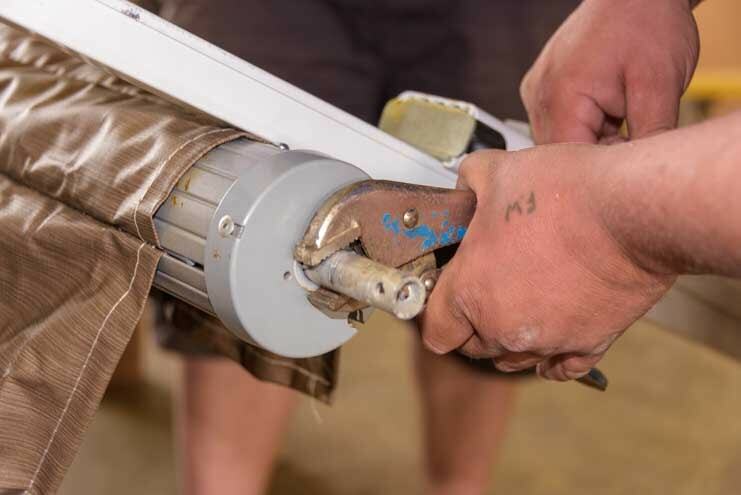 At one end of the roller there is a locking mechanism to keep the spring inside the roller tight so the fabric doesn’t unroll. 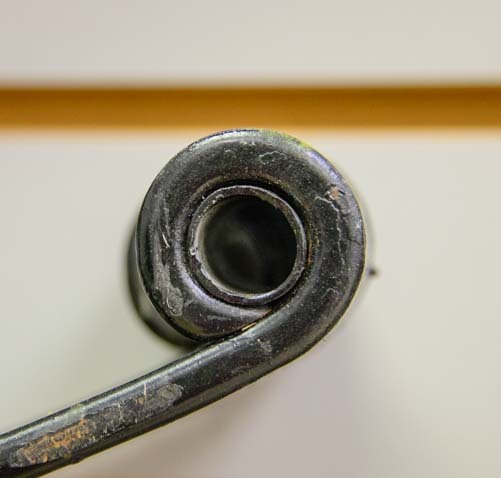 This locking mechanism became important when the new fabric was installed to get the spring tensioned correctly inside the roller. 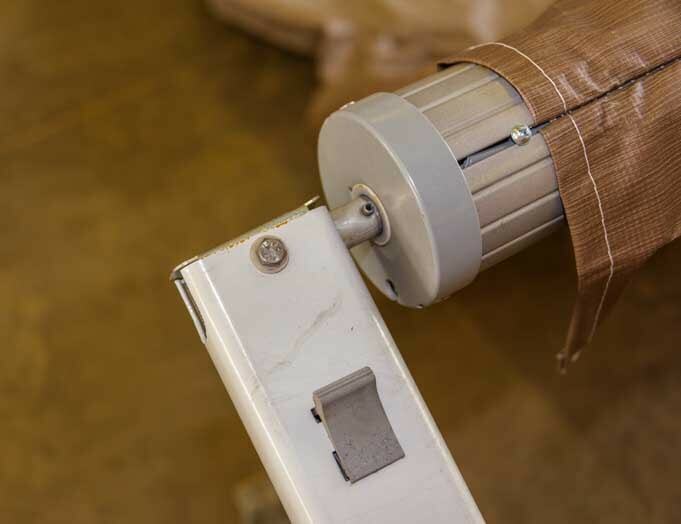 The right arm of the awning has a locking mechanism which keeps the fabric from rolling off the roller. At the opposite end of the roller there was no locking mechanism. 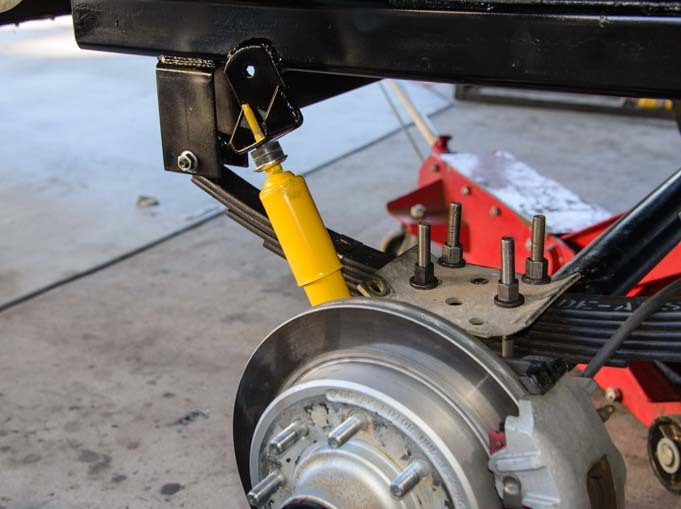 The bolt holding the awning arm to the roller at the non-locking end was removed and the arm was pulled off. 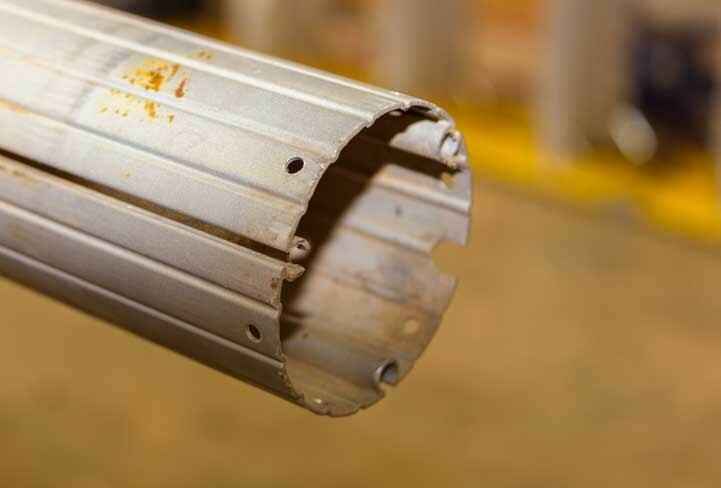 The arm at the locking end of the roller remained attached throughout the job. 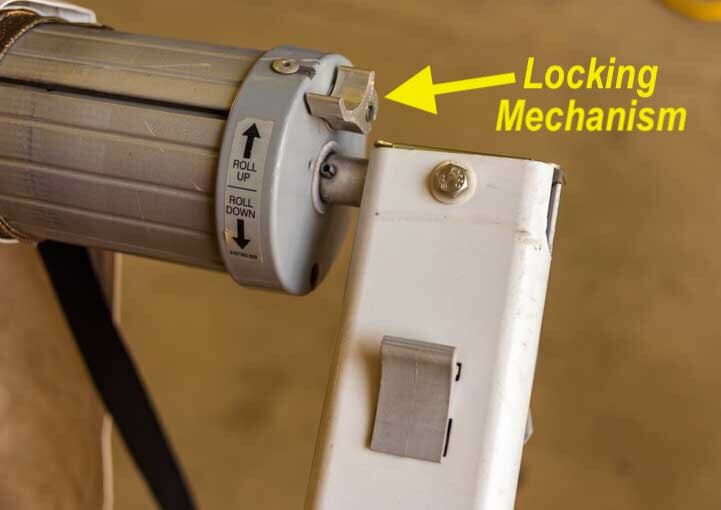 Remove the awning arm from the non-locking end of the roller. Then the rivets on the endcap were drilled out and the torsion assembly was pulled out. Drill out the rivets on the endcap. 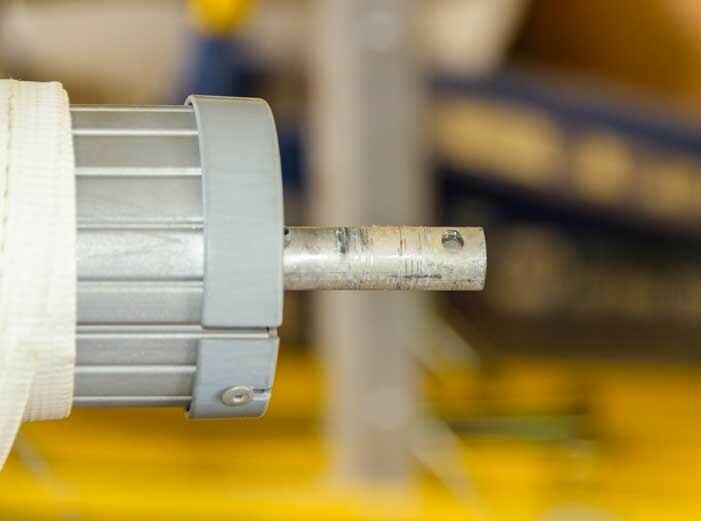 The endcap and spring (torsion assembly) are removed from the roller. The torsion assembly is out of the roller. 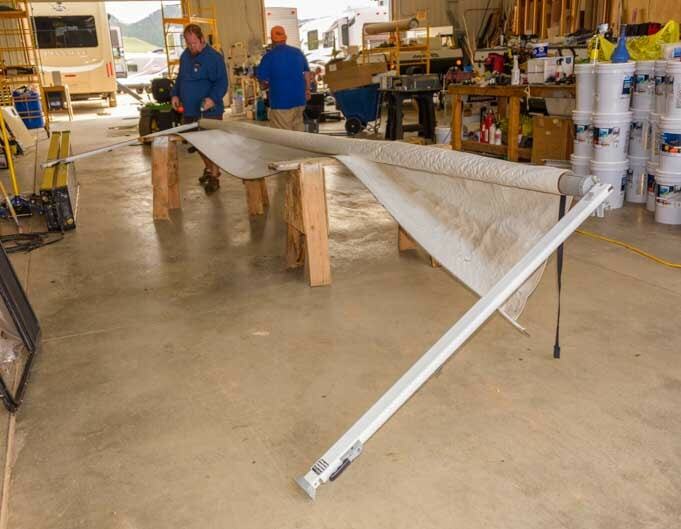 Spraying it with silicone spray will help the awning roll more easily. 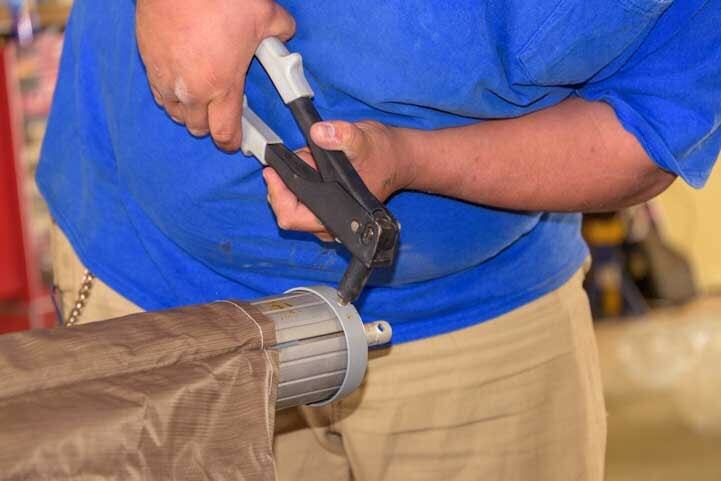 Then the awning fabric was slid our of the roller. Two mechanics slid the old awning fabric out of the track. 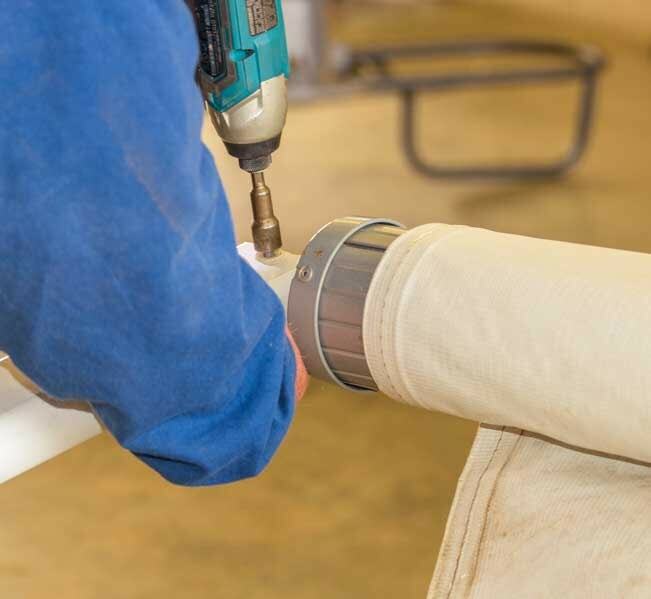 The new fabric was unfolded and laid out in the workshop, and then it was slid into the track on the roller until the fabric stretched the whole length of the roller. The new awning fabric was unfolded and laid out. The new awning fabric will be slid into the track on the roller. The new awning fabric was started in the track on the roller. Spraying the track with a heavy duty silicone spray helped the fabric slide along the track smoothly. Spraying the track with silicone helps the fabric slide more smoothly. Two mechanics slid the new awning fabric along the roller track. 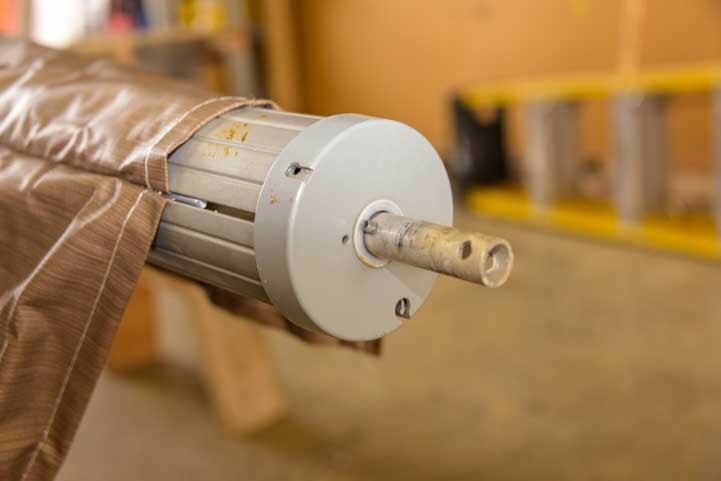 Then the torsion assembly was placed inside the roller and new endcap rivets were installed. The endcap and spring were reinserted inside the roller. Put new rivets on the endcap. The fabric was positioned so it went all the way to the locking end of the awning. At the opposite end a set screw was screwed in to prevent the fabric from sliding off the track. 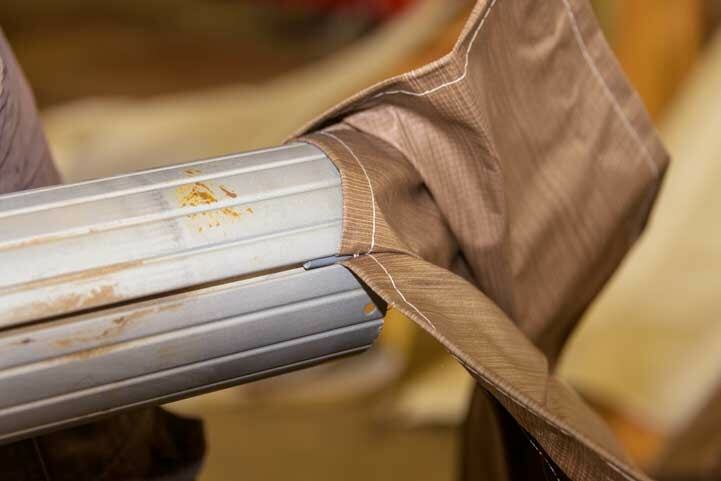 Make sure the awning fabric has been slid all the way to the locking end of the roller. 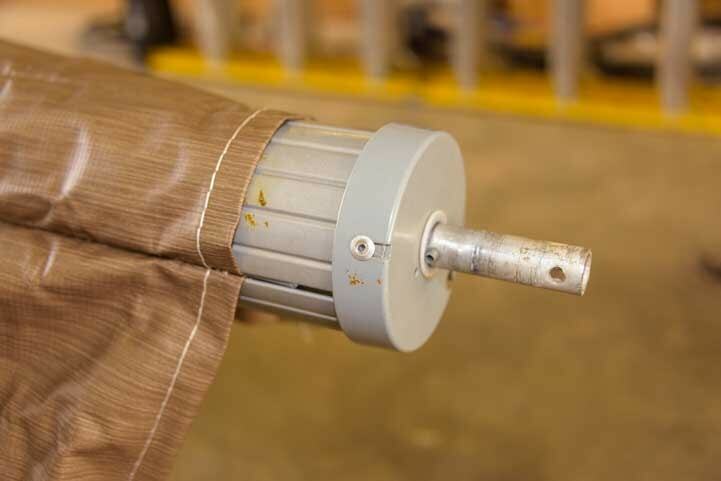 Put a set screw at the non-locking end of the fabric so it doesn’t slide off the track. 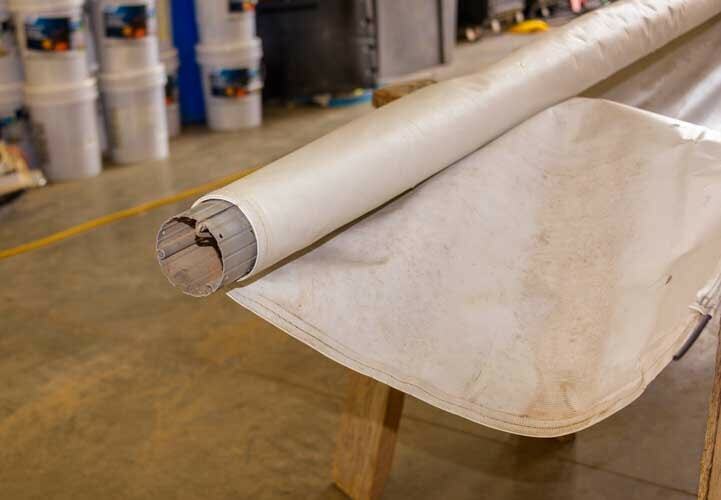 The new fabric was laid out so it could be rolled onto the roller. 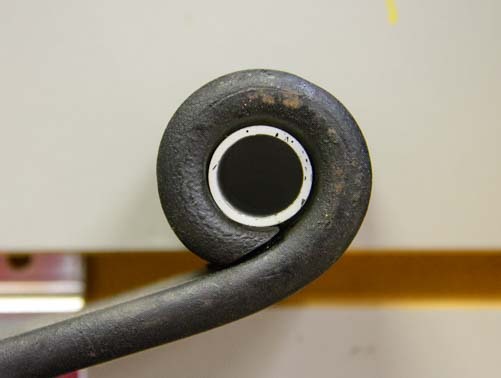 Then a vice grip was used to turn the spring between 15 and 18 times to get the right spring tension. New awning fabric is in place. 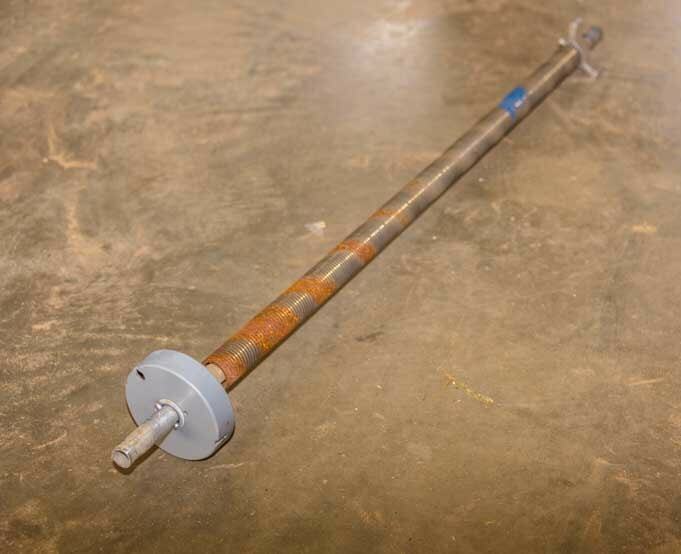 Use vice grips to rotate the spring 15 to 18 times to ge the right spring tension. Then the awning arm was reattached to the roller with a bolt. 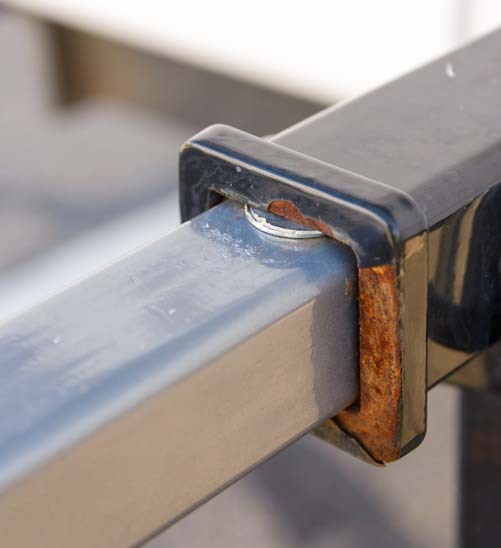 Bolt on the awning arm. Awning arm (non-locking end) is reattached. Back at the trailer, the awning track was sprayed with heavy duty silicone. Out at the trailer spray the awning track with silicone. Then the new awning fabric was loosely wrapped around the roller and the whole thing was marched outside to the trailer. 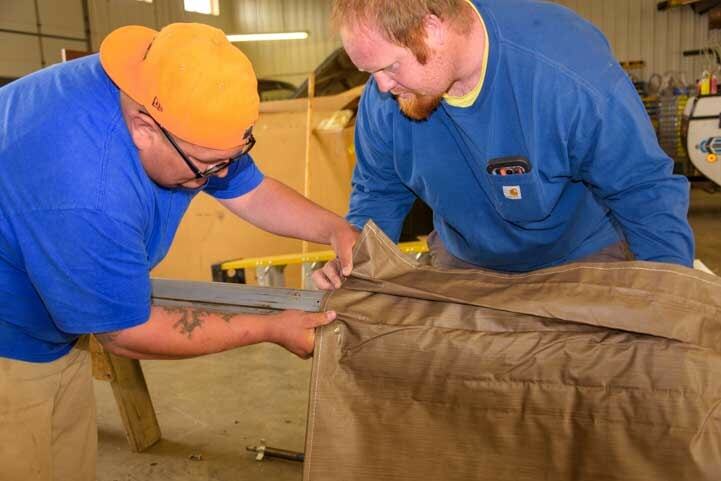 Four guys assisted in wrapping the new awning fabric around the roller a few times. The awning is taken out to the trailer. Our little project supervisor, Buddy, had been watching all the goings on through open big shop door from a safe distance out by the trailer. When the awning and its new fabric were brought out to the trailer, he backed up as far as he could into the parking lot to give the guys room to work! 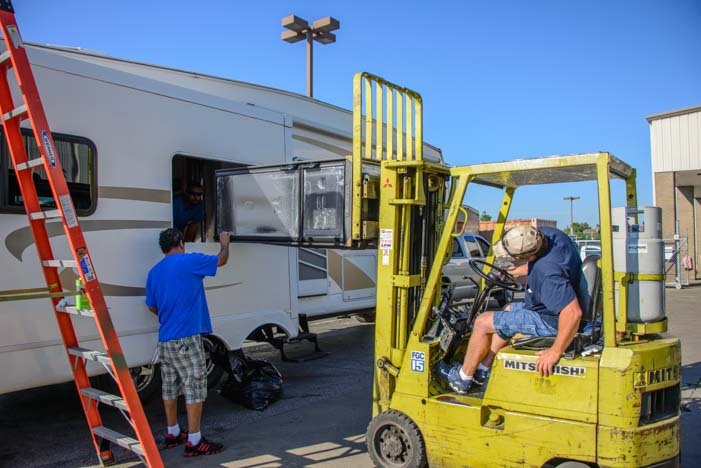 Using ladders and reaching overhead, four guys maneuvered the awning fabric into the track on the trailer and slid it all the way to the front end of the track. This is where having lots of hands can help. The awning fabric is slid along the track on the side of the trailer. 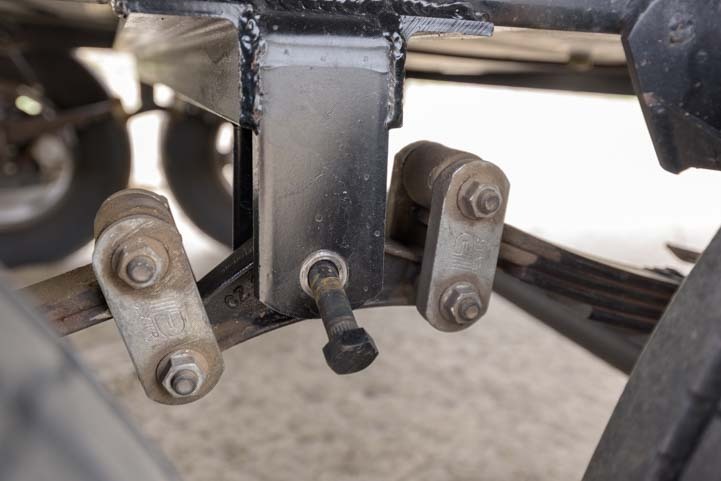 After installing the awning on the trailer, the mechanics noticed that the two feet that held the bottoms of the two awning arms had each developed hairline cracks. So, they replaced each foot. The feet of both awning arms had developed small cracks, so they were replaced. The last step was to test the awning by rolling it all the way out and then all the way in again. 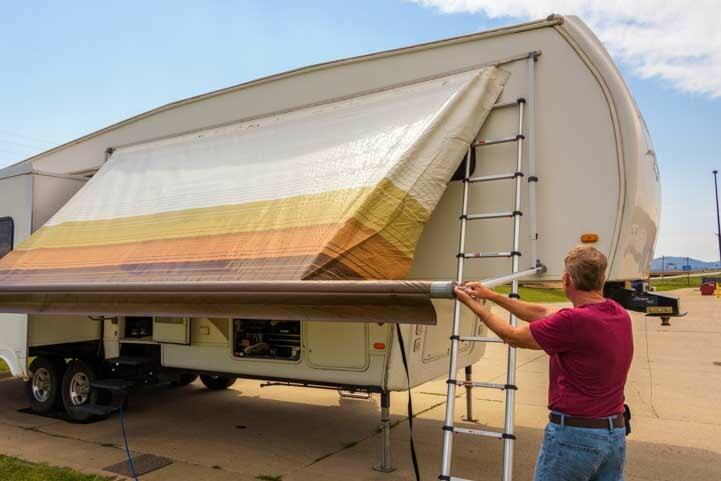 Test the awning to make sure it rolls all the way out and all the way in again. Ta Da!! A job well done. The whole project took 45 minutes from start to finish. 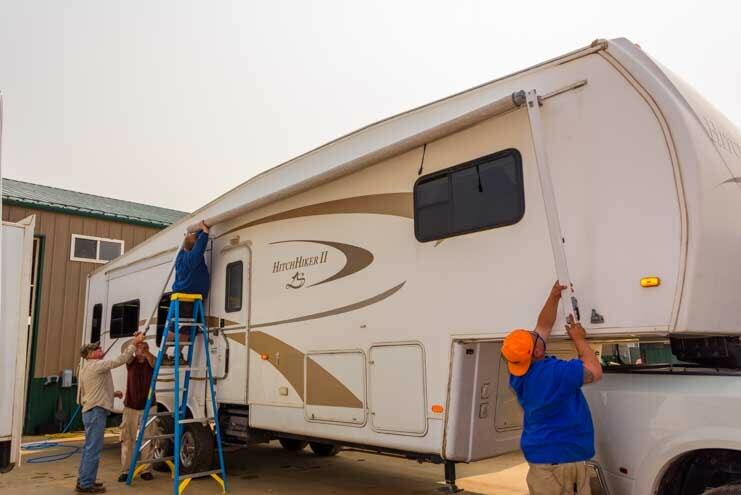 Now that we’ve seen how a manual RV awning gets installed, Mark is confident he could do it without going to an RV repair shop as long as he had some extra hands for sliding the awning fabric on/off the trailer awning track and on/off the roller track. 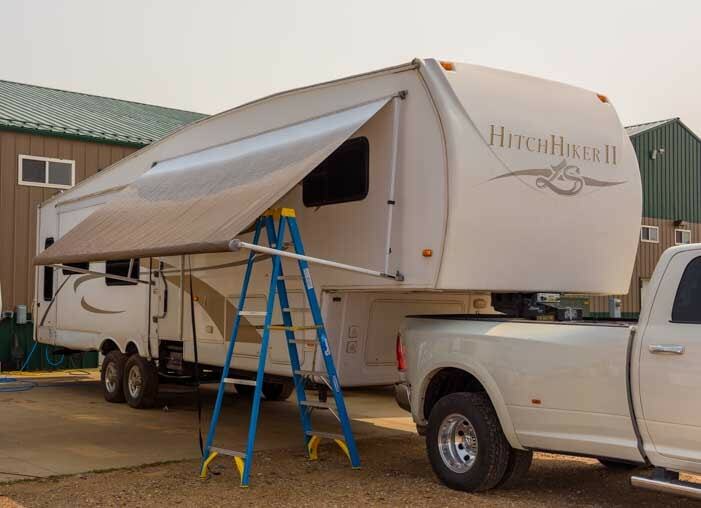 Side note: If you have a manual awning, it is really important that you use some kind of velcro straps or bungee cords wrapped around the awning arms as extra security to keep the awning from accidentally opening while you are traveling. Our photo above doesn’t show them, but we have used these awning straps ever since we bought the trailer. 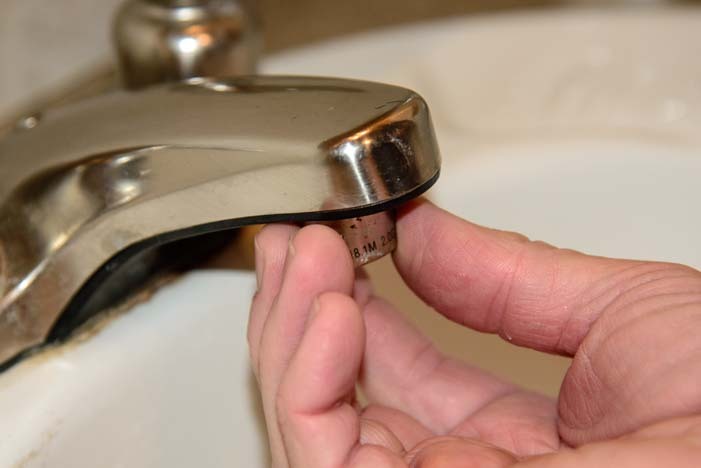 The effects of hard water on RV sinks, faucets and drains can be an ongoing problem for RVers. 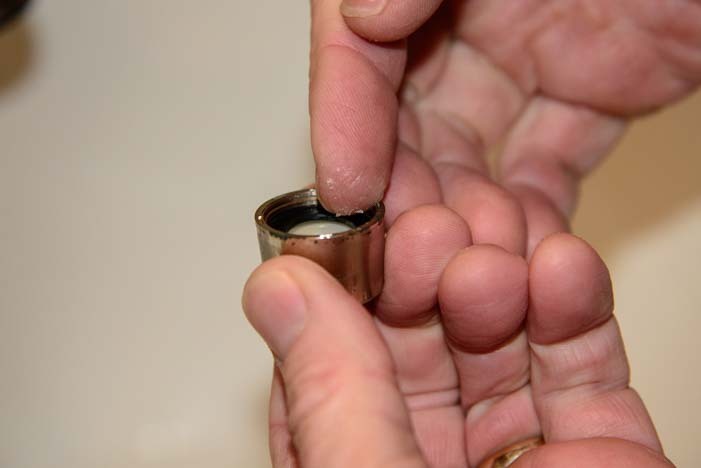 This page describes a few tips for how we remove these pesky mineral deposit buildups from our bathroom and kitchen sinks in our fifth wheel trailer and keep the water flowing smoothly in our shower wand and RV toilet rinse sprayer. 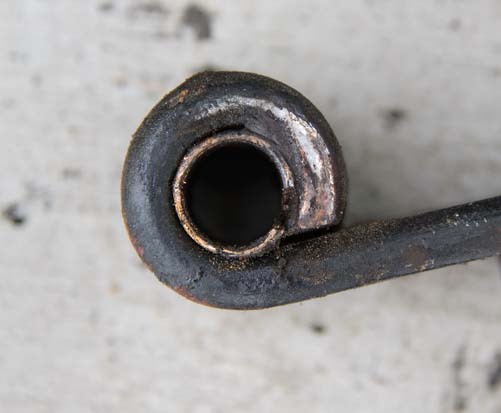 RV plumbing tips for removing mineral deposits and cleaning RV faucets and drains. We like the water to flow freely in our RV vanity sink faucet, kitchen sink faucet and in the shower and RV toilet sprayer wands, however, periodically these faucets begin to spray water in weird directions because their inner workings have gotten clogged up by mineral deposits from the hard water. 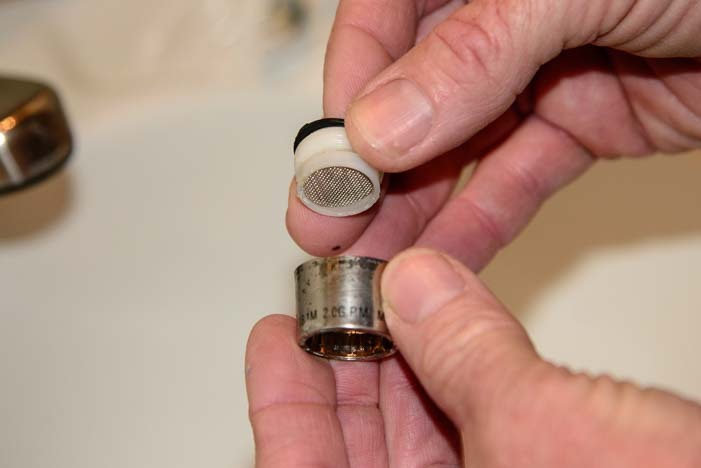 In our bathroom vanity, our first step is to remove and clean the screen filter in the faucet. 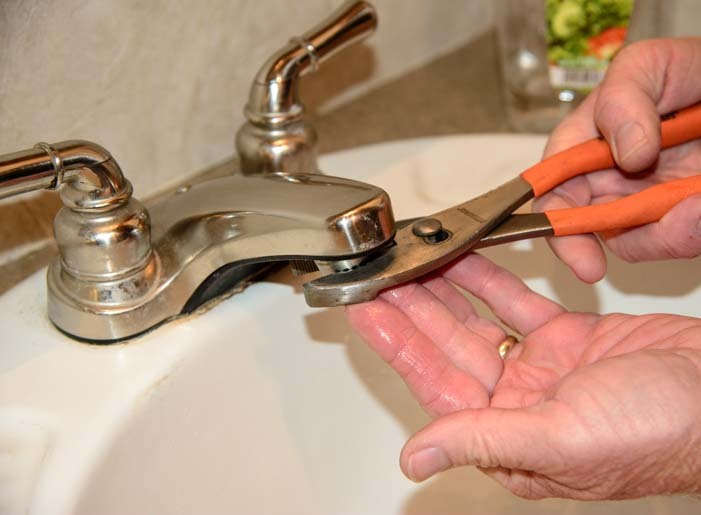 Sometimes the faucet tip can be unscrewed by hand, but if we’ve let it go too long, we have to use a pair of pliers to break the faucet tip free due to corrosion that makes it impossible to unscrew. Then we unscrew the entire screen assembly from the faucet. The faucet tip unscrews from the faucet. Ugh… the screen is pretty dirty. No wonder the water comes out funny! This time the screen was very corroded. We remove the corrosion and mineral buildup by putting all the pieces in a bath of white vinegar for 20-30 minutes or so. 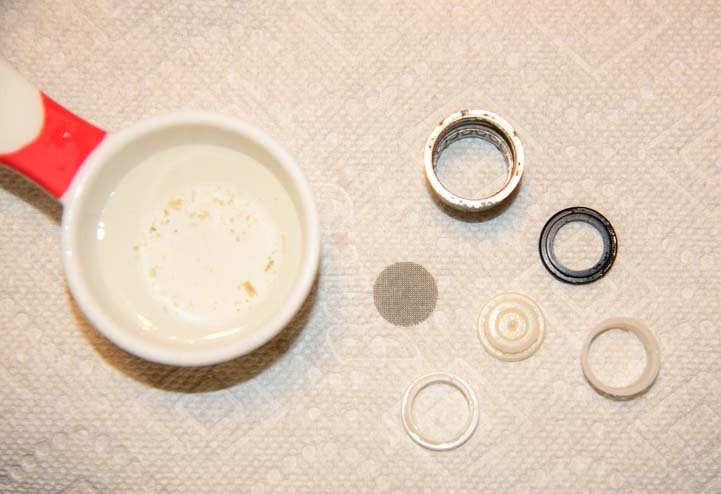 Prior to putting the pieces in the white vinegar bath, it is a good idea to make note of the order that these parts go into the faucet assembly! After noting how the pieces go together, soak them in white vinegar. After the bath, the bits of corrosion can be seen in the white vinegar! Here are all the pieces. You can see the dirt that came off in the vinegar bath! 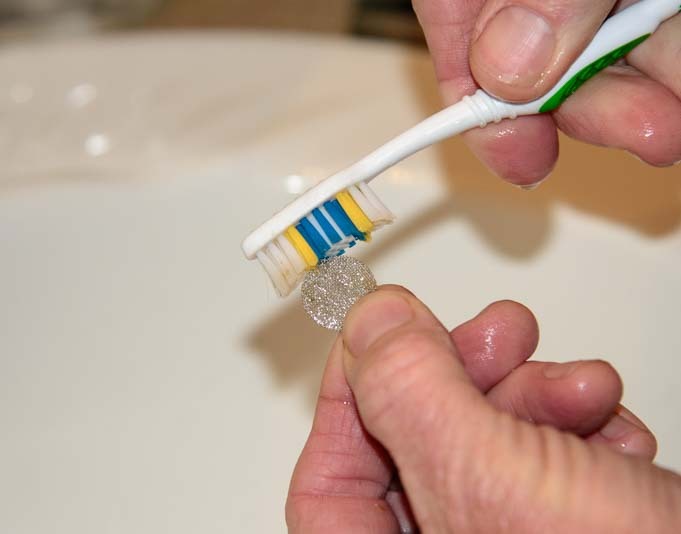 Using an old toothbrush, we scrub each piece until it is clean. Use a toothbrush to get the screen totally clean. Scrub all the parts with the toothbrush. Then we reassemble the pieces in the correct order and orientation. 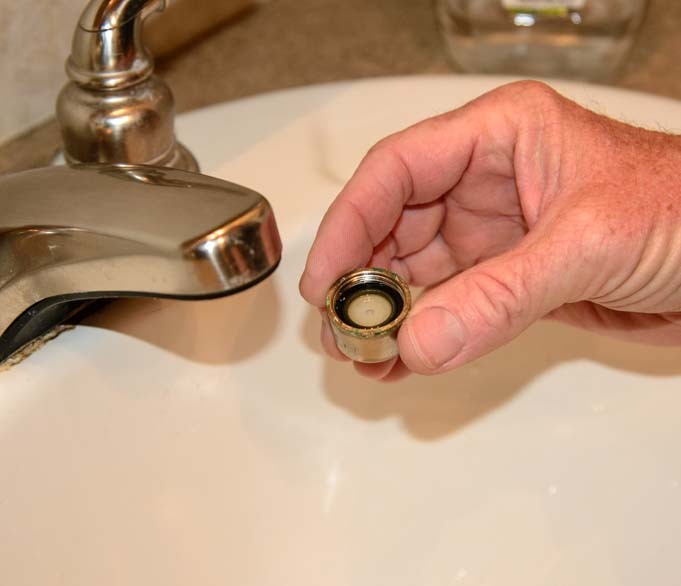 To make it easier to remove the faucet tip the next time we do this job, it helps to grease the threads with a marine PTEF lubricant prior to screwing the assembly back onto the faucet. Lubricating the threads makes it easier to unscrew next time! Screw it back into the faucet. Ta da! Now the flow will be smooth and full. 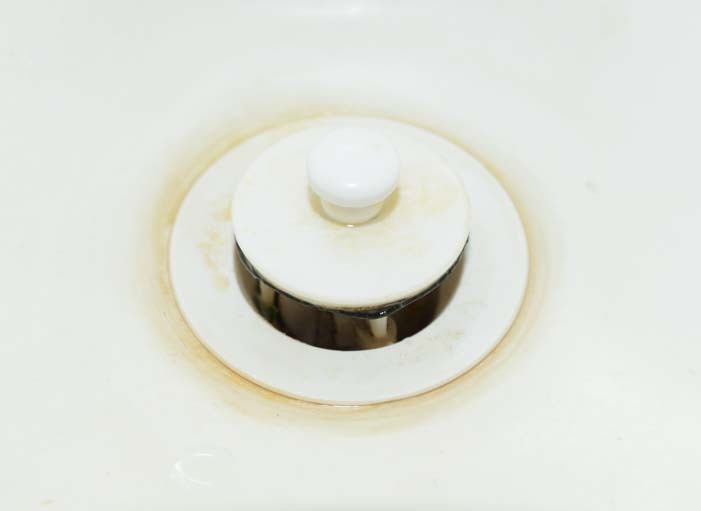 Our trailer has white plastic sinks in the bathroom and kitchen, and these sinks often develop a skanky brown ring around the sink drain. For years, we relied on Comet to clean these sinks. We sprinkled it on the entire sink, let it sit for a bit, and then scrubbed. We recently discovered that Baking Soda is just as effective!! The fantastic thing about Baking Soda is that it is non-toxic. This is wonderful not only for our gray water holding tanks but also for the RV dump stations as well as the septic fields and municipal waste water treatment systems that are downstream from them. White plastic RV sinks are prone to getting ugly stains. We simply sprinkle it on the sink and then scrub the sink with a damp Scotch-Brite scrubbing pad. Sprinkle the baking soda in the sink and scrub the stains with a damp scrubby pad. What a great result — a wonderfully squeaky clean sink! 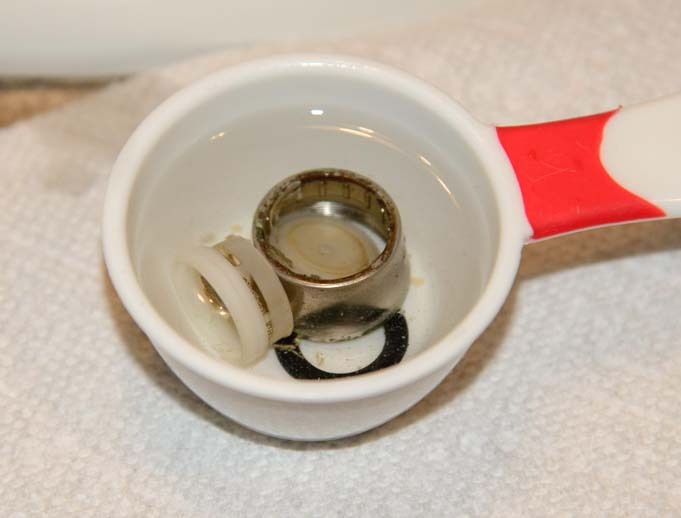 The drain plug also gets gummy, and we use an old toothbrush to scrub it clean with either baking soda and/or Murphy’s Oil Soap (a handy all around biodegradable cleanser). 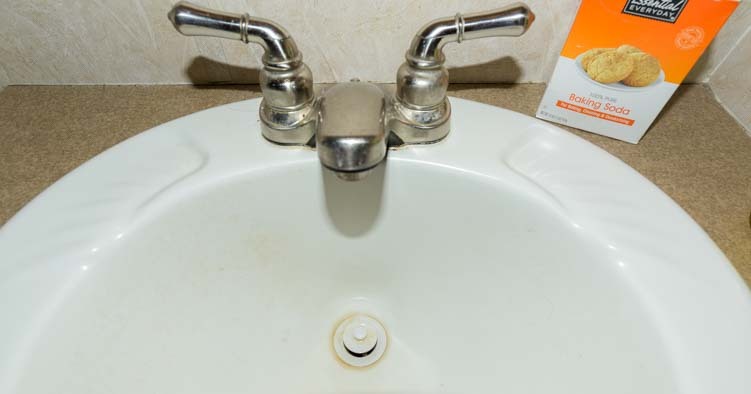 In an RV that is used for dry camping a lot, like ours, the bathroom vanity sink drain can get really gross really quickly because in an effort to conserve fresh water not much clean water gets flushed down the drain. 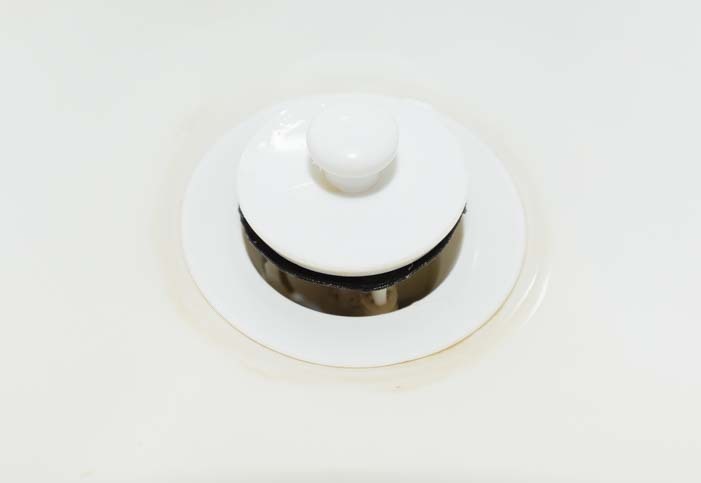 This can result in foul odors in the sink drain, and it’s pretty unsightly too. So, we do two things. 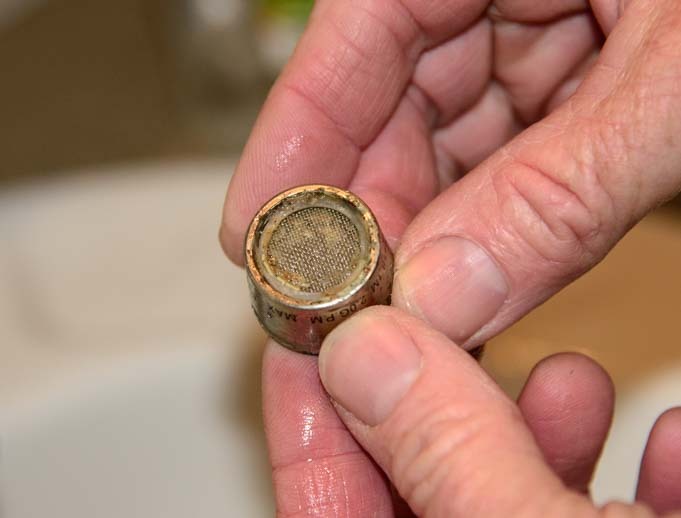 First, we scrub the inside of the bathroom sink drain with an old toothbrush. To get a longer reach down the drain, we taped our toothbrush to an old tent stake we had lying around. Anything long and narrow will work. 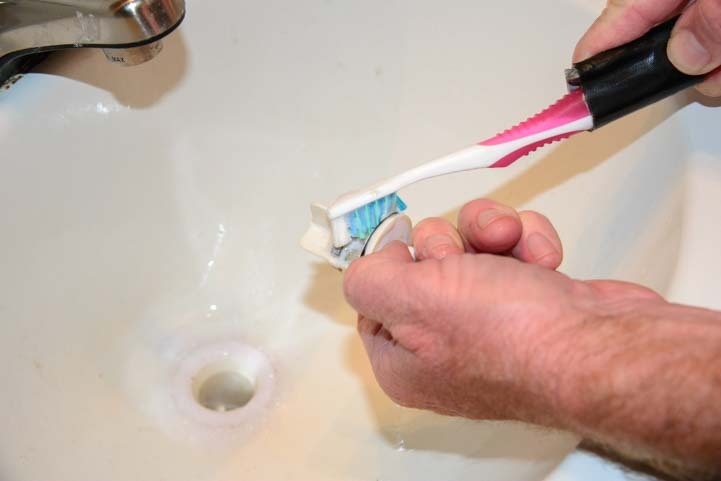 Tape an old toothbrush to a long stick to reach deep down the RV sink drain. Scrub inside the sink drain. We also scrub the sink drain plug. 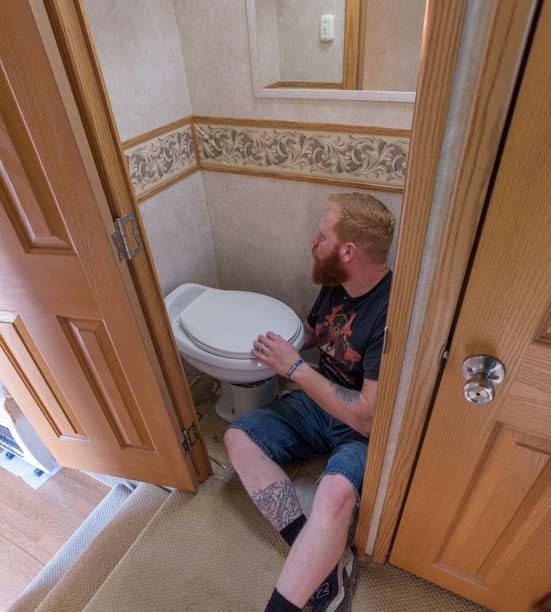 Second, to keep the RV bathroom sink drain fresh smelling, we use Happy Camper Holding Tank Treatment which we’ve found is a particularly good deodorizer. We put scoop of powder in an old water bottle, fill it up with water and shake it well (the bottle gets warm as the enzymes get activated! ), and then pour it down the drain. 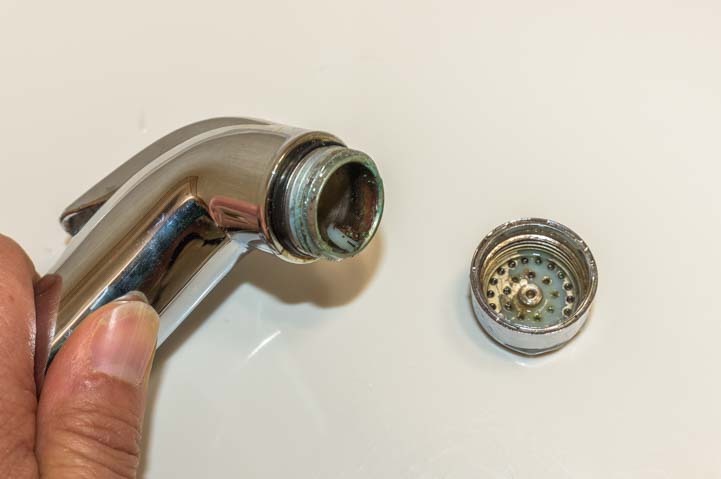 Most of it goes into the gray water tank, but a small amount stays in the bathroom sink drain p-trap and does its magic there, killing off the offensive odors. 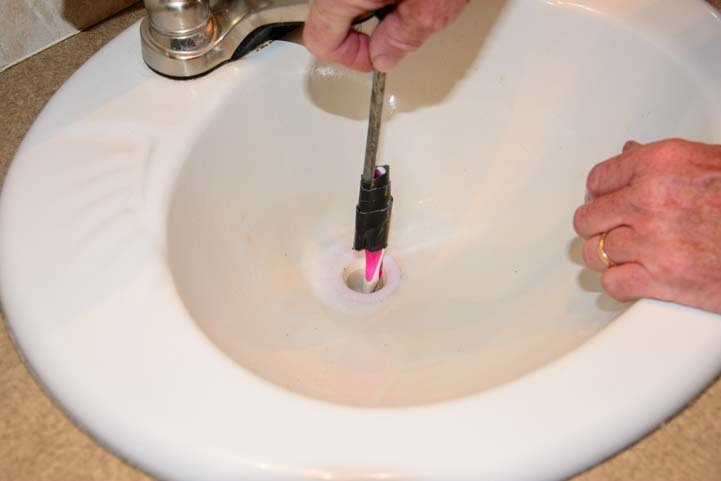 Scrub the sink drain plug with a toothbrush. 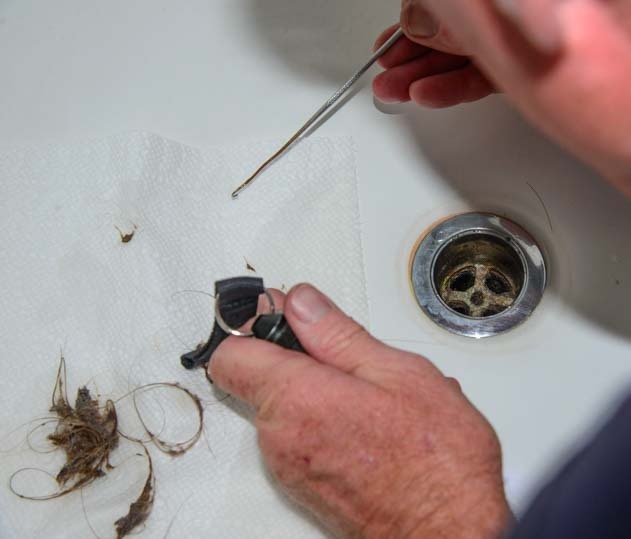 To keep our RV shower in tip-top shape, we clean the drain there as well. 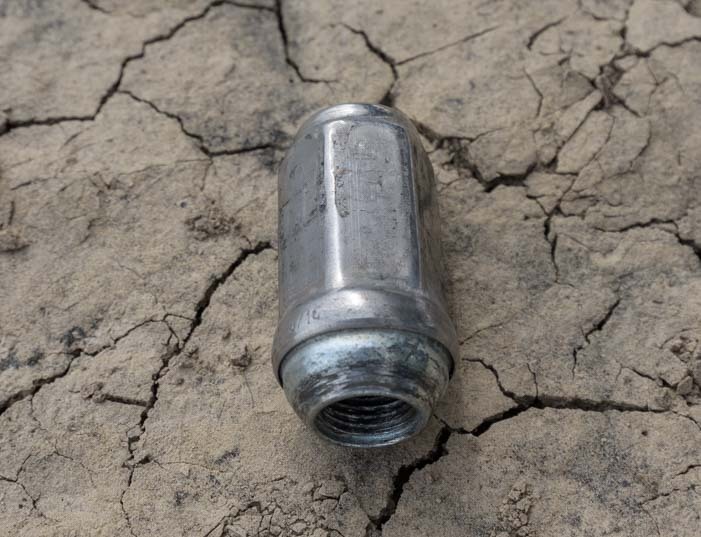 The biggest problem in our RV shower drain isn’t foul odors, because the shower drain gets flushed with lots of water everyday. Instead, the challenge with the RV shower drain is accumulated hair. In a house, it’s easy enough to use a powerful cleanser like Drano to clean out any clogs caused by hair, but we don’t want strong chemicals like that sitting in our gray wastewater holding tank. Afterall, we want the enzymes and bacteria in the Happy Camper and Unique RV Digest-It holding tank treatment products we use to thrive and go to work breaking things down! So, we use a long spring hook (and flashlight) to pull the hair out. It just takes a few minutes and then the drain is clear. 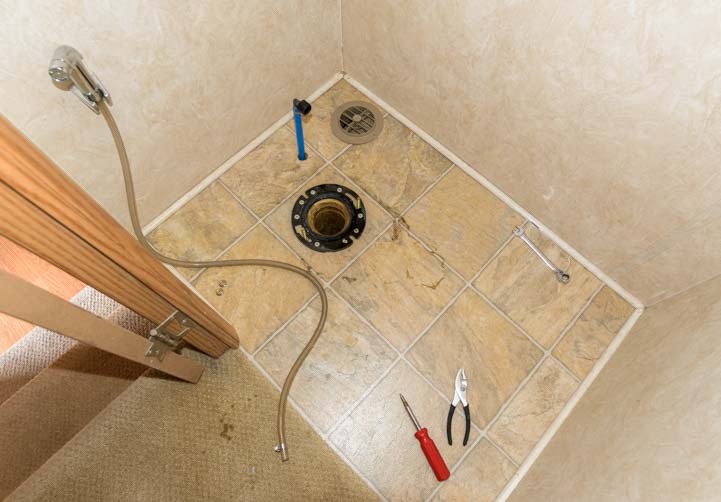 Some RV shower stalls may have drain components that can be removed for cleaning. Ours doesn’t. 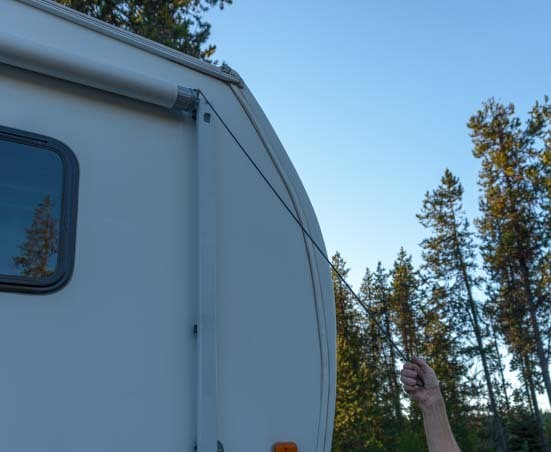 Use a spring hook to pull hair out of the RV shower drain. 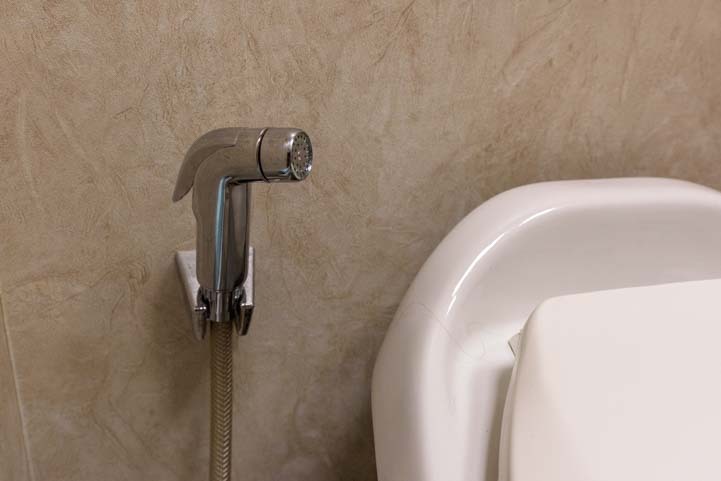 Periodically, the RV shower wand gets crudded up with mineral deposits just like our RV sink faucets do. Again, we rely on white vinegar to clean up the deposits clogging the spray holes in the shower nozzle. 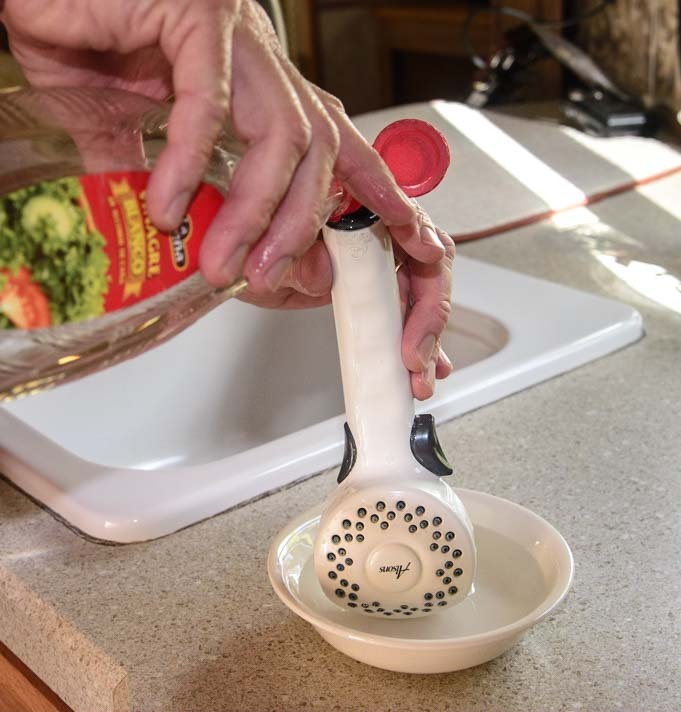 First, we pour the white vinegar through the shower wand to let it soak from the inside. The RV shower wand can be cleaned with white vinegar. Then we soak the shower wand’s face in a bath of white vinegar. Put the RV shower wand face down in a white vinegar bath to clean all the little holes. If we’ve let a little too much time pass, we’ll also use a toothpick to clean out each hole in the shower head. We use bamboo toothpicks because they hold up well in water. Ordinary wooden toothpicks tend to disintegrate when they get wet. A scribe also works well. The before-and-after difference in the flow of water through the shower wand is startling. 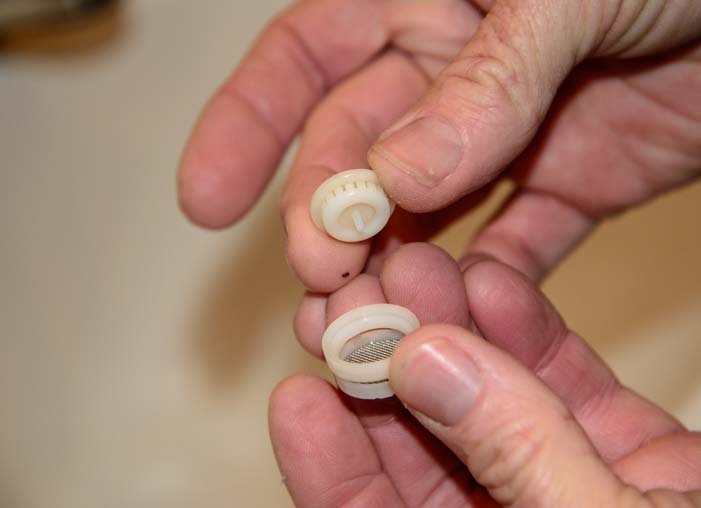 When half of the little holes are blocked from mineral deposits and the other half have an impeded flow, the water can feel like needles on your skin. After cleaning the wand, it is more like a waterfall. 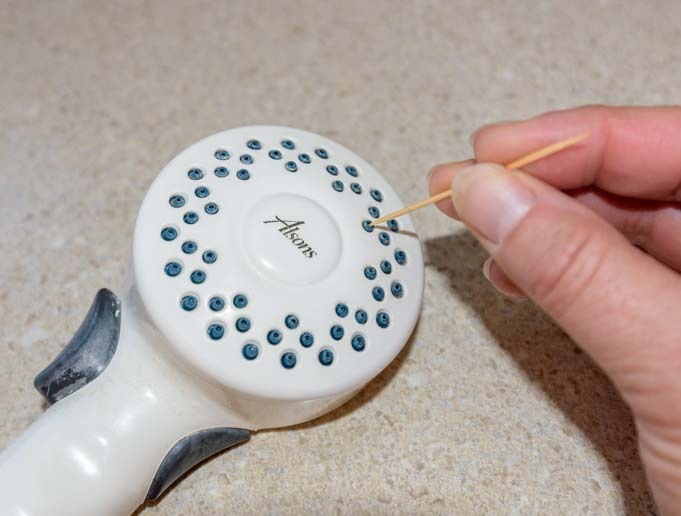 Use a toothpick or scribe to clean each hole in the shower wand. Lots of RVers love the Oxygenics RV shower head. We don’t use it because it doesn’t work well with the low water pressure we use to conserve water since we dry camp every night, but for RVers who get water hookups a lot, these shower heads are extremely popular. Of course, in hard water areas, these shower heads will need periodic cleaning as well. 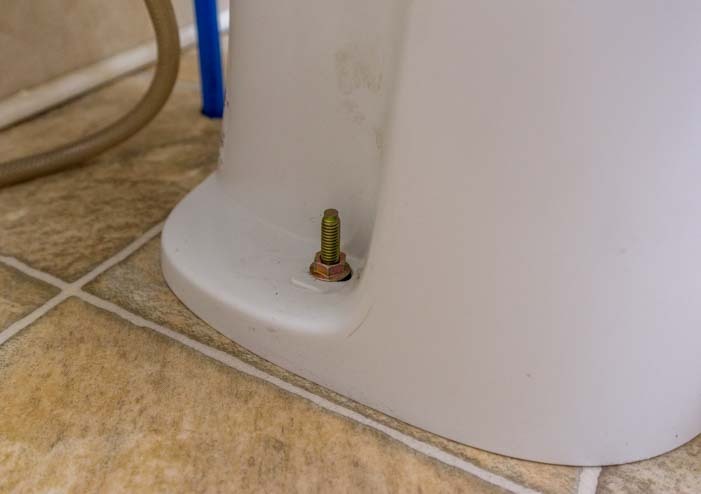 The RV toilet bowl rinsing wand is also subject to corrosion from mineral deposits, and after a while when we go to rinse the toilet bowl we find the water flow from the sprayer is restricted and funky. The RV toilet sprayer wand gets clogged with minerals too. Again, it’s easy to unscrew the end of the toilet spay wand, put it in a white vinegar for 20-30 minutes, scrub it a bit with a toothbrush, and then put it back on the wand. Unscrew the tip of the toilet rinsing wand and soak it in white vinegar to clean the holes. 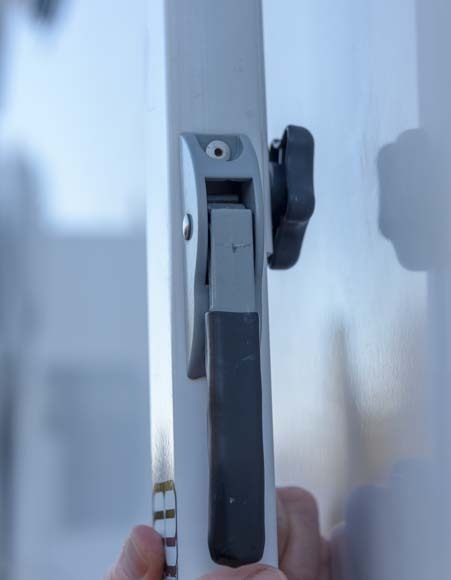 As an aside, if you have energy leftover after cleaning all your RV sinks, faucets, drains and spray nozzles, a spray bottle filled with a water and white vinegar mixture is super for washing the windows. As I wrote this, some flies got in our trailer and Mark started spraying them when they landed on the window next to him using a spray bottle filled with water and white vinegar. Besides slowing them down and killing them, he was really impressed with how clean the window was when he finished! 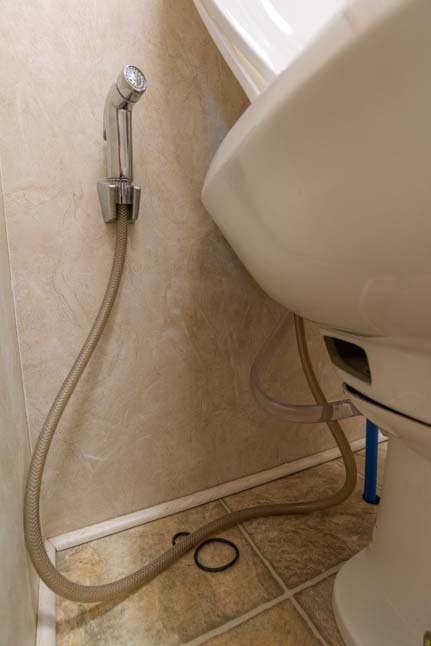 So, these are a few of the things we do to keep our sinks and drains flowing smoothly in our life on the road in our RV. We hope they help you too! 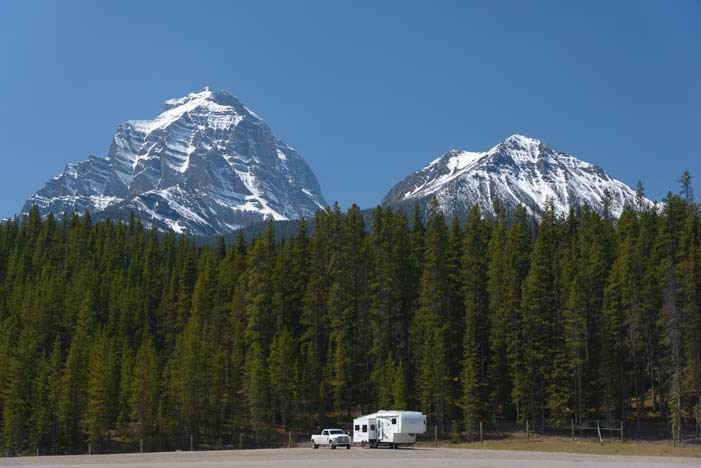 White vinegar – A great non-toxic cleanser for RVers. Use in place of bleach. 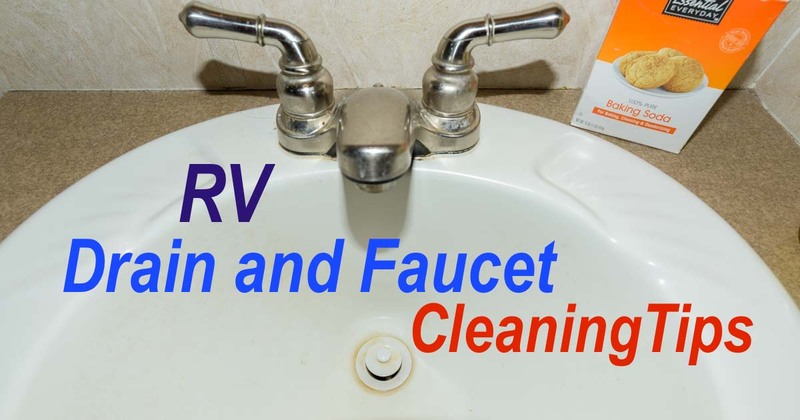 Baking Soda – Clean RV sinks and drains. Use in place of Comet. Murphy’s oil soap – A good biodegradable soap. Use in place of chemically harsh liquid soaps. Bamboo toothpicks – To clean the stubborn holes in a shower wand or RV toilet rinsing spray wand. 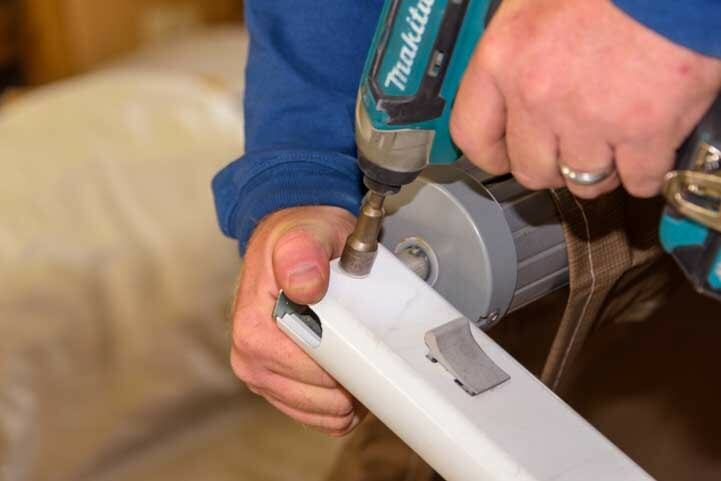 Scribe – Another way to clear out the shower wand holes. 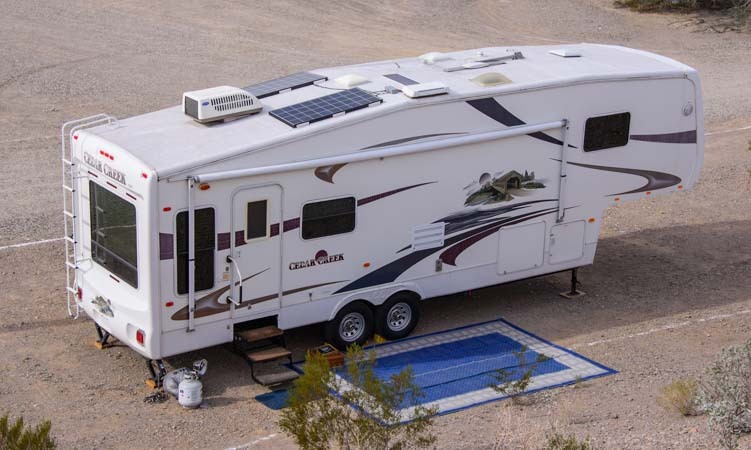 Is RV solar power affordable? 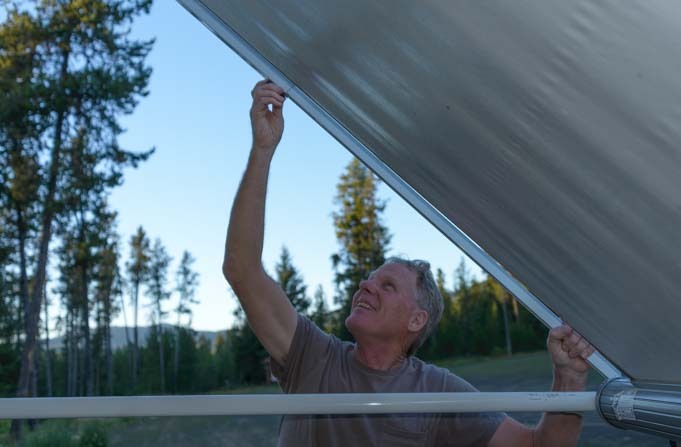 Or is installing a solar power system on a motorhome or trailer — or even on a sailboat — just too darn expensive to be cost effective? We never thought this question would be hard to answer until recently. 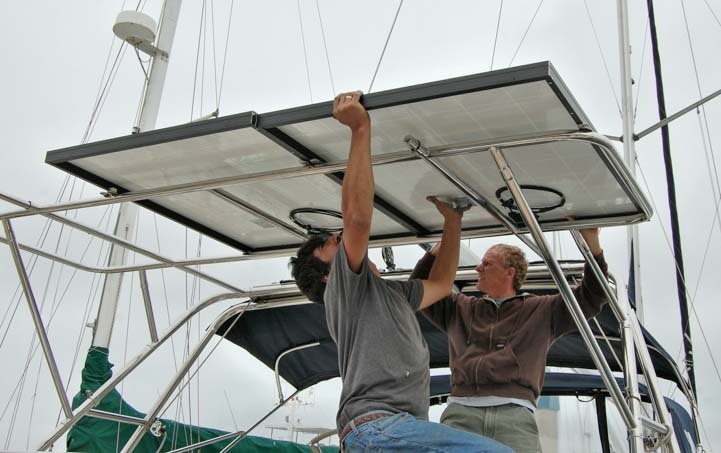 Can a solar power installation on an RV or sailboat pay for itself? Ever since we installed our first (very small) solar power system on our first full-time RV nearly ten years ago, we’ve been excitedly telling people it is a very affordable do-it-yourself project for anyone with some mechanical and electrical knowledge. And for those who can’t turn a wrench, it shouldn’t be that much more. Our first 130 watt solar power system cost us about twice as much as the same system would today, but even at that high price, we felt it was dollar-for-dollar an equal value to buying a Yamaha or Honda 1000 generator. Best of all, once a little system like that was installed, it was a whole lot less noisy, expensive to operate and complicated to use than a generator would be. At today’s super cheap solar prices, that little solar power system is even more valuable compared to one of those nice Japanese portable gas generators than it was 10 years ago! Installing solar power can be a DIY project if you’re handy. 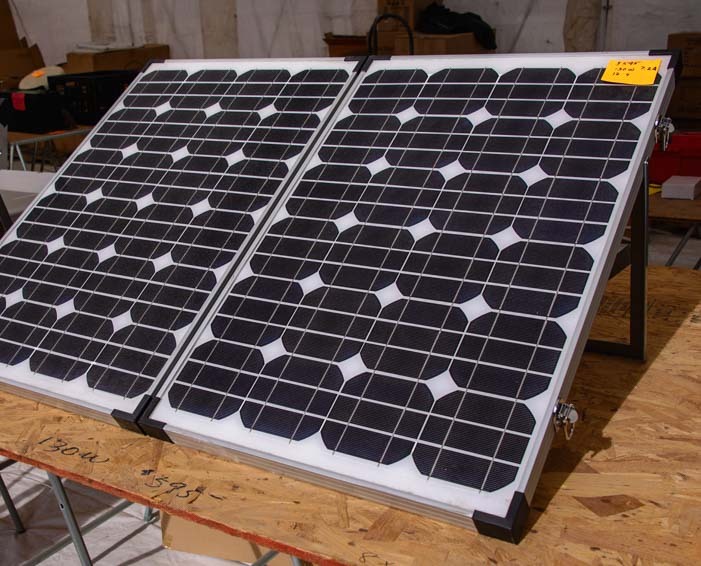 Recently, however, we’ve heard some crazy prices being quoted for installing solar power systems on RVs. 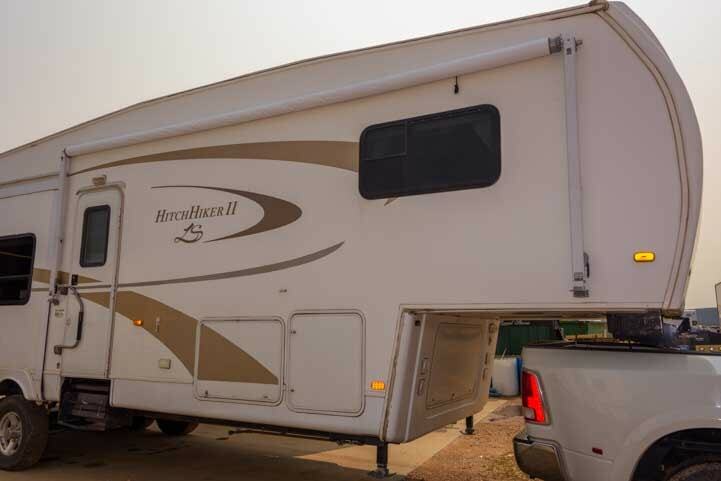 We met one couple with a gorgeous brand new DRV Suites fifth wheel who were quoted $13,000 for a solar power installation. Not long after that, we read an article in a popular RV magazine describing a $12,000 solar power installation on a fifth wheel. Yikes!! These are outrageous prices!! We sure hope no one is finding they have to spend that kind of crazy money to get a solar power system installed on their trailer or motorhome or sailboat. 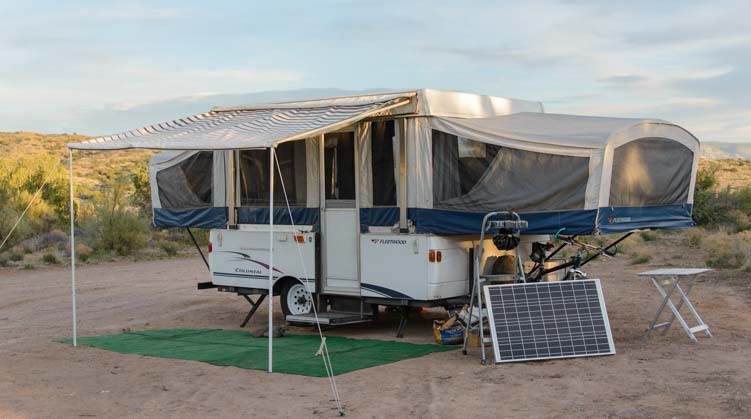 We’ve got oodles of articles on this website that go into the nitty gritty details of things to consider when designing and installing a solar power system on an RV or a boat (located HERE). However, all that theory aside, it’s not all that complicated. Here are three solar power “packages” — with approximate prices — that will do the trick whether you’re a part-timer or full-time RVer. 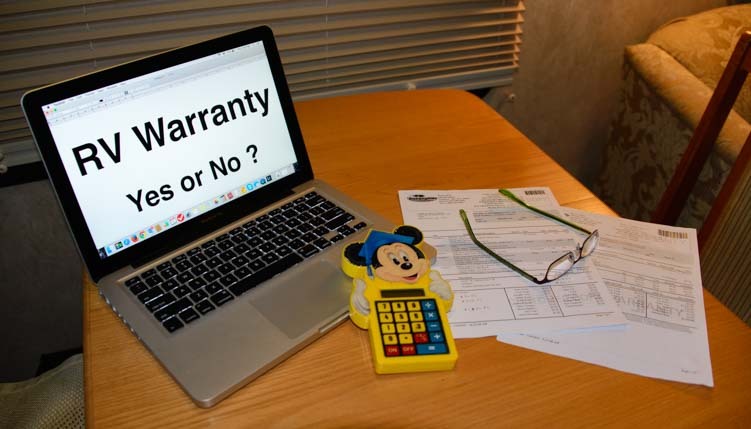 Although it is possible to buy “pre-packaged RV solar power kits” online, we suggest hand selecting the components you want so that just in case any individual item has a problem it can be returned easily. We’ve heard of cases where people bought a pre-packaged solar power kit online and then had problems returning a broken part because they had to return the entire kit — solar panels, charge controller, cables and all — just because the one item wasn’t working right. 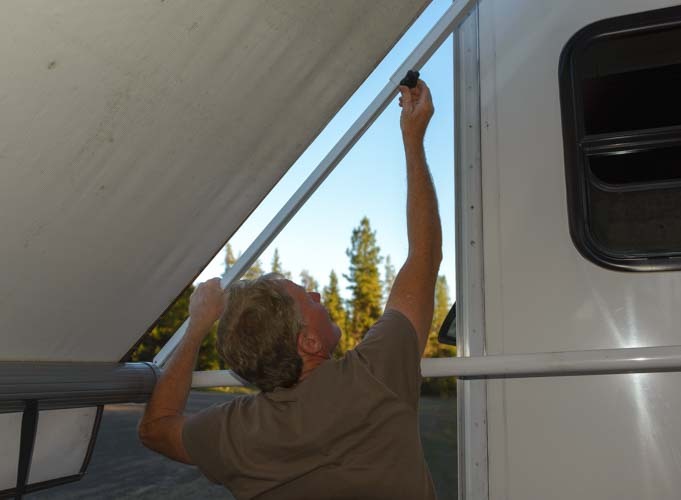 For part-time RVers, installing solar on the roof isn’t a requirement. The following is essentially what we put on our roof and what we camped with off the grid every night for a year when we started. The brands are not exactly the same, but these components are highly rated and will do the trick for anyone that wants a roof-mounted solar power system on their motorhome or trailer. This kit includes both a solar battery charging component and an 110 volt AC power component provided by an inverter. 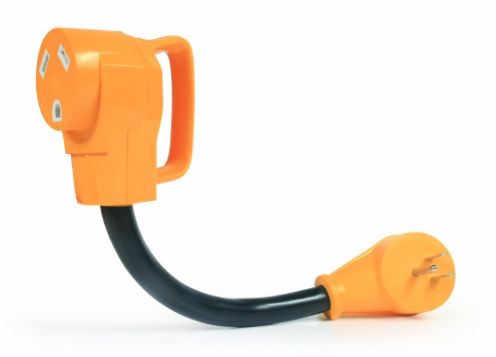 If you don’t understand the distinction, please see our post: RV Solar Power Made Simple. 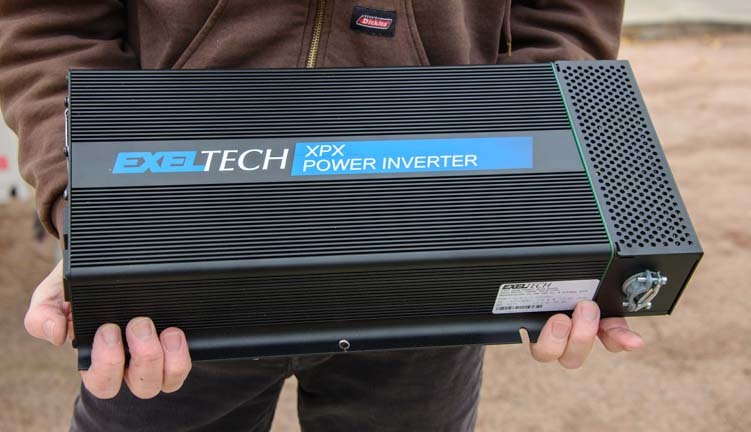 The simplest inverter installation is to connect the inverter to the batteries using heavy duty cables and then to run an ordinary (but long) power strip (or two) from the inverter to somewhere convenient inside the rig. Rather than using the wall outlets in the rig, just plug the AC appliances into the power strip as needed, taking care not to operate too many things at once and overload the inverter. Prices always change, so check the links to see the current prices. The nice thing about this kit is that it is easily expandable. If a second or third solar panel is eventually desired (to double or triple the size of the system to 300 or 450 watts, for another $200 or $400), those panels can be purchased at a later date. At that point the solar charge controller can also be replaced with a bigger and more sophisticated charge controller (for $600). A portable solar power kit that folds up and can be carried like a suitcase is an awesome solution for weekenders, vacationers and seasonal RVers. A really nifty alternative for anyone that isn’t super skilled with tools or that’s a bit spooked by electrical things, is a portable solar power kit that folds into a suitcase. 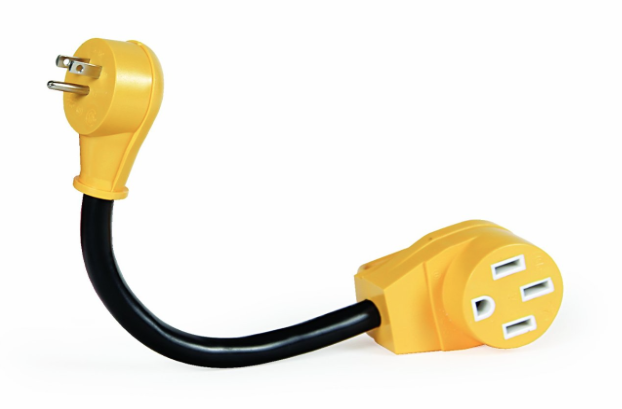 These come with two matching solar panels, battery cables with alligator clips, and a panel-mounted solar charge controller. The solar panels are hinged together and can be folded towards each other. A handle on the side of one of them makes the whole thing easy to carry and store like a suitcase. The advantage of a portable suitcase solar kit like this is that it is self-contained. 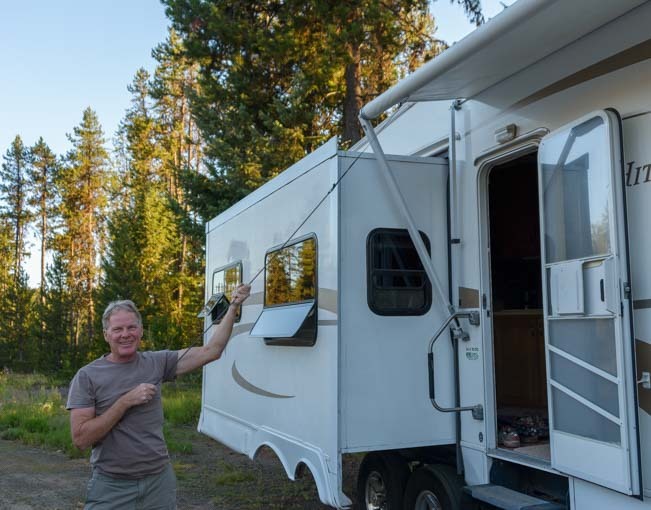 If you think you might upgrade to a different RV soon, then there’s no loss in investment when one RV is sold and another is purchased. Also, if you decide to install a roof-mounted system at a later date, the suitcase solar panel kit can be sold to another RVer. 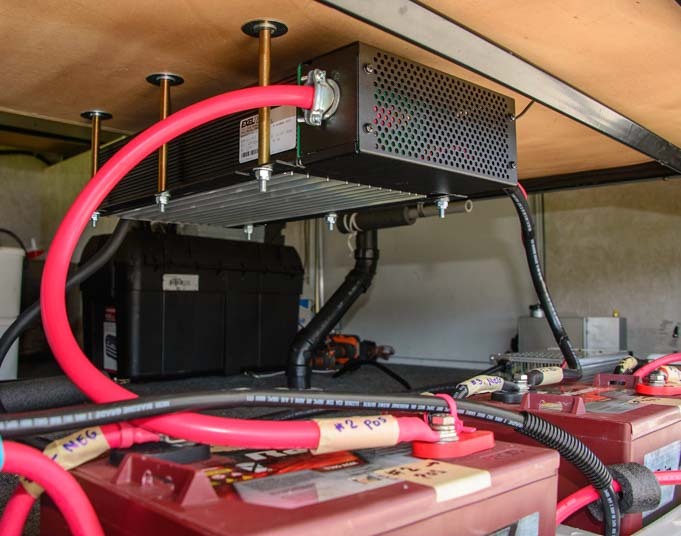 As for the inverter, heavy duty cables and power strip, they are included here just to round out the package so you have AC power in the rig as well as the ability to charge the batteries just like the “small solar power kit” described above. Installing solar panels on tilting brackets is popular, but only necessary in mid-winter. We’ve never done it. 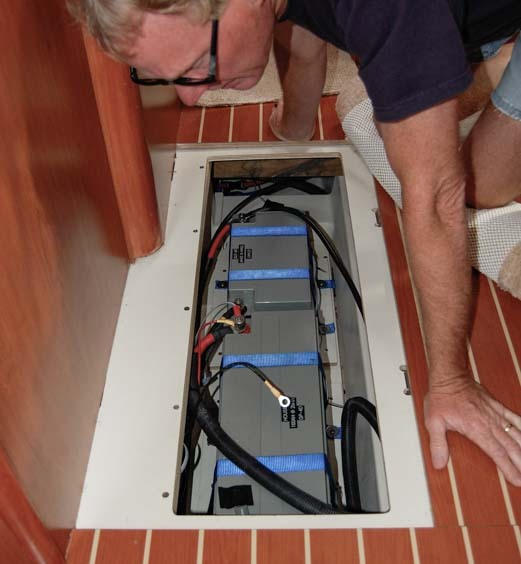 With a big RV solar power installation, it is likely that the RV’s house battery bank will need to be upgraded or replaced too, so this package includes a “replacement” AGM battery bank. The Magnum inverter is an inverter/charger that has a built in transfer switch, making it very straight forward to wire the inverter into the house AC wiring system so you can use the standard wall outlets in the rig rather than plugging things into a power strip. We’ve been living exclusively on solar power since we started this crazy traveling lifestyle in 2007, and this system is larger than any system we’ve ever had on a boat or trailer. So it ought to work just fine for anyone who wants to RV full-time and do a lot of boondocking. 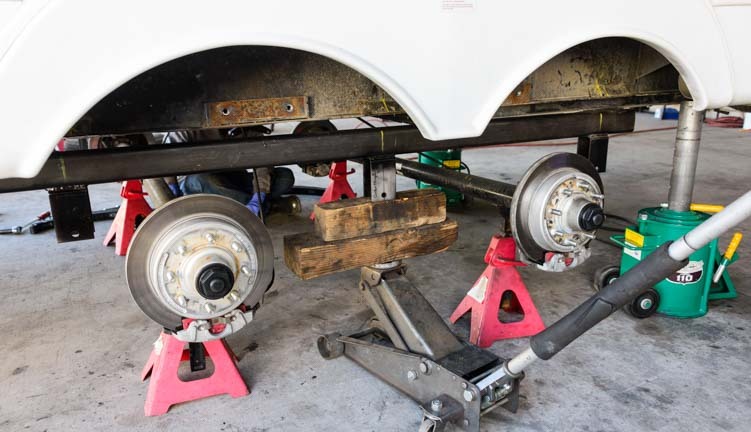 If you are not a DIY RVer, you’ll need to budget for the installation labor too. As a very rough estimate, I would allow for $500-$1,000 for a small system installation and $1,500-$2,500 for a big system installation. 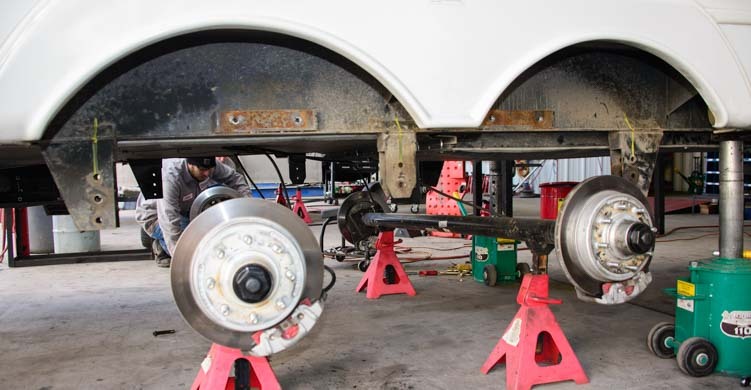 The variations in labor costs will depend on how difficult it is to work in your rig, how hard it is to mount the various components and run the wires from roof to basement, and whether or not you choose to have the batteries upgraded or replaced. RV park and campground prices are all over the map, but assuming that the average cost is $25 per night for a site with hookups if you don’t take advantage of monthly discounts or $15 per night if you do, these systems can pay for themselves in anywhere from 18 camping days to 14 months, depending on what size system you buy, whether or not you do the installation yourself, and how you typically camp. Of course, this assumes the rig is equipped with a refrigerator that can run on propane and that if air conditioning is needed an alternative power source like a generator is used. As with everything in the RVing world, starting small and cheap is the best way to go. 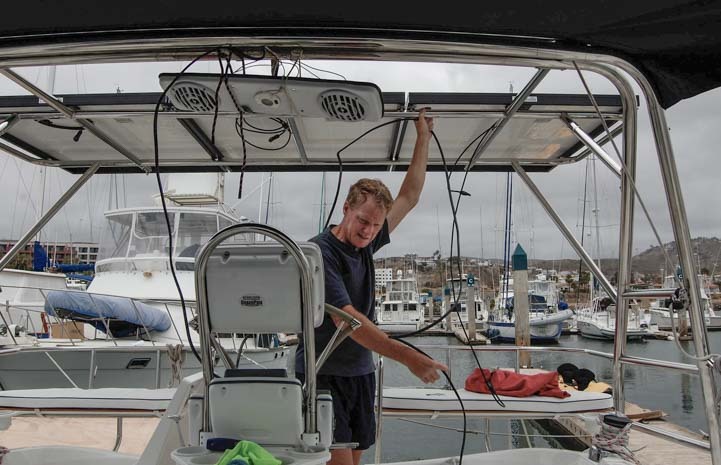 Installing solar power on a sailboat has its own set of challenges. 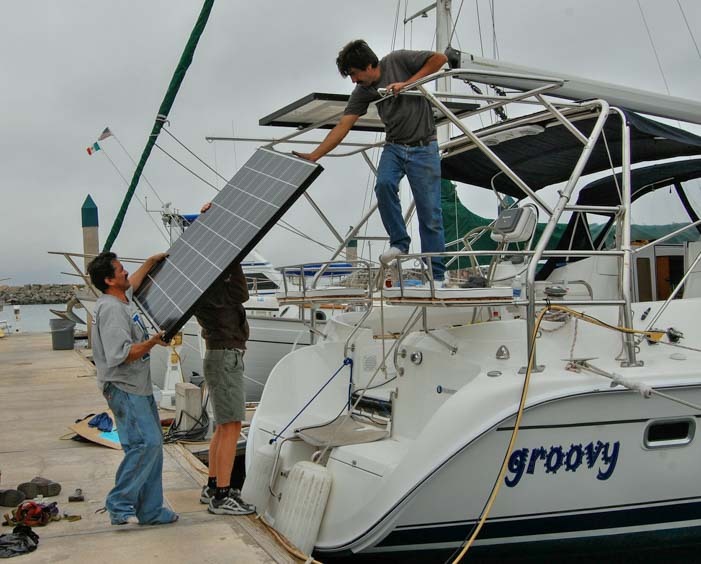 We have installed three different RV solar power systems and one solar power system on a sailboat. 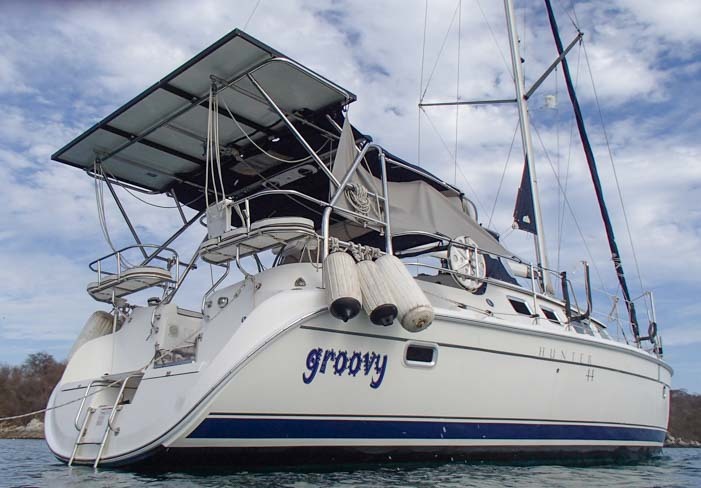 We published an article in the February 2017 issue of Cruising World Magazine (one of the top magazines in the sailing industry) describing the solar power system we installed on our sailboat Groovy back in 2010. 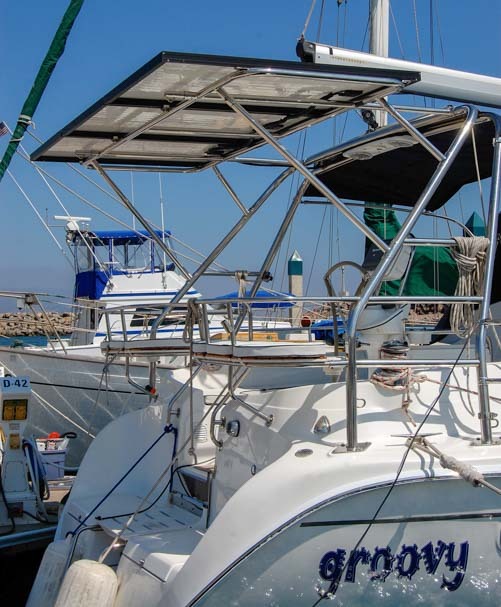 This system gave us all the power we needed to “anchor out” in bays and coves away from electrical hookups in marinas for 750 nights during our cruise of Mexico. 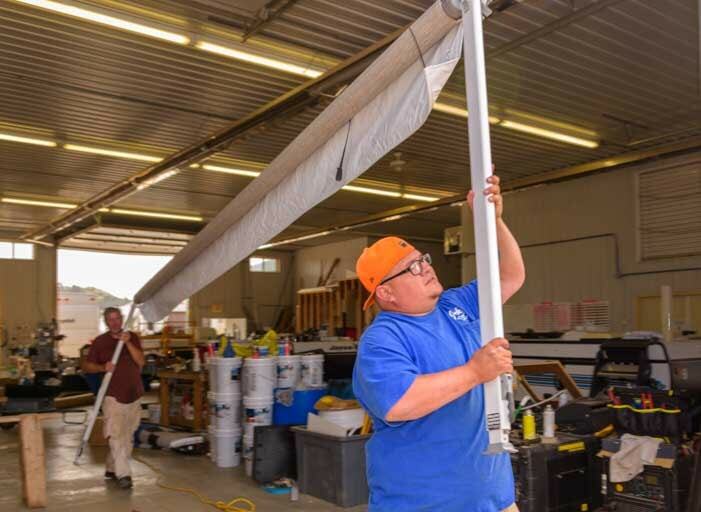 Installing solar power on a sailboat is very similar to installing it in an RV, but there is an added complexity because there isn’t a big flat roof to lay the panels on. Instead, we had to construct a stainless steel arch to support the panels. Fortunately, our boat, a 2008 Hunter 44DS, had a factory installed stainless steel arch over the cockpit already. So, we hired a brilliant Mexican metal fabricator named Alejandro Ulloa, to create our solar panel arch in Ensenada, Mexico. He can be contracted the=rough Baja Naval. Alejandro is an artist. 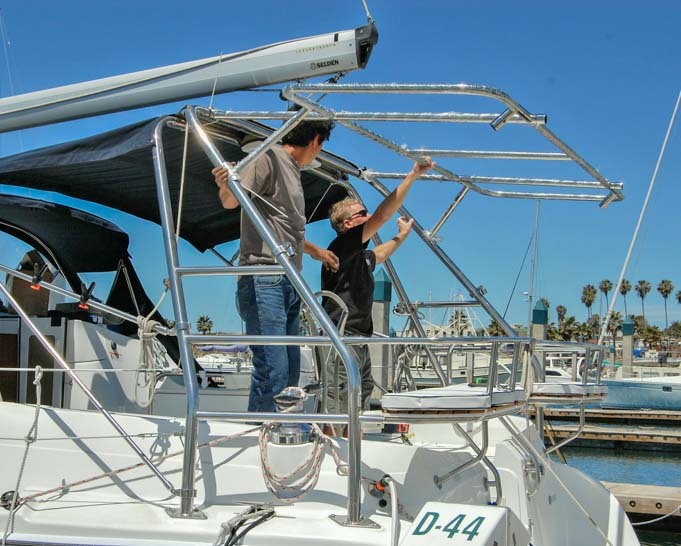 He wrapped the arch in plastic to prevent scratches until it was permanently mounted on our boat! The arch went back to Alejandro’s workshop for tweaking after this measuring session. Dimensions now perfect, Alejandro mounts the arch permanently. Getting the 185 watt 24 volt solar panels up onto the arch was a challenge. 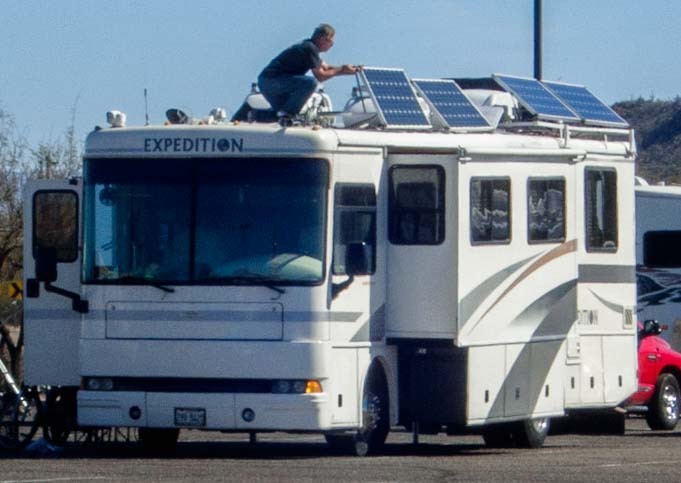 Getting solar panels up onto an RV roof is tricky too! The second of the three panels gets installed. 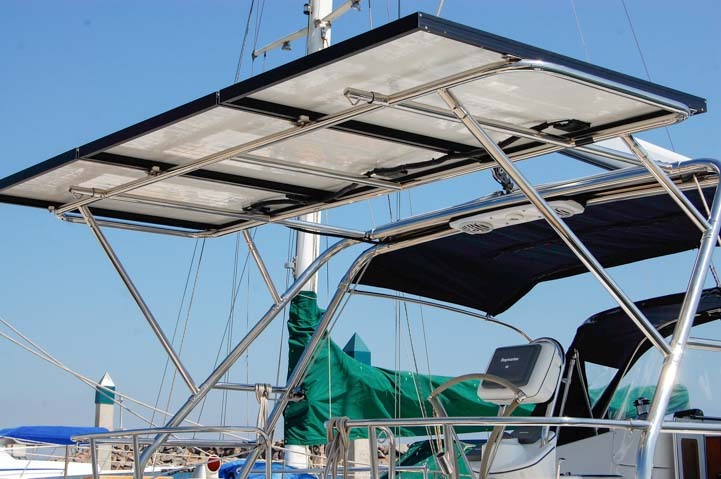 The solar panel arch was going to double as a “dinghy davit” system with telescoping rods that extended out over the transom. These davits supported a pulley system to hoist the dinghy up out of the water. So once the solar panels were mounted on the arch, we had to be sure it could handle the weight of the dinghy. Our dinghy weighed a lot less than the combined weight of Mark and Alejandro! 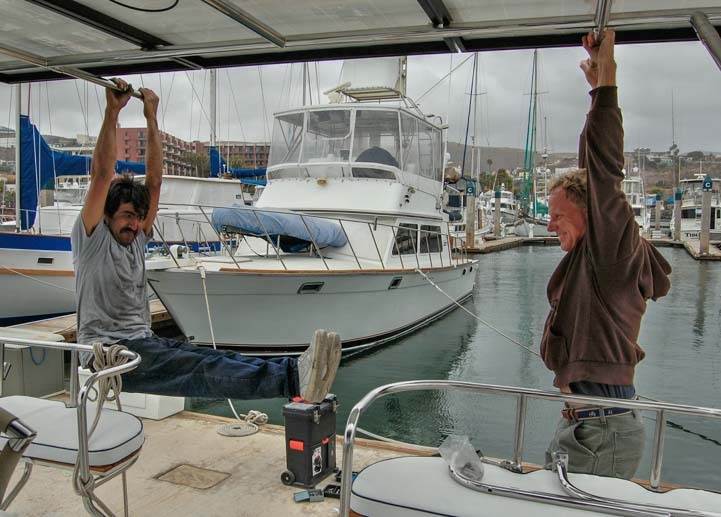 Alejandro and Mark test the arch to be sure it can support the dinghy (which weighed half what they do). 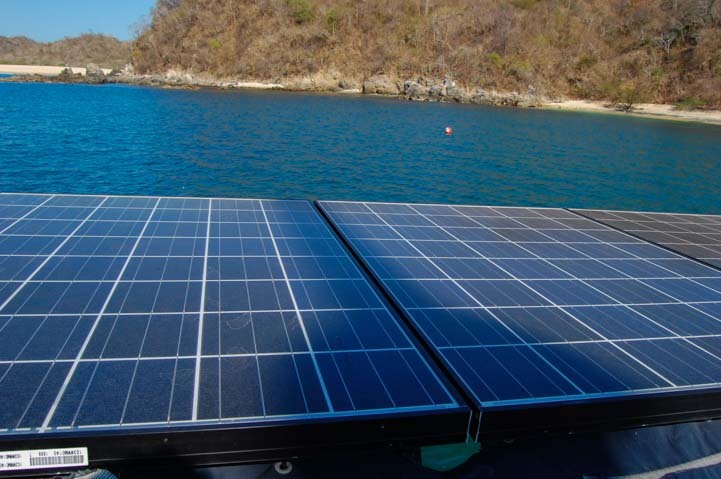 The solar panels were wired in parallel because they would be subjected to shade constantly shifting on and off the panels at certain times of the day as the boat swung at anchor. Mark wires up the panels in parallel. A beautiful, clean installation with wire loom covering the exposed cabling and the rest snaked down inside the tubes of the Hunter arch. The davit extensions for hoisting the dinghy are clearly visible under the panels. Down below the cockpit inside a huge locker in the transom, Mark mounted a combiner box that brought three cables in from the three panels and then sent out one cable to the solar charge controller. 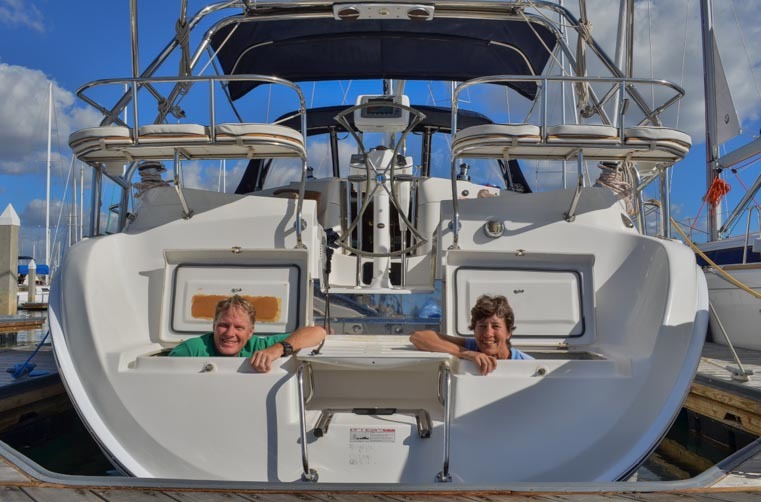 The transom locker in our Hunter 44DS sailboat was very large! 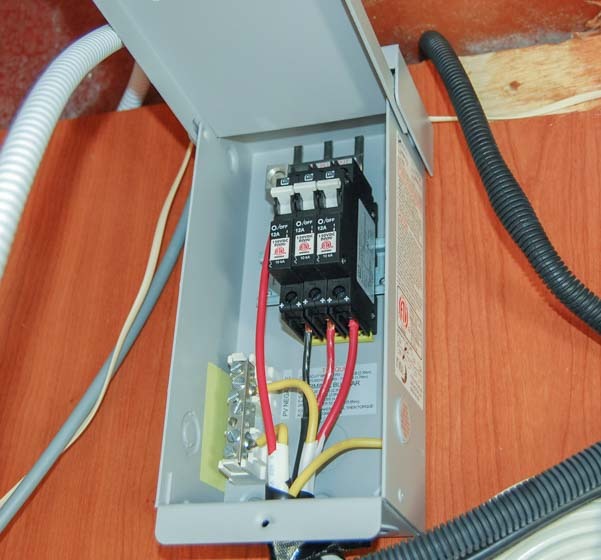 A combiner box brings the wires from the three panels together before a single run goes to the solar charge controller (this is optional and not at all necessary). 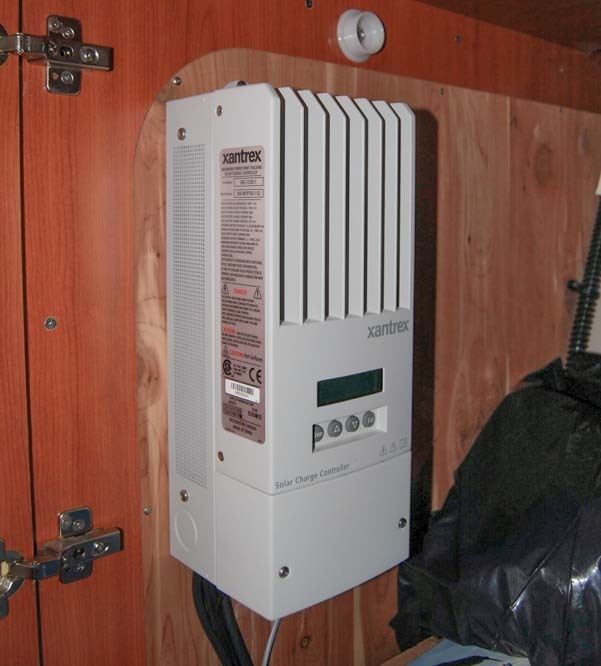 The solar charge controller was installed in the cabin inside a hanging locker in the master stateroom. We have an Outback FlexMax charge controller on our trailer but chose a Xantrex controller for our boat because there were no moving parts. We compare the two HERE. The solar charge controller was located about 8 feet from the near end of the battery bank which spanned a ~14 foot distance under the floorboards in the bilge. We had four 160 amp-hour 4D AGM batteries for the house bank and a Group 27 AGM start battery installed under the floorboards in the bilge. This 555 watt solar power system, which charged a 640 amp-hour house bank of 4D AGM batteries, supplied all of our electrical needs, including powering our under-counter electric refrigerator. Usually our engine alternator provided backup battery charging whenever we ran the engine. However, at one point our alternator died, and we were without it for 10 straight weeks while we waited for a replacement alternator. Why such a long wait for a simple replacement part? 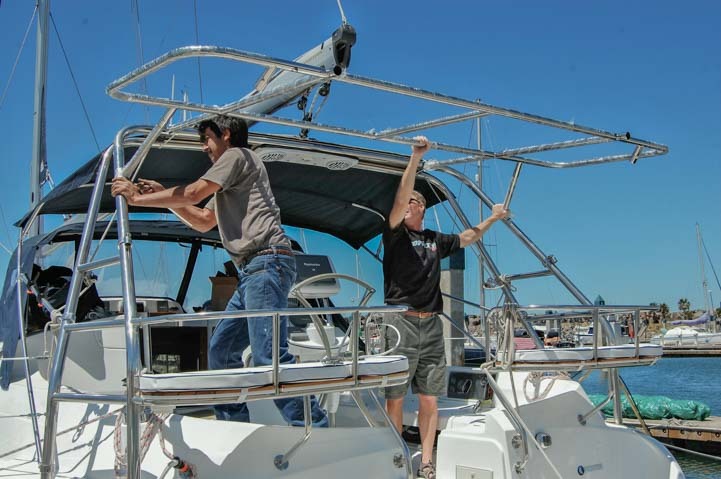 Getting boat parts in Mexico requires either paying exorbitant shipping fees and import taxes or waiting for a friend to bring the part with them in their backpack when they fly from the US to Mexico. During that long wait our solar power system supplied all our electricity without a backup while we were anchored in a beautiful bay. Diesel engines don’t require an alternator to run, so we moved the boat around and went sailing etc., and lived our normal lives during our wait. View from the water — cool! 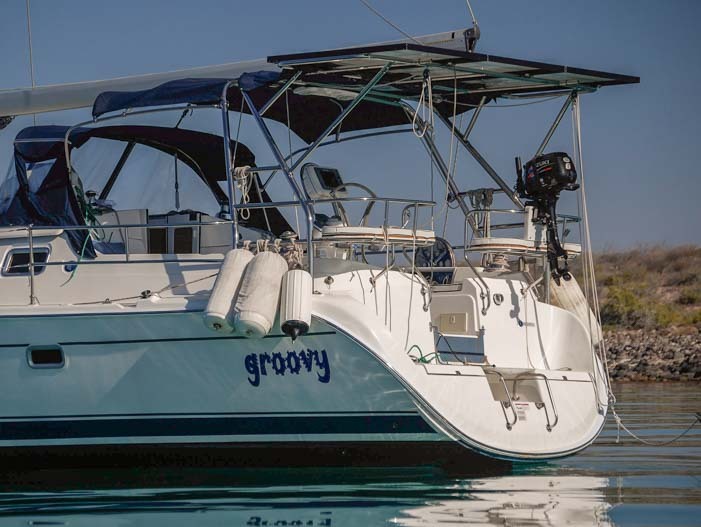 The dinghy davit extensions on the solar panel arch made it easy to raise and lower the dinghy from the water and also to raise and lower the 6 horsepower outboard engine. 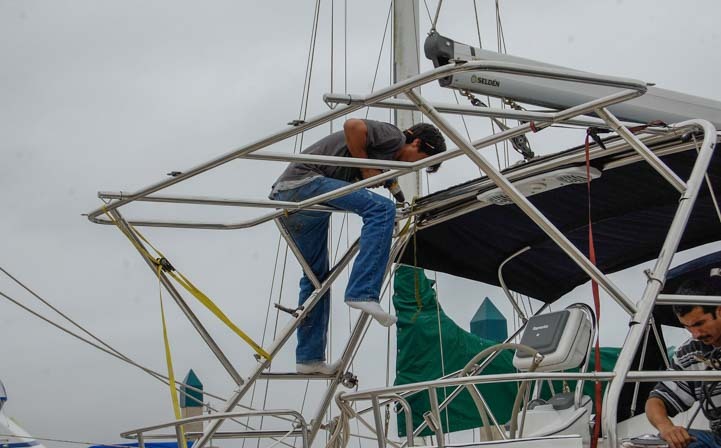 A pulley system on the davit extensions made hoisting the outboard and dinghy a cinch for either of us to do singlehandedly. 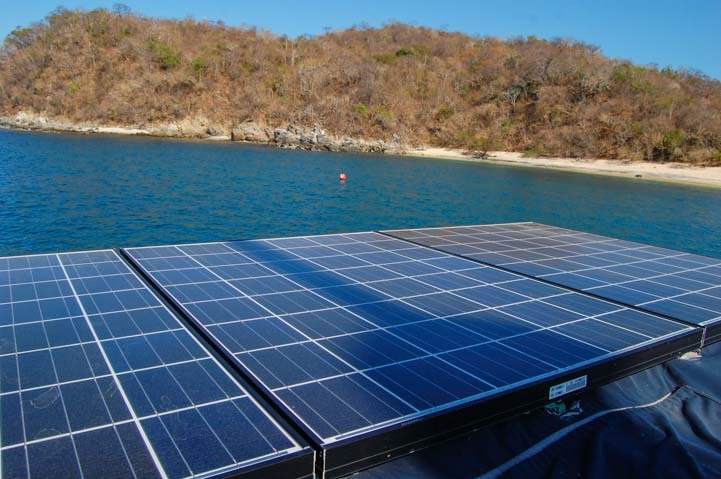 For 7 months we left our boat at the dock in Chiapas, unplugged from shorepower, and let the solar panels keep the batteries topped off. Everyday during that time they put 19 amp-hours into the batteries which was essentially the power required to operate the solar charge controller! At anchor, sometimes the solar panels were in full sun all day long if the current and wind and the pattern of the sun crossing the sky allowed the boat to move around without the sun coming forward of the beam of the boat. However, whenever the sun was forward of the beam, the shadow of the mast and the radome fell on the panels. We could watch the current production from the panels go from full on, to two-thirds, to one-third and back again as the shadow crossed one panel and then two at once, and then one and then none, etc, as the boat swung back and forth at anchor. 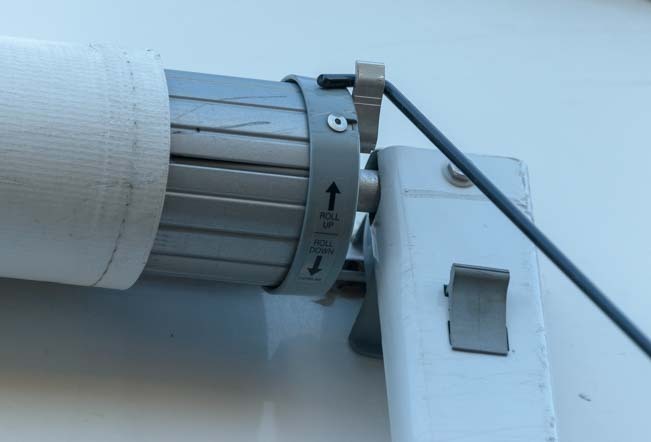 RV solar installations have to avoid shade from air conditions and open vent hatches. On boats the shade from the mast and radome is often unavoidable. When the shadow fell across two 185 watt panels at once, it knocked both of them out of the system so only one of the three solar panels was actually producing power. The coolest and most unexpected benefit of having our solar panels mounted on an arch over the cockpit was the shade that they provided. The sun in Mexico is very intense, especially out on the water, and it was wonderful to have two huge forward facing jump seats at the back of the cockpit that fully shade as we sailed! Made in the shade — What a life that was!! Wet Cell vs. AGM Batteries in an RV or Boat - Why we upgraded our RV house battery bank from flooded to AGM! RV Electrical System Upgrade - Which converter, inverter and batteries we upgraded to after 8 years off the grid, and WHY! 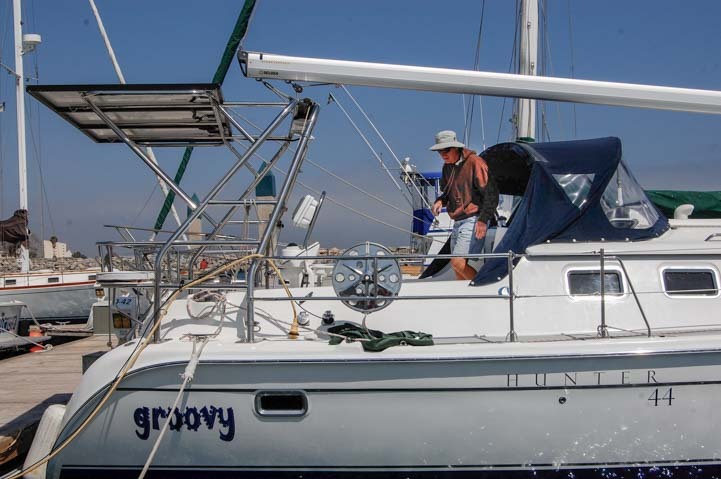 Kyocera Solar Showcases our Sailboat's Solar Power Setup - Sailing Groovy on Kyocera Solar Power! 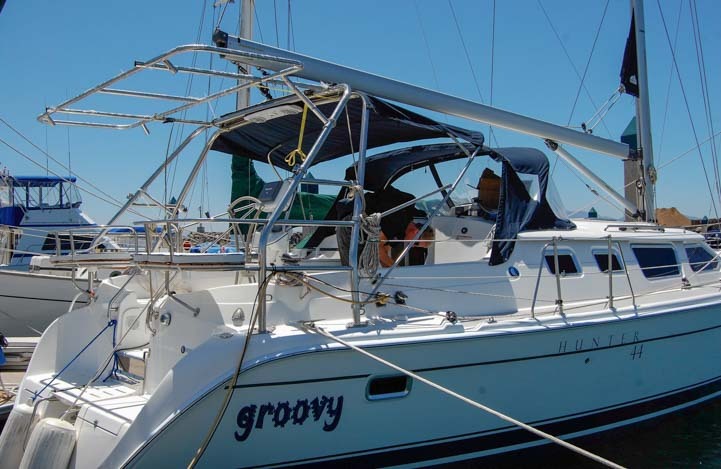 Do We Miss Our Boat “Groovy” and Sailing? 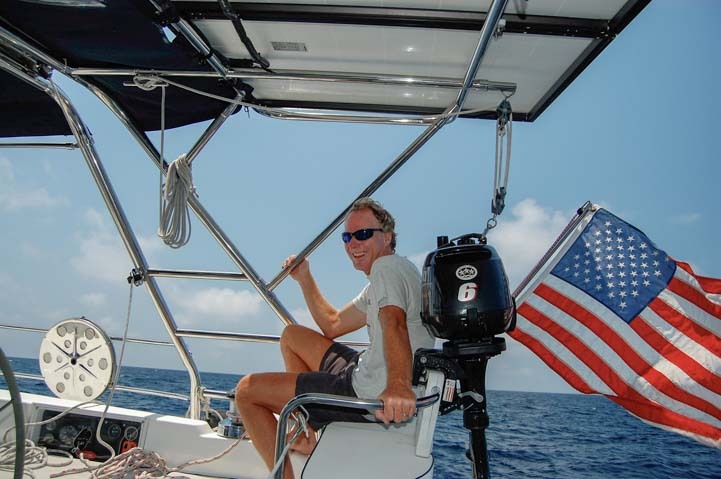 We describe our thrilling — and heart wrenching — first and last days on our wonderful sailboat in the following posts. 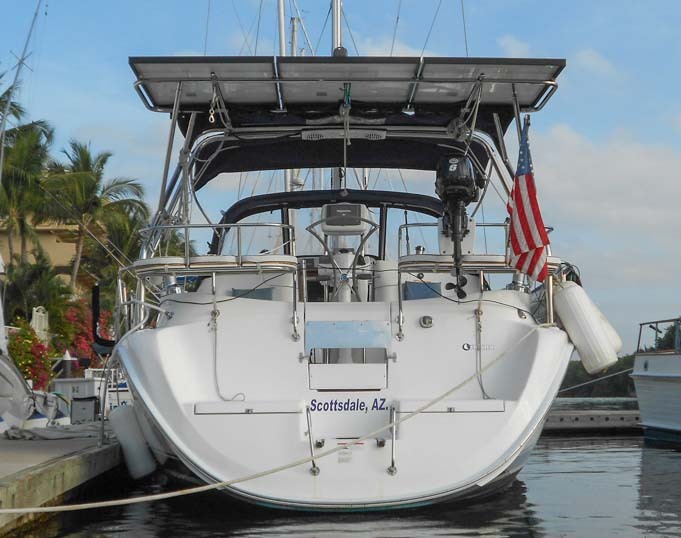 It is very true that the happiest days of a boater’s life are the day the boat is bought and the day it’s sold! 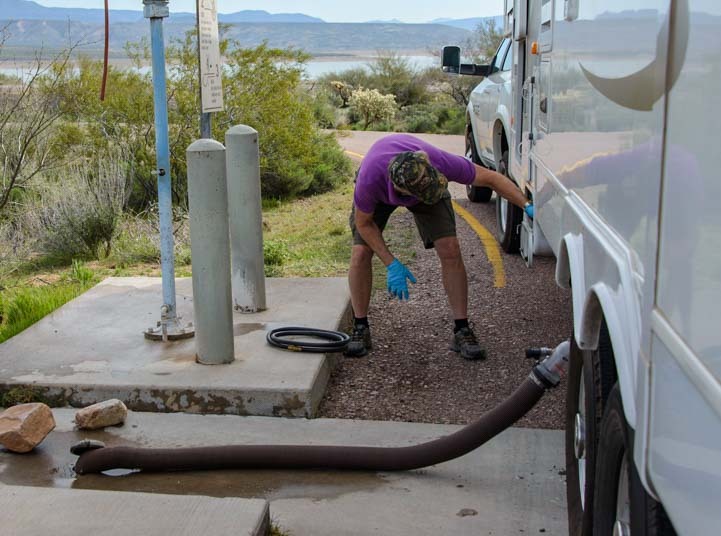 Dumping the RV holding tanks is a nasty little job, but it’s part of the fun of traveling around in an RV, and we’ve all gotta do it. It’s really not all that bad when it’s a shared job, but of course that’s easy for us gals to say, because it’s usually our male partners-in-love-and-life who get to do the bulk of the dirty work. 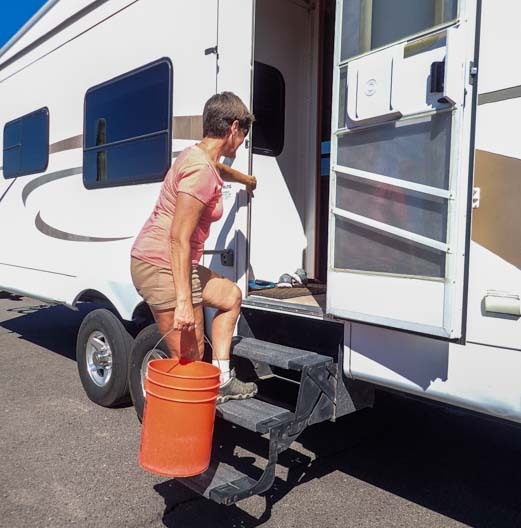 Despite lots of progress over the years for the types of work women can do, emptying an RV’s waste water holding tanks is a job many women are just as happy to leave to their better half. 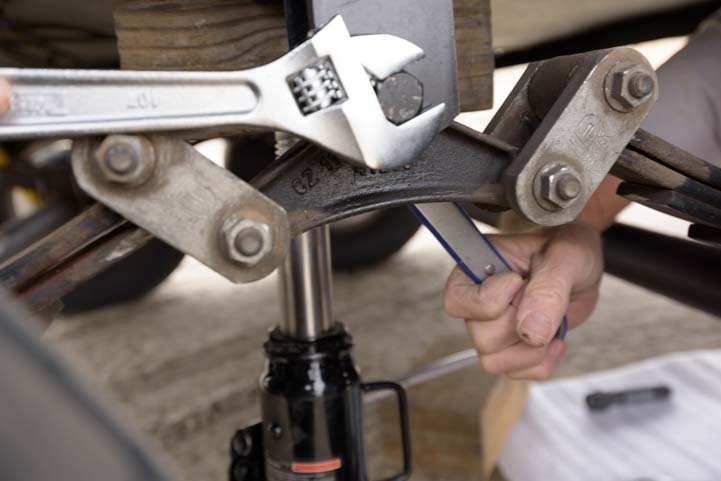 Sometimes, when we go to an RV dump station, I am amazed to see a woman remain in the passenger’s seat of her truck or motorhome for the whole duration of the job. I’m not sure how these women have negotiated that arrangement with their significant other, but I figure they must be incredibly good cooks to be able to chat with a friend on the phone or check the latest on Facebook while their hubby is grinding it out with the sewer hose, the splashing water, and all that muck and mire. Mark looks like he’s having so much fun. Can I get away with doing nothing? I wish my skills were so awesome in the kitchen that I could be exempt from doing anything at the RV dump station. But alas, in our marriage, I need to be a participant in this dirtiest of deeds to win brownie points for other aspects of our life together. Nonetheless, it took me a few years to find things to do while we were at the RV dump station that were truly useful and helpful. 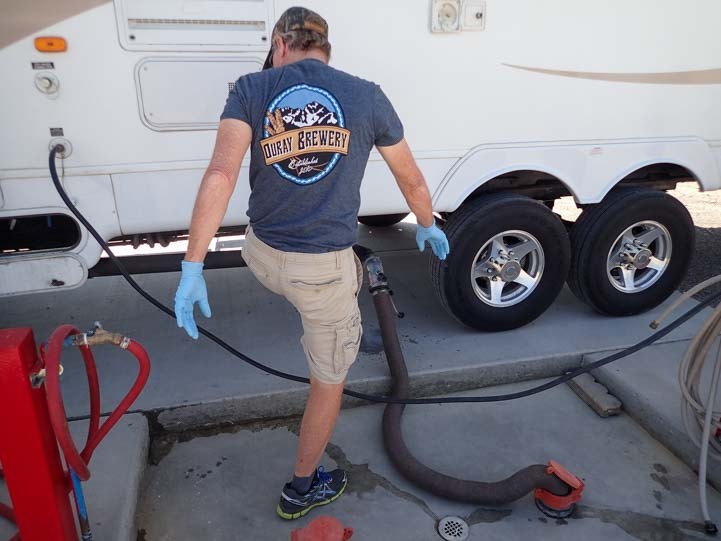 Too often at the beginning of our RVing lives I found my best efforts to help with setting up the RV sewer hose or screwing in the water hose ended up with me underfoot and in the way of the general flow of things. Mark had his methods, and I couldn’t read his mind as to what came next. 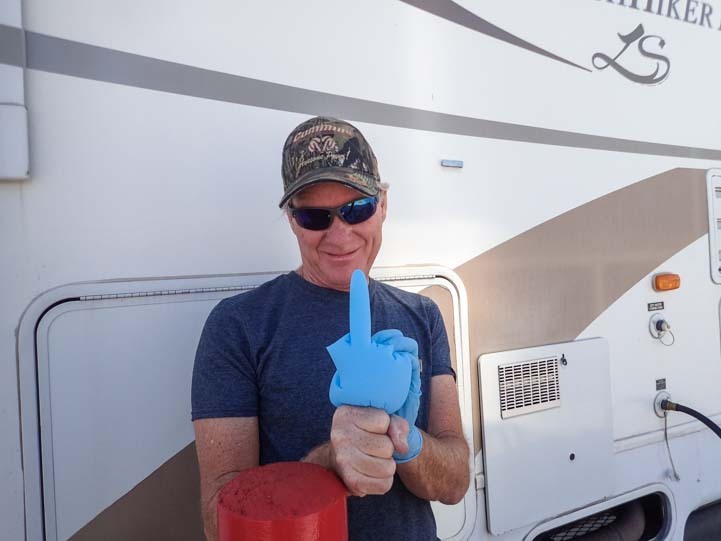 Few people are in truly sunny and radiant moods when they don their rubber gloves at the RV dump, and too often I found that my most valiant attempts to be helpful resulted in tensions rising between us. Then one day I discovered a way that I can be of significant help and get some important jobs done at the same time. For starters, I fill two 5-gallon water buckets with water and carry them into the rig to dump them down the toilet after the black tank has been emptied. 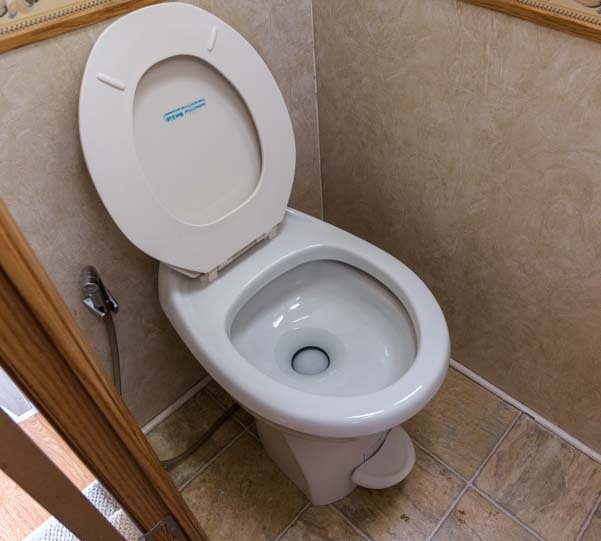 Even if an RV has a black water flush system like ours does, it is still surprising just how many little bits of gunk and human waste solids get flushed out when two 5-gallon buckets of water are poured down the toilet. I fill the buckets while Mark gets the sewer hose out and attaches the clear elbow so he can see when the holding tanks are fully drained. Then I can scoot out of the way and carry the buckets around to our RV’s door before he begins attaching the black water flush hose between the rig and the water spigot. 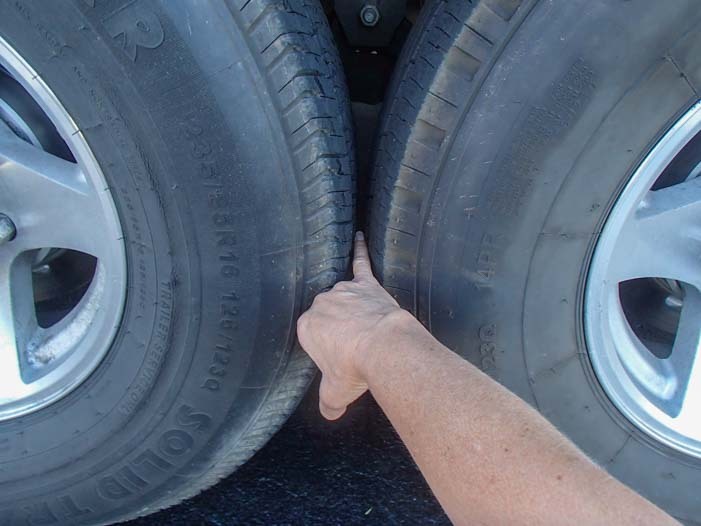 This way we don’t end up stepping on each when we first start working at the RV dump station. We have two buckets and I fill each one with water to give the toilet and sewer pipes an extra flush. The buckets are heavy to carry around to our trailer’s front door, but I don’t mind a little bit of a shoulder and arm workout, and I take them one at a time. Maneuvering a heavy bucket of water up stairs is excellent exercise for both balance and strength. I grab the inside of the doorway with my left hand for extra balance, tighten my abs so I don’t throw my back out with the uneven weight distribution of carrying a heavy bucket, and I leverage myself up and set the pails down inside in the kitchen. The buckets are heavy, but I take my time and grab the door frame to keep my balance as I go up the stairs. 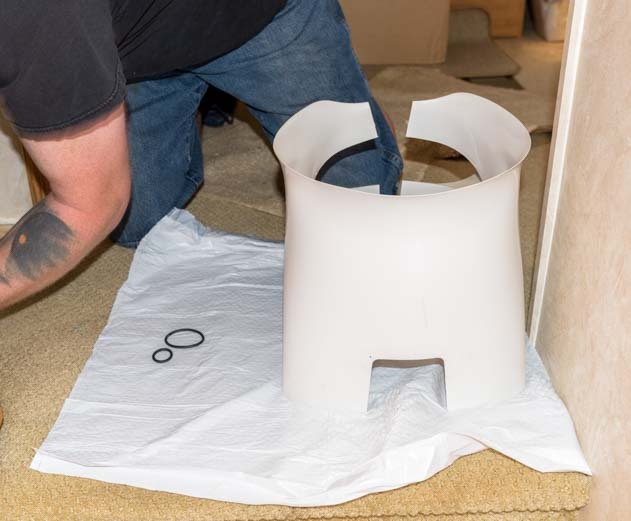 For those who can’t carry the buckets, your partner will likely be happy to carry them for you since this really helps ensure the black tank and toilet get a complete flush. Also, filling the buckets only half way or three quarters of the way can help not only lighten the load but keep the water from splashing all over the place and all over you. The other task I tackle is cleaning the toilet room from top to bottom and cleaning the bathroom vanity and kitchen sink. I figure that if my sweet hubby is dealing with the darker side of RVing outside at the RV dump station, I can deal with the same stuff on the inside.. 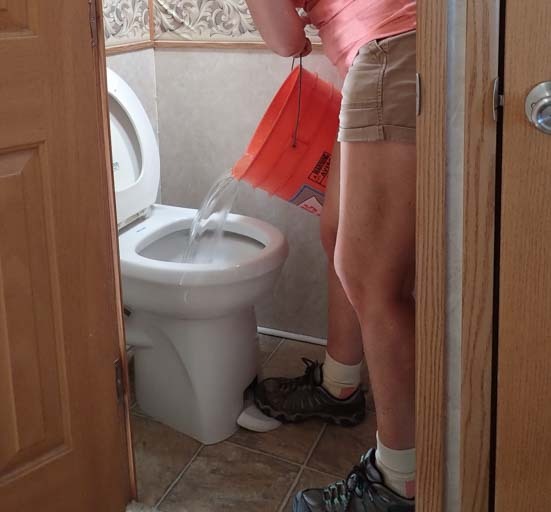 This insures the bathroom gets cleaned on a regular basis and also means that when we arrive at our next campsite not only are the holding tanks empty but our bathroom is sparkling clean and smells fresh. So, once I get the water buckets inside the rig, I begin assembling the things I will need to clean the toilet and the bathroom. When I hear Mark’s knock on the wall, I know he has finished emptying the black tank and it is time to dump the buckets of water down the toilet. I pour one bucket at a time and Mark watches the flow in the sewer hose to make sure the water eventually runs clear. Since the buckets are just inside the RV door, it takes me a minute to grab one and empty it. Then it takes a few minutes more to go grab the other one and empty it too. 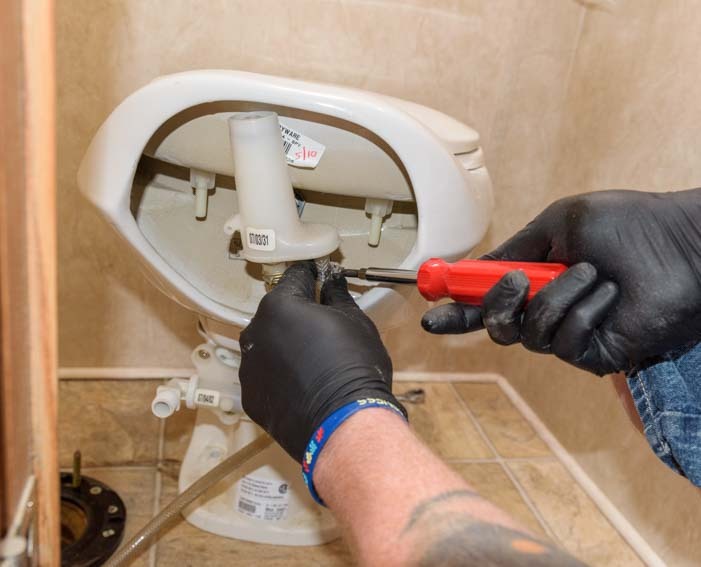 Having a few minutes between flushes is helpful because then Mark can monitor whether the water from the second bucket is running clear or is still flushing solids out. If there are still chunks coming out, then, depending on whether anyone is waiting to use the RV dump after us, I’ll fill another bucket or two with water and dump them down the toilet. Sometimes I have the water pump turned on as I dump the buckets of water down the toilet and sometimes it’s turned off. Having it turned on means even more water flushes down, which is great, but it also uses up water from the fresh water tank. So, whether or not I have the water pump turned on depends on whether there are people waiting behind us at the dump station, as it will take a little longer for us to fill the fresh water tank if we flush a few extra gallons down the toilet as part of the dumping process. Now that the black tank is completely flushed, Mark begins emptying our kitchen gray tank. We have two gray tanks, one for the kitchen and one for the shower. We empty the kitchen tank first because it is dirtier and has more things in it (like broccoli bits) than the shower gray tank which is just sudsy water. While he works on emptying the two gray tanks, I get to work cleaning the toilet. If Mark is mucking around in gross stuff outside, the least I can do is muck around in gross stuff inside. This also gives us a clean bathroom when we set up camp. 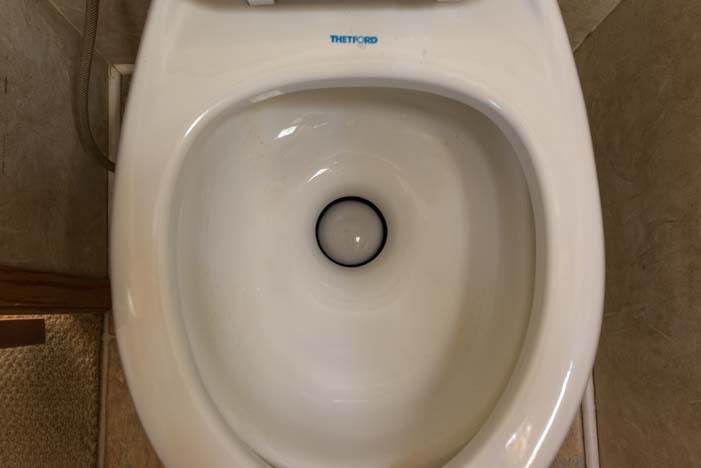 Since we have a hatch in the toilet room that we leave open a lot, the toilet lid and the floor often get dusty in just a few days. So I remove everything from the toilet room and clean everything, including the floor. 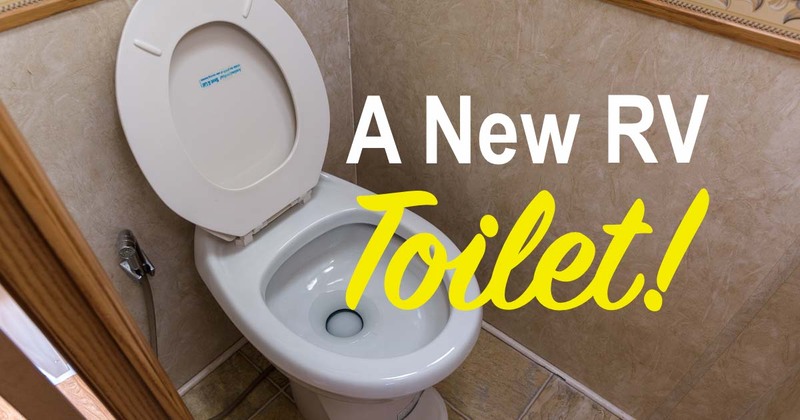 Over the years we’ve found that the toilet bowl — more so than the black tank itself — can be a big source of foul odors. 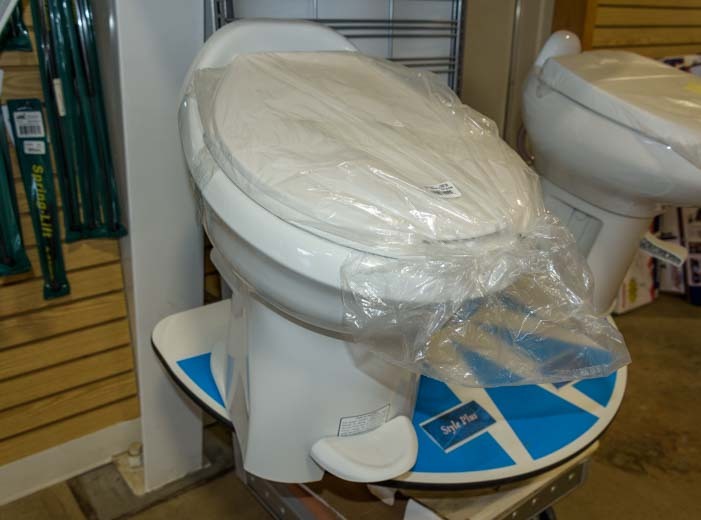 Unlike household toilets, RV toilet bowls are basically dry except during flushing, so urine can end up drying in the bowl and producing an odor. 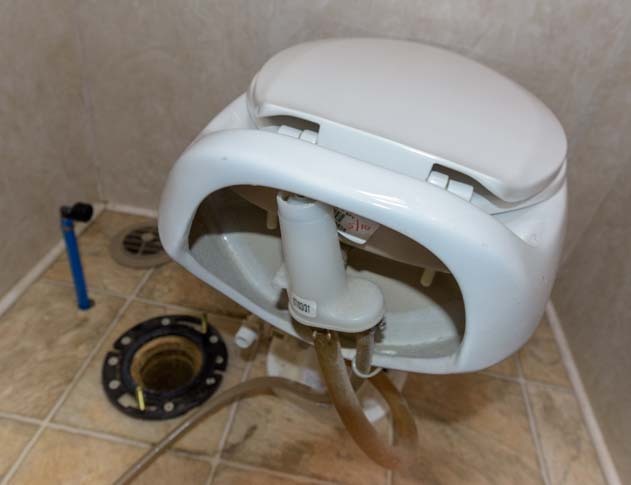 Also, the flow of the flushing water doesn’t necessarily rinse every inch of the bowl, so some areas simply don’t get rinsed all that well, even when using the toilet’s spray nozzle. So, I go to town on the inside of the bowl as well as everything else. 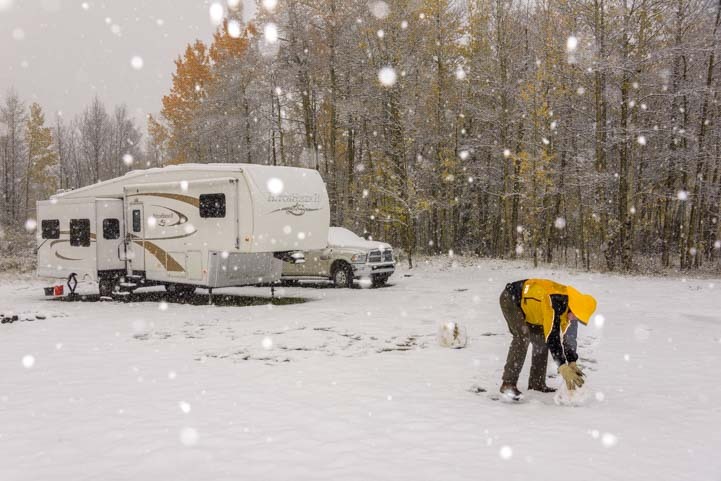 We use two enzyme/bacteria based RV holding tank treatment products: Happy Campers RV holding tank treatment has worked best for us in extreme temperatures (very cold and very hot) and for controlling tank odors. RV Digest-It holding tank treatment has worked best for us in moderate temperatures to break down the solids in the tank. Because these are both basically solutions of living critters, the toilet cleaning products we use can’t be too toxic or the colonies of feces-eating bacteria can’t get established and become self-perpetuating. I’ve been using Murphy’s Oil Soap for the last few years with good results. 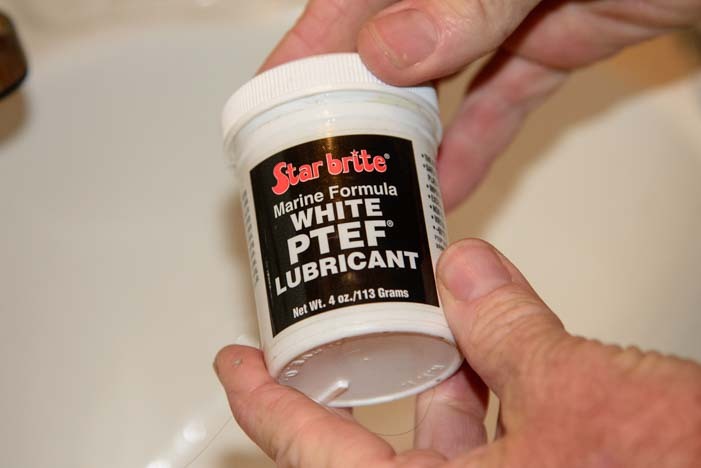 This is the soap that is recommended for cleaning the rubber roofs on the tops of RV’s, which is why we had it on hand to try on the toilet a few years ago. 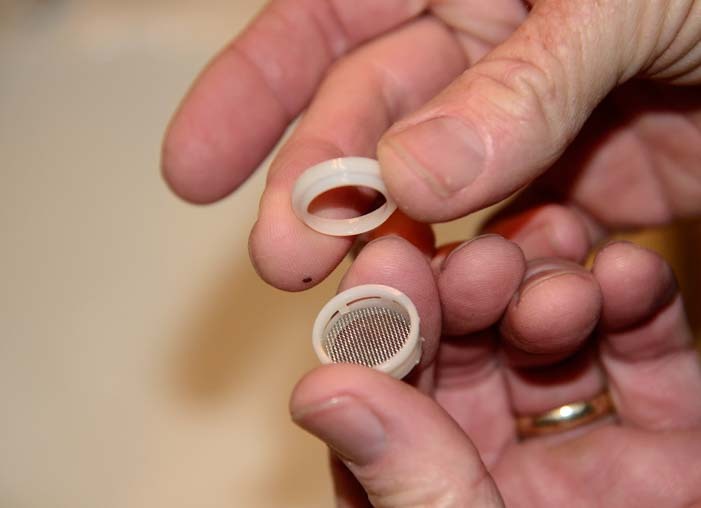 In addition to being biodegradable, what we like about it for cleaning the toilet is that it assists in keeping both the seals in the toilet bowl and on the black holding tank valve lubricated. I used white vinegar for cleaning the toilet for a while, and after a few months the black tank valve got really sticky. Since switching to Murphy’s Oil Soap a few years ago, that valve hasn’t gotten gummed up. Periodically, we’ve found the seals in the toilet bowl have stopped holding water which meant the bowl drained completely dry between flushes. This allowed foul odors to come up from the black water tank. 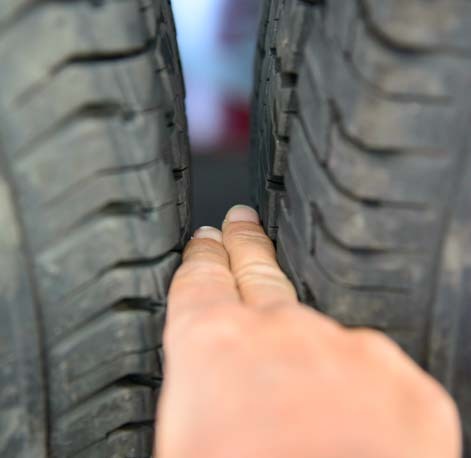 This problem is usually due to mineral and gunk build-ups on the seal. So, I give that seal a really good cleaning too. 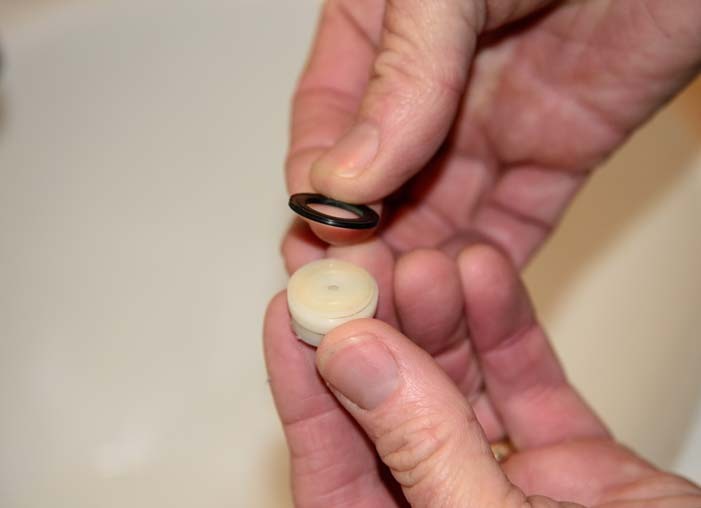 The critical areas are on both the top and bottom surfaces of the rubber seal, that is, between the seal and the toilet bowl (the top side) and underneath the seal where the dome flapper (the “waste ball”) closes up against it. 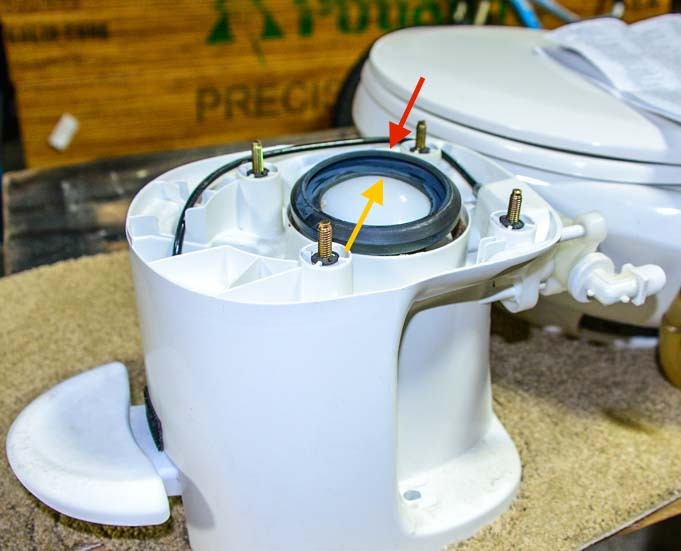 A disassembled RV toilet shows what the rubber toilet seal looks like without the toilet bowl sitting on it. To prevent it from leaking and draining the toilet between flushes, I scrub both top and bottom of the rubber seal. 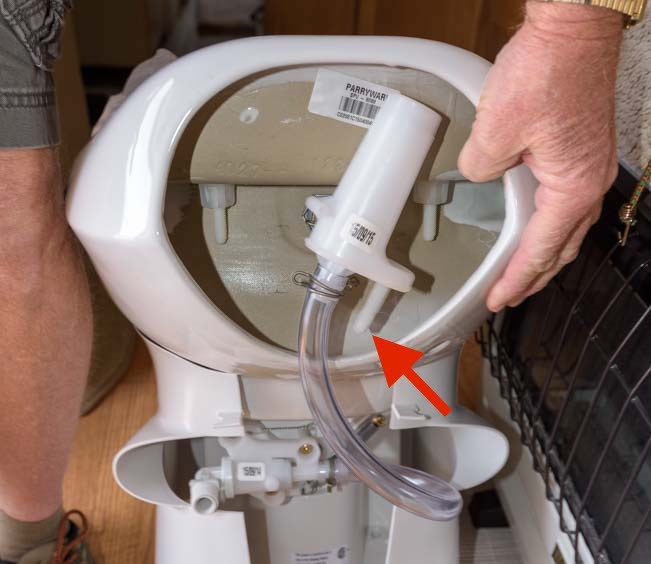 I make sure the water pump is off at this point and hold the toilet flush lever down so I can get at the underside of the seal. 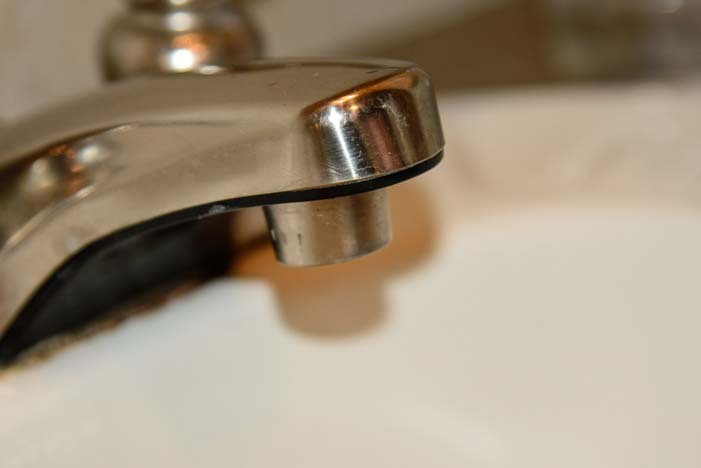 Often, the build-up is due to having hard water in the fresh water tanks which is very common in Arizona and other western states where the fresh water comes from deep, mineral rich aquifers. 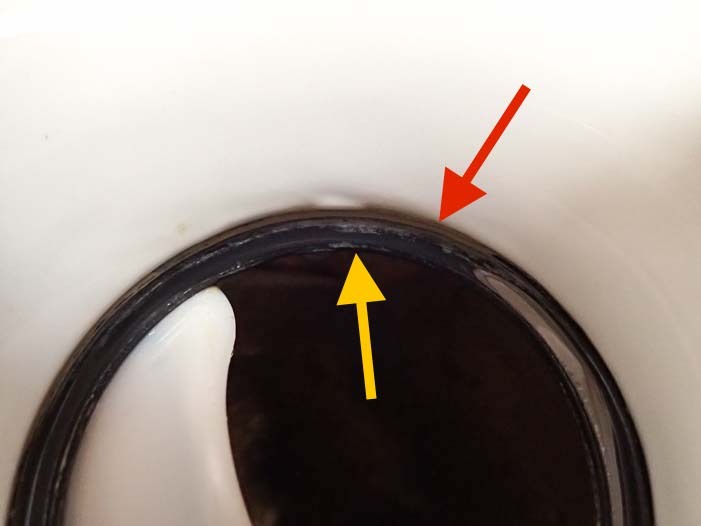 The seal needs to be completely free of mineral deposits on both the top and bottom, so I clean the area between the seal and the bowl on the top (red arrow) and below the seal on the bottom (the backside of the seal in this view). At this point, depending on what Mark is up to outside, I’ll move on to other cleaning projects. 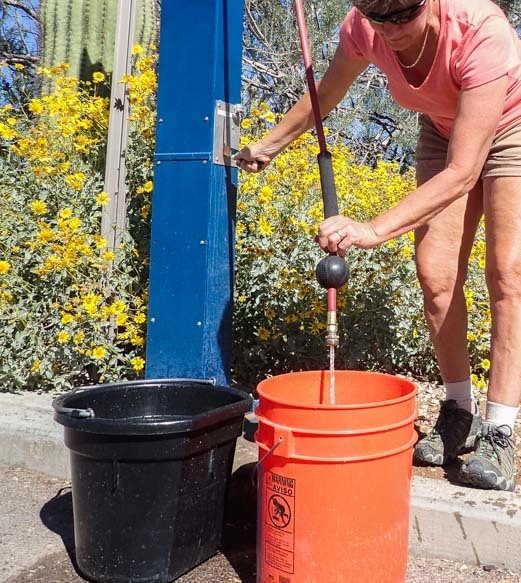 If we have nearly emptied our fresh water tanks prior to coming to the RV dump station, it may take 10 minutes to refill them. Also, sometimes the potable water spigot is a little ways beyond the waste water dump area, requiring Mark to move the whole rig a few feet forward. So, if there is time, I will clean the bathroom vanity sink and then move on to the kitchen sink. 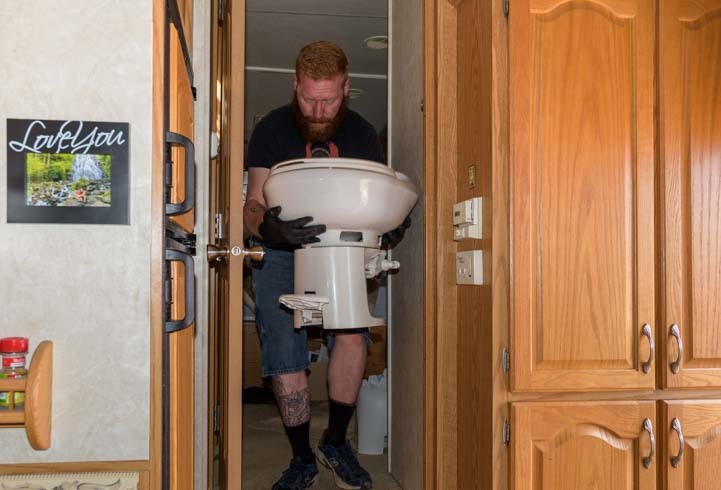 Depending on our plans for the next few days and depending on how much time I have at the RV dump, I may also add the holding tank treatment to the black tank, via the toilet, and add it to the gray tanks via the bathroom sink, shower and kitchen sink. Sometimes, however, I prefer to wait two or three days until those tanks have some liquids in them before adding the holding tank treatment. And sometimes I add just a half tank’s worth of holding tank treatment at the RV dump station and then add the other half a few days later once the holding tanks have become partially full. Of course, we add a capful of bleach to our fresh water tanks every few months, and that totally obliterates any colonies of anything that have started to grow in any of the holding tanks (including the fresh water tank) as the bleach water works its way through our plumbing system from the fresh water tank to the gray and black waste water tanks. So, for us, creating fully self-sustaining communities of healthy organisms in any waste water tank is not 100% doable. But by using non-toxic cleansers we can help them along in between bleach blasts. 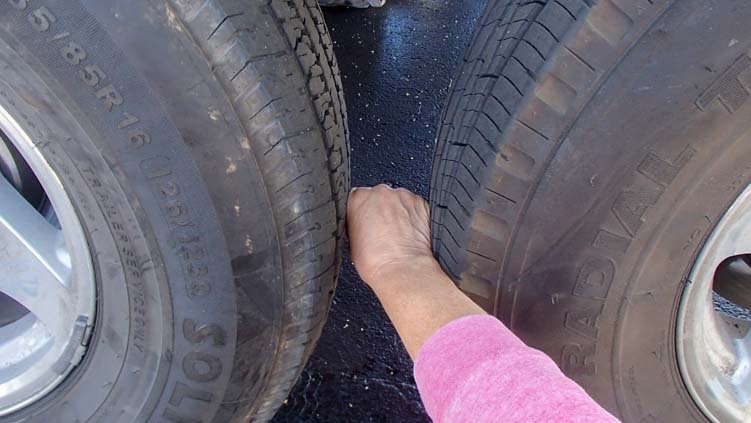 So, all in all, there is a LOT a girl can do at the RV dump station. 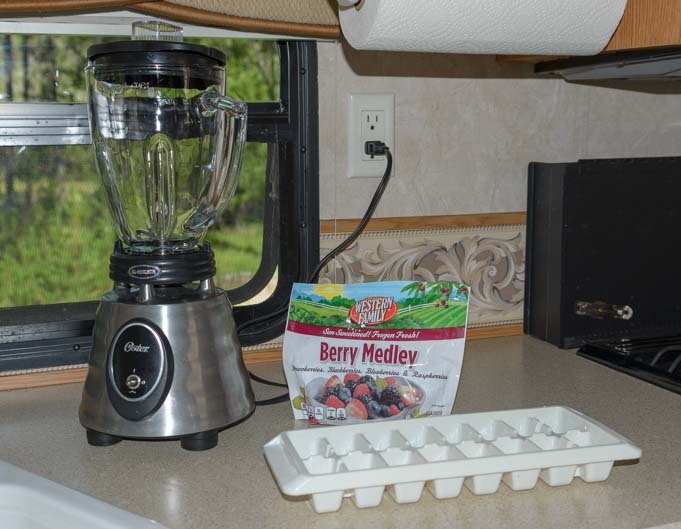 We find we are both much happier about the whole process when we each have a set of tasks to do when we get there that are not only similarly grungy but are equally important and that take place in different parts of the RV. 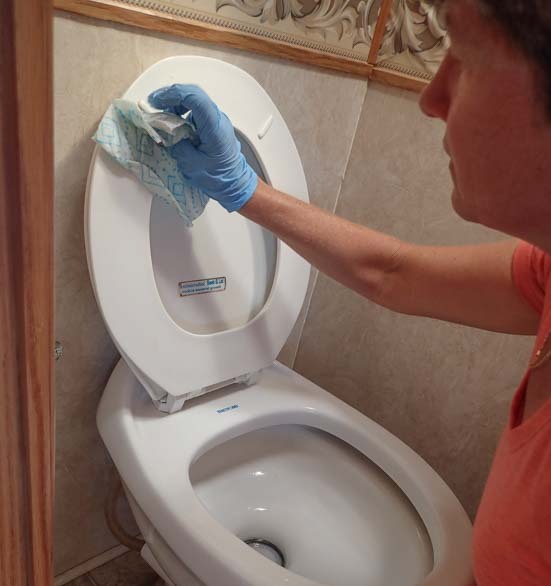 The best part is that when we leave the RV dump station to go set up camp in a new, beautiful location, not only do we have empty waste water tanks but our bathroom is clean and fresh too. 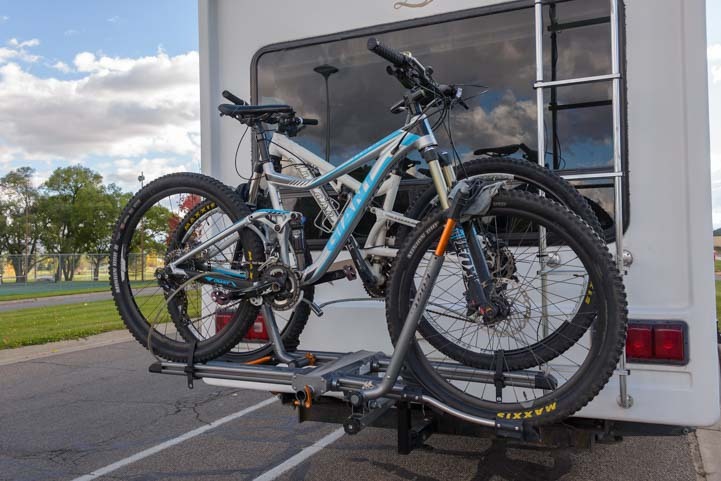 We carry our bicycles on the back of our 36′ fifth wheel trailer with a Kuat NV bike rack inserted into the trailer’s hitch receiver (we reviewed the Kuat bike rack here). 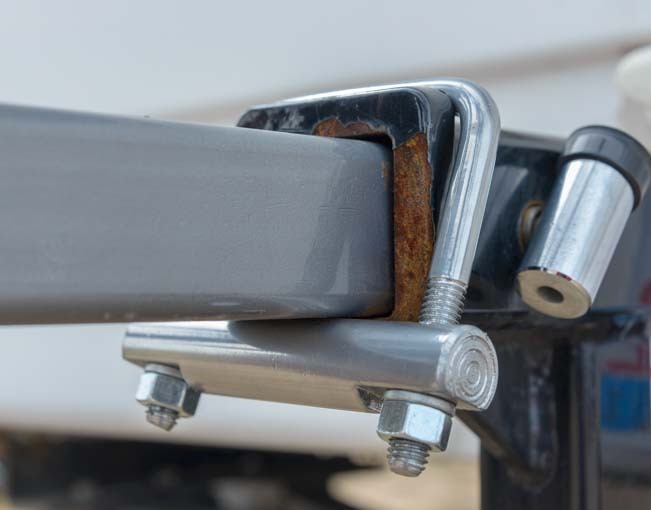 We installed this bike rack in 2012 and it has been great for the past five years of our full-time RV travels. 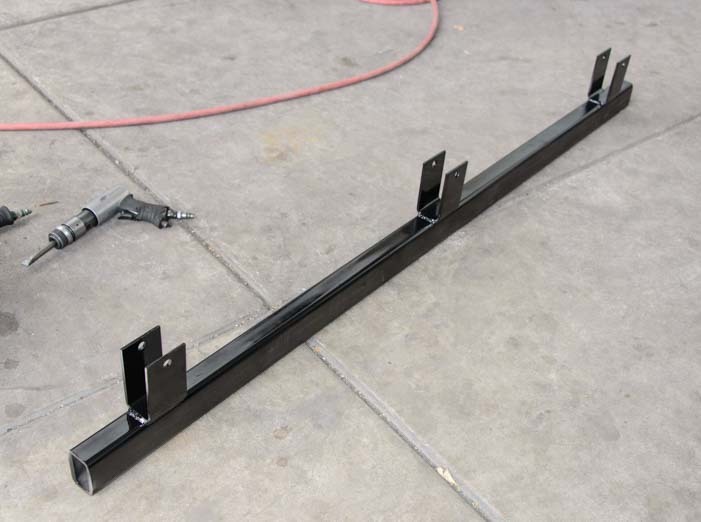 To keep the bike rack from dragging on the ground in crazy places like steep gas station ramps or deep gulleys on small roads, we had a “Z” shaped “hi-low” hitch riser made. 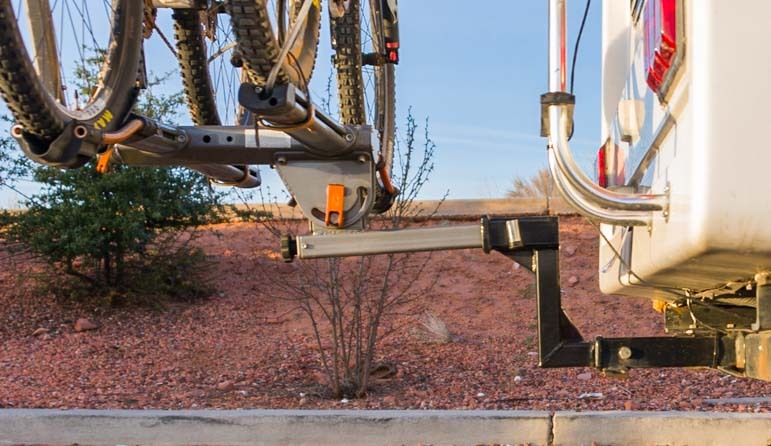 This raises the rack up quite high, so now the first thing to hit the ground is the hitch receiver itself rather than the bike rack. 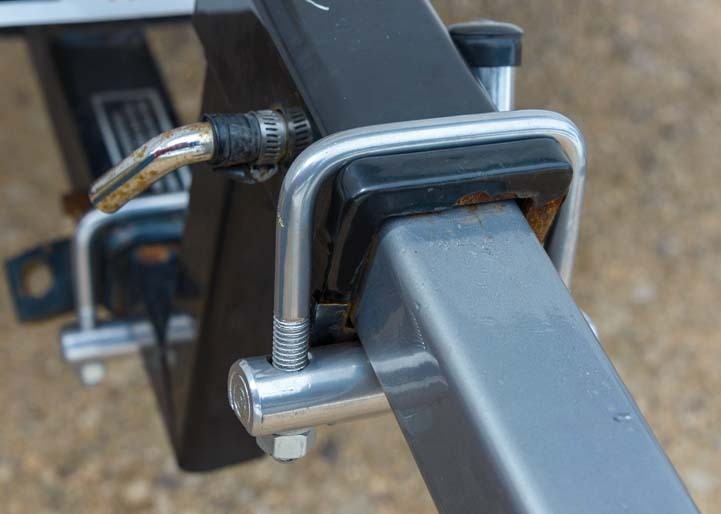 A “Z” shaped “hi-low” hitch riser raised the bike rack so it can’t drag on the ground in a gully or dip. 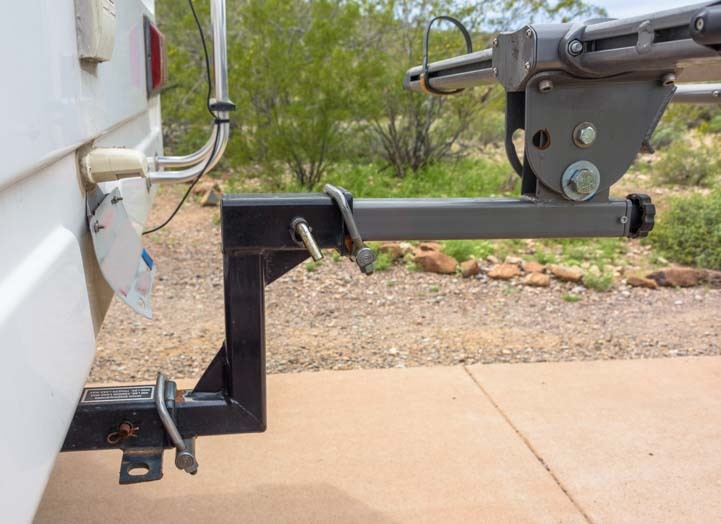 As is often the case with hitch receivers, the bike rack isn’t a perfectly tight fit in the hitch receiver riser, and the bottom of the riser isn’t a perfect fit in the trailer’s hitch receiver either. So, the whole bike rack tends to wiggle. We’ve used various shims to make it all tight, but too often they would wiggle loose over time, and eventually the bikes would be jiggling all over the place on the rack again. 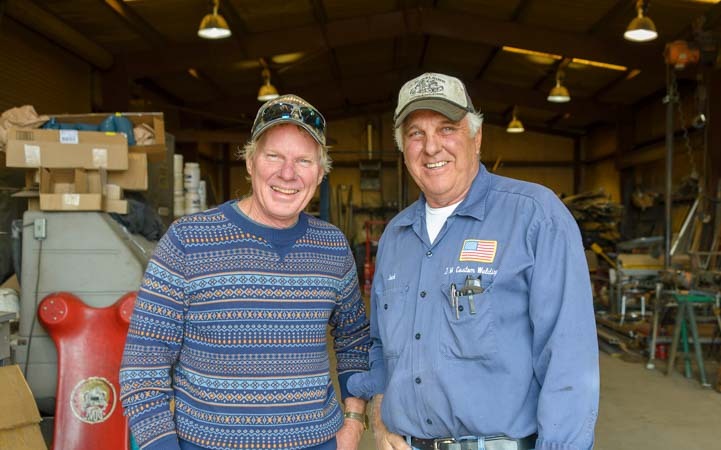 Last fall we stopped in at JM Custom Welding in Blanding, Utah, to talk with Jack, the man who had made our “Z” hitch riser (more info about it here). We wondered if he had any tricks up his sleeve for making our bike rack arrangement less wobbly. 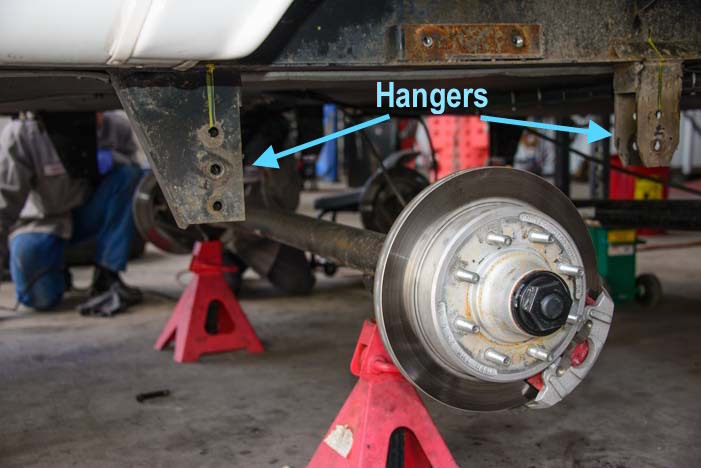 It turns out that he had solved this very problem for other customers by making a hitch tightener. 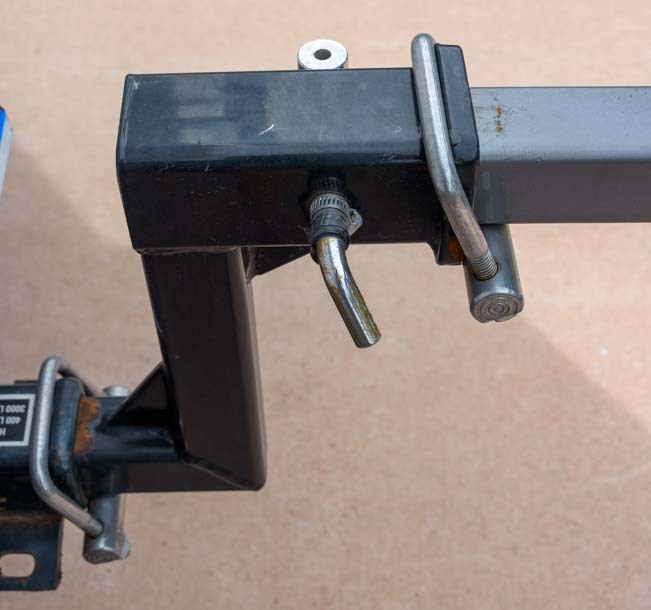 This is essentially a hitch clamp that fits over the end of the hitch receiver and snugs up whatever is inserted into the receiver with some lock washers and nuts. 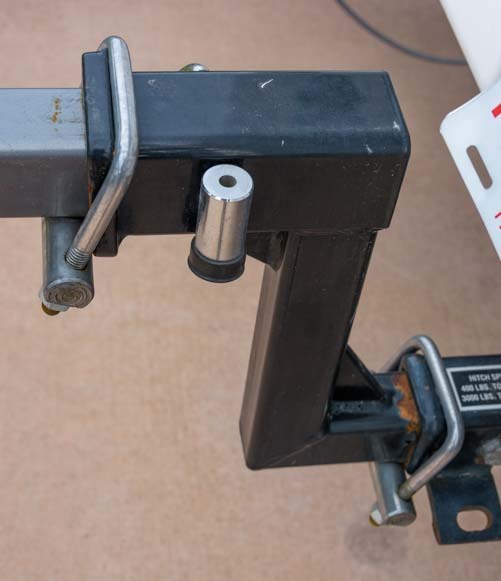 Jack put this nifty hitch tightener on our hitch receiver. 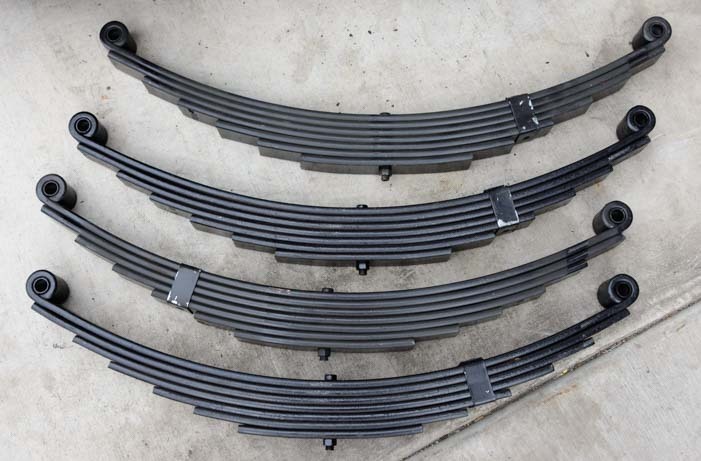 So, we got two of them, one for the top and one for the bottom of our “Z” shaped hi-low hitch riser extension. 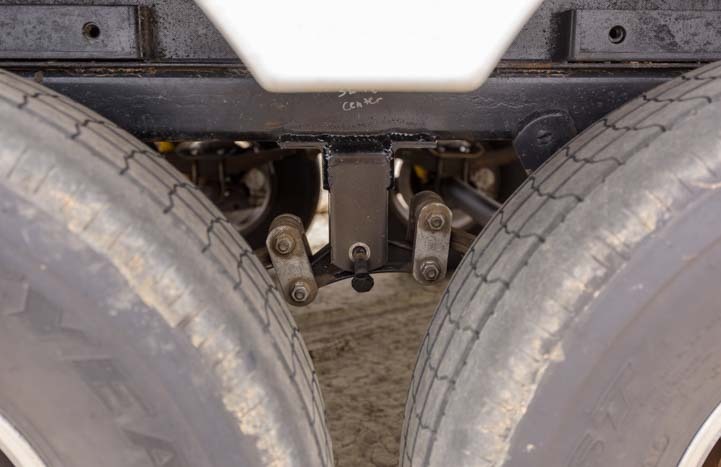 He put a second hitch tightener on the trailer’s receiver as well. The difference in the amount of movement of the bikes was absolutely astonishing. They were rock solid now! 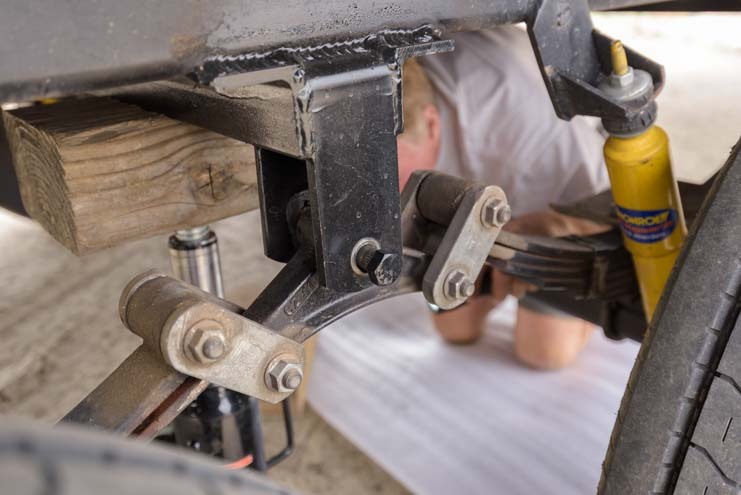 Looking down at both hitch tighteners on our hitch extension. 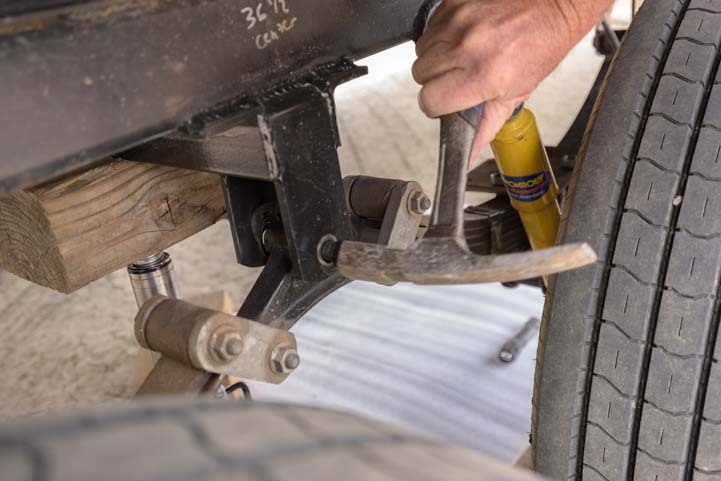 After installing the hitch tighteners, which was just a matter of tightening the nuts, Mark drove the rig around the JM Custom Welding dirt lot while I walked behind and watched the bikes, and they were steady as could be. 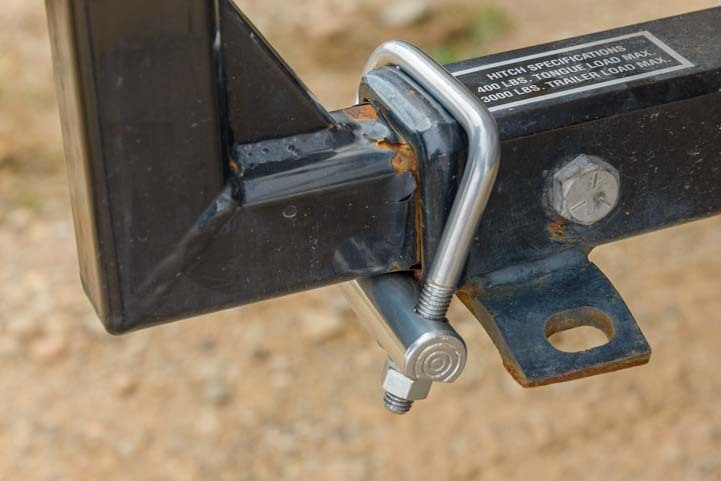 Hitch tighteners at the top and bottom of the hi-low hitch riser extension. 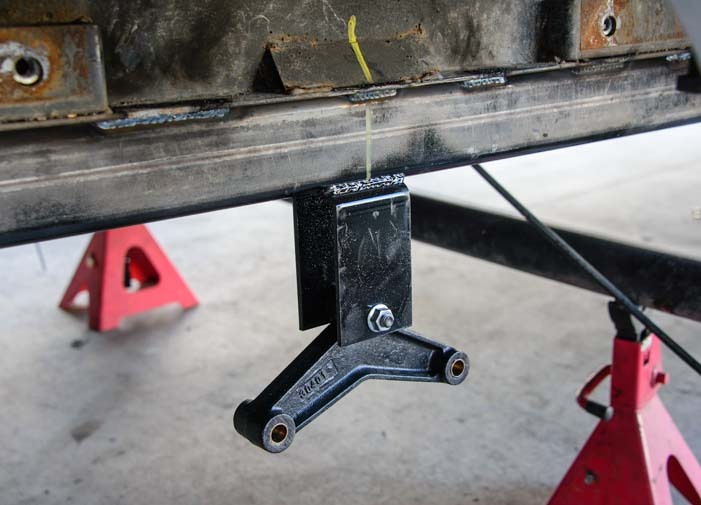 But unlike the shim solution we’d used before, these hitch tighteners have stayed tight without needing any adjusting or fuss for several months and several thousand miles of driving on all kinds of roads. 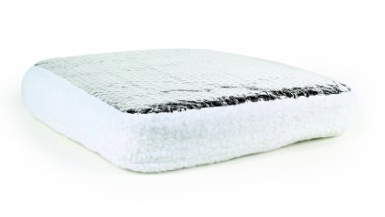 The whole system is completely rigid now and has not needed any adjustments in six months of use. 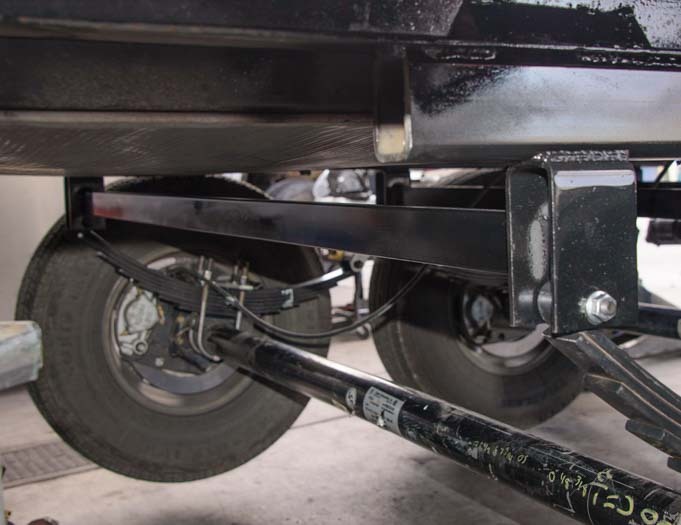 The hitch tighteners do make for some extra steps if we want to move the bike rack from the hitch receiver on the trailer to the hitch receiver on our truck. 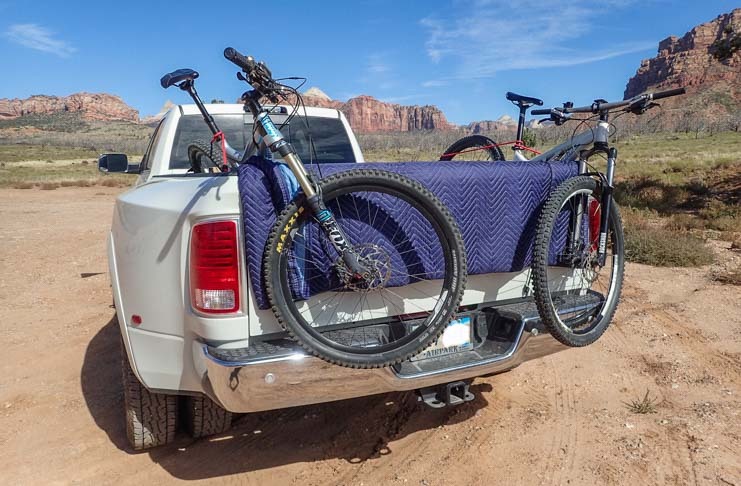 However, we’ve started hauling our bikes in our truck in a different way using a furniture blanket, so there’s no need to take the bike rack off the trailer any more. An easy way to get the bikes from the trailer to the trail head! 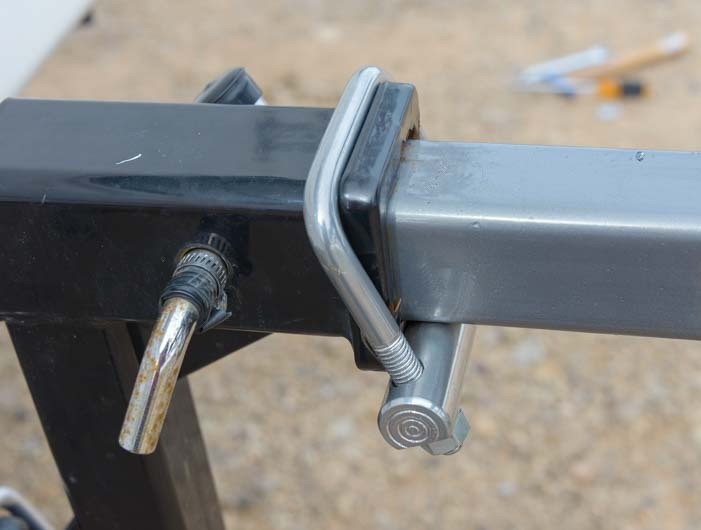 Jack makes these hitch tighteners in batches, so if you are passing through Blanding, Utah, perhaps on your way to or from the beautiful Natural Bridges National Monument, just a mile or so south of Blanding you can stop by JM Custom Welding and pick one up! In 2016 the were $38 apiece. 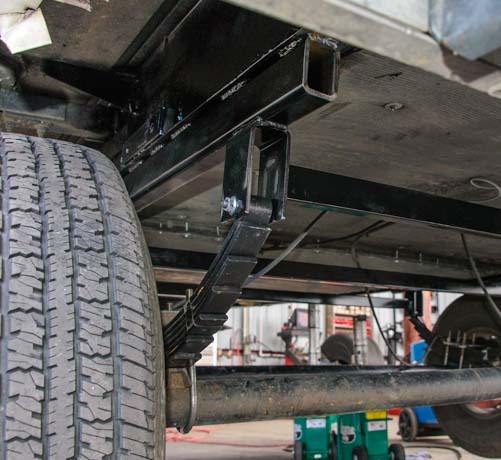 We discovered later that hitch tighteners of various kinds are also commercially available. 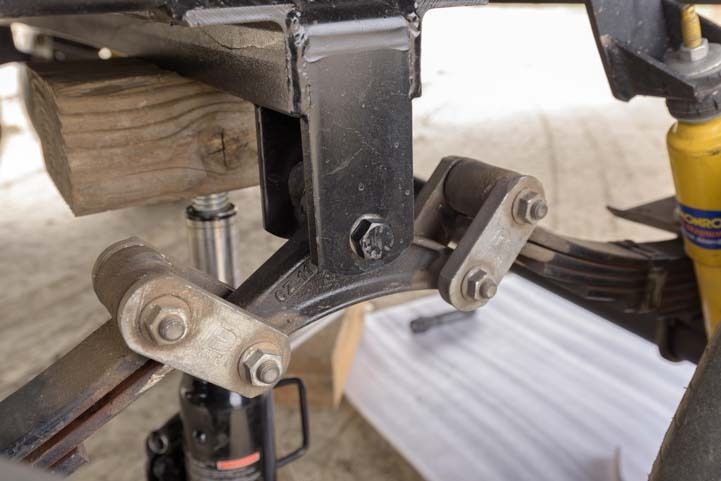 So, if Blanding, Utah, isn’t in your sights, you can choose from many different kinds of hitch clamps online. 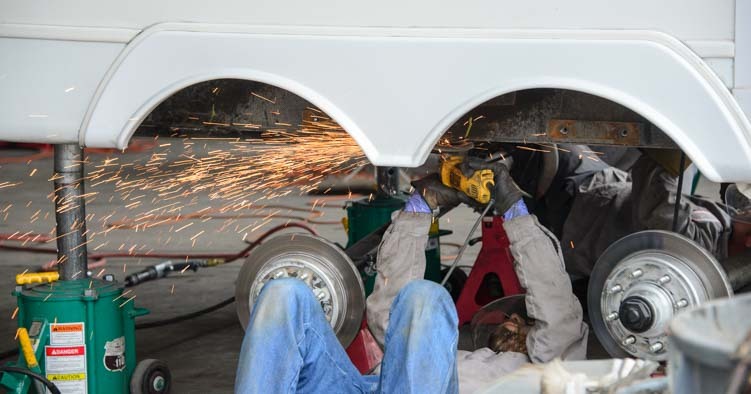 However, a visit to Jack’s welding shop is very worthwhile, especially if you need any kind of custom metal fabrication done on your RV. He is very creative and does excellent work. While we were in Jack’s office, we noticed a display of his for a folding storage solution for the beds of pickup trucks he’s created that fits right behind the truck cab. He calls it the “Jack Pack” and it is essentially a framed canvas storage bag the width of the truck bed that is easily opened to throw your bags of groceries into and then easily folded away when you need to haul lumber or fill the truck bed with something else. If we didn’t have that part of our truck filled up with extra water jugs, we would have snagged one of those from him at the same time! We’ve got a few more links below. Mountain Biking – Mountain biking is a great way to find the Fountain of Youth! 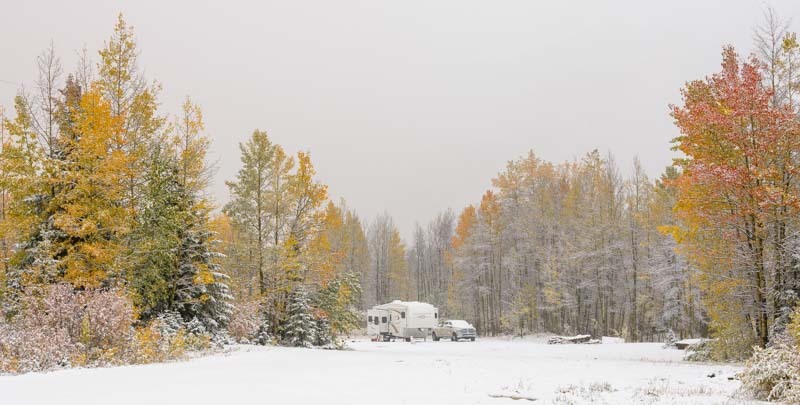 Heating an RV in cold weather during the winter, especially in a snow storm, is quite different than heating a house, and it often requires utilizing different kinds of heaters and a little creativity too. Is that SNOW??!! We sure didn’t expect THAT!!! 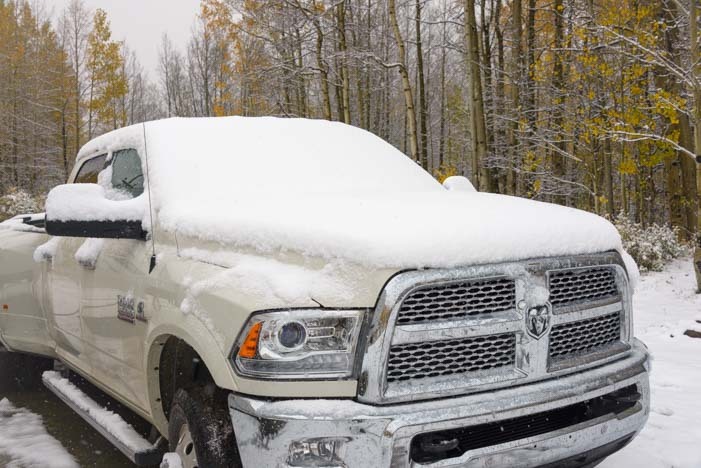 A few weeks ago, at the end of September, we woke up to find ourselves in a beautiful snowstorm at 10,000′ elevation in Colorado. We had to pull out all the stops to make sure we were cozy warm in our RV even though overnight lows were in the 20’s and daytime highs didn’t get out of the 40’s for a week. 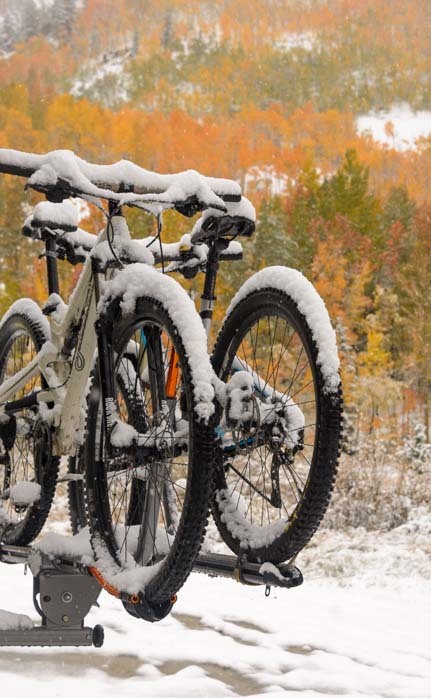 We looked out our back window and saw snow covering our bikes! The first order of business was to go outside and build a snowman, and Mark got right to it. It’s snowing!!! Let’s make a snowman!!! 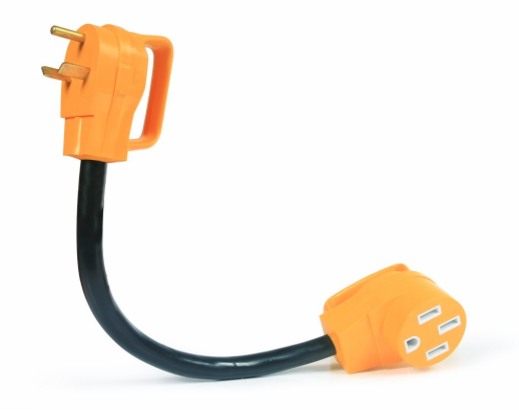 While he’s busy getting that snowman together, I wanted to share with you the strategies we’ve used for heating our RV without electrical hookups, because we use different heating appliances in different situations. 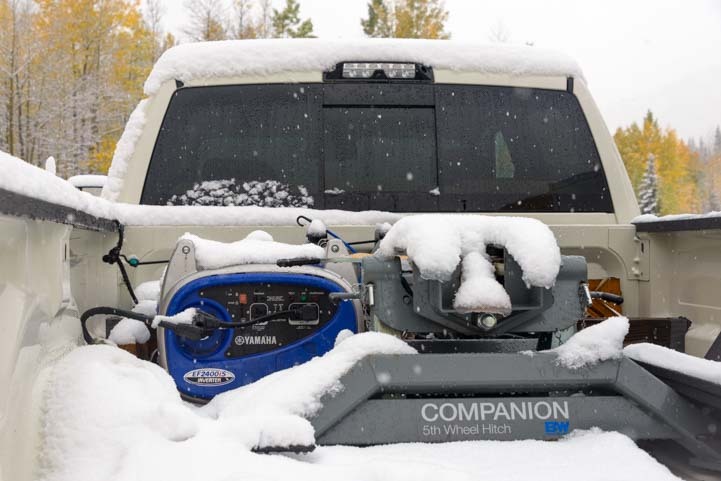 For “cool” conditions, like December and February in the Arizona desert or May in the Canadian Rockies, when lows are in the 30’s, keeping our buggy warm is a cinch with our blue flame vent-free propane heater that Mark installed back in 2008. 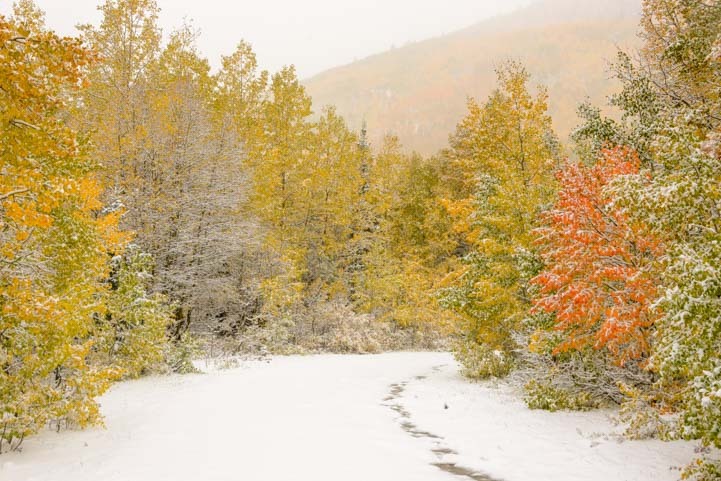 But in in “extreme” conditions, like this recent snowstorm on a mountaintop in Colorado, we use a different strategy and rely more on our RV furnace that was factory installed in our trailer. We have tried different strategies in very cold weather at very high altitudes like this in the past, and this most recent cold spell was our most comfortable, despite the wet gloppy mess of snowy covered jackets, hats, mittens and boots and the sullen gray skies that persisted for several days. So, we seem to have gotten it right this time. Of course, “lows in the 20’s” is far from “extreme” for North Americans living in houses with central heating, but it definitely feels extreme when living in an RV off the grid. 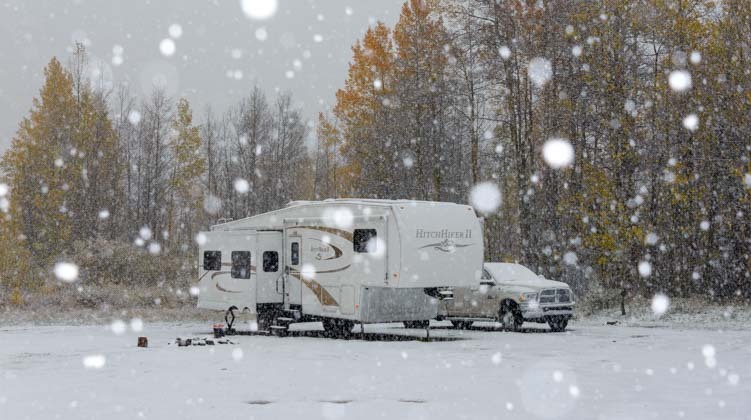 In reality, RVs are most comfortable in temperatures that stay above freezing. 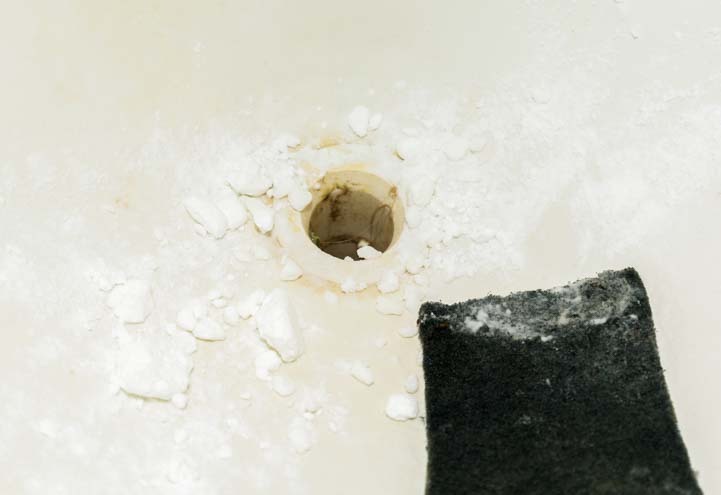 Even though high end RVs are marketed as being “four season” coaches, boasting high R-factors in the walls, ceiling and floor, you just can’t compare 1.5″ styrofoam walls that have a thin layer of gelcoat and wallpaper board to a residential house wall that’s made of 3.5″ fiberglass insulation covered with a half-inch of drywall, half-inch of plywood, Tyvek and exterior siding. 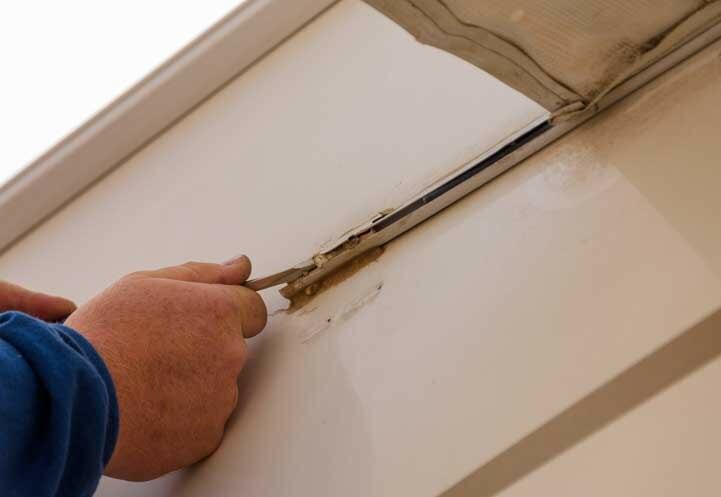 Besides the skimpy walls, we find that the RV windows are the biggest reasons for the poor insulation. The metal window frames are extremely cold to the touch when temps outside are in the 20’s, and all that metal around our many windows conducts the cold right into the rig. Some folks like to have thermopane (dual pane) RV windows, but if moisture gets between the two panes, which can happen more easily in an RV that rattles down the road all the time than in a house that stands still on its foundation, the moisture is likely to remain there permanently, no matter what the weather does outside or how many years go by. RV windows don’t seal all that well either. 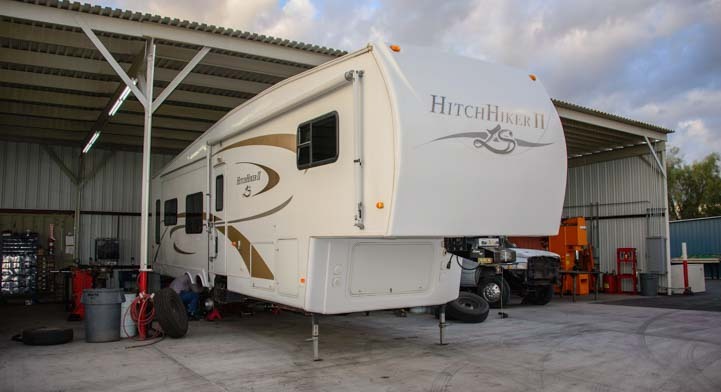 Our top quality, four season fifth wheel trailer is downright drafty inside, with a definite breeze that can, at times, flutter a tissue by the “escape” windows. You don’t notice it so much when it is 70 degrees both outside and inside with no wind blowing. But when it is a blustery18 degrees outside and we are trying to heat the rig to 65 degrees inside, the breeze by those windows is a shock. The microwave vent is another drafty spot, and if the wind is howling outside and blowing directly on that wall of the RV, it blows right into the kitchen through the vent holes on the top of the microwave. One solution for that, of course, is to tape over the vent on the outside of the rig and not use the microwave for the duration of the cold snap (we haven’t done that, however). The snowman gets a hat! 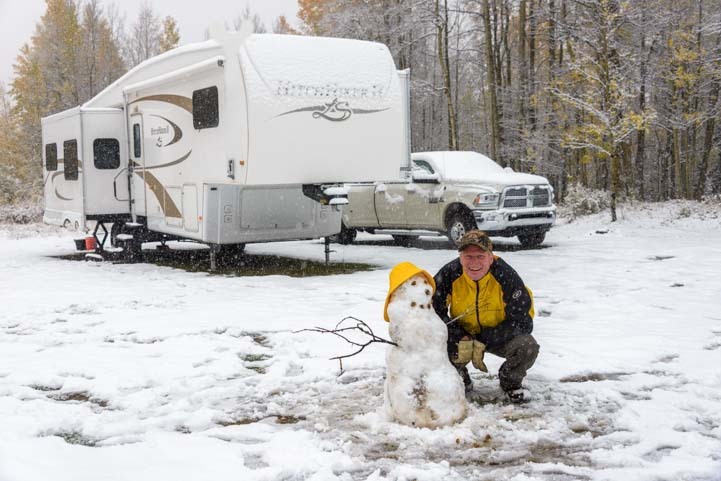 So, in our experience, keeping an RV and everything in it toasty warm when it is snowing out can require a little creativity. 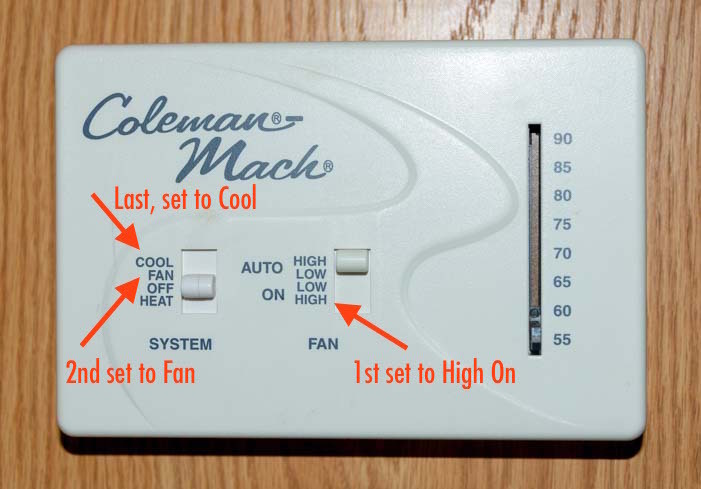 Back in our house living days in snow country, we would set the thermostat to our preferred indoor temperature and keep it there 24/7, perhaps raising it slightly at the breakfast and dinner hours and lowering it slightly while we were at work or asleep. When a blizzard blows into our RV lifestyle nowadays, we can have that kind of stable heat in our rig if we plug into shorepower with access to unlimited electricity. 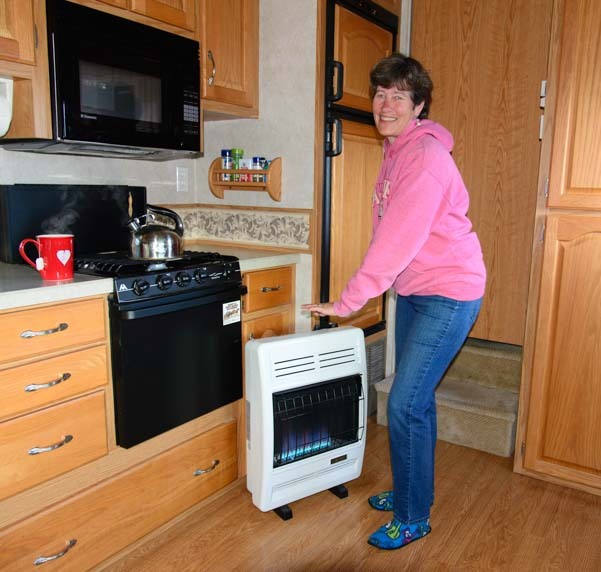 Portable electric heaters can back up the RV furnace, and RVs that have an air conditioner with a heat pump can use that (ours doesn’t). We have a portable electric ceramic heater for just such an emergency where going to an RV park and plugging in is our best line of defense for weathering a storm. However, it is possible to stay warm without hookups, even when it starts snowing. 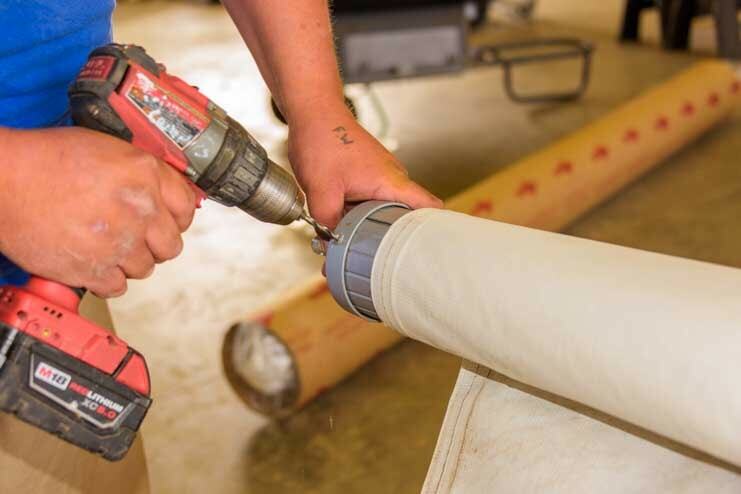 We rely on our vent-free propane heater for 95% of our heat year round. These little heaters use propane very efficiently, don’t need any electricity to run, and can be installed in an RV permanently to run off the RV’s propane tanks. There are also handy portable models that can be stored in a closet when not in use and then placed anywhere in the rig where you want a little heat. These run on disposable propane bottles, so it isn’t necessary to plumb the heater to the RV’s big propane tanks. 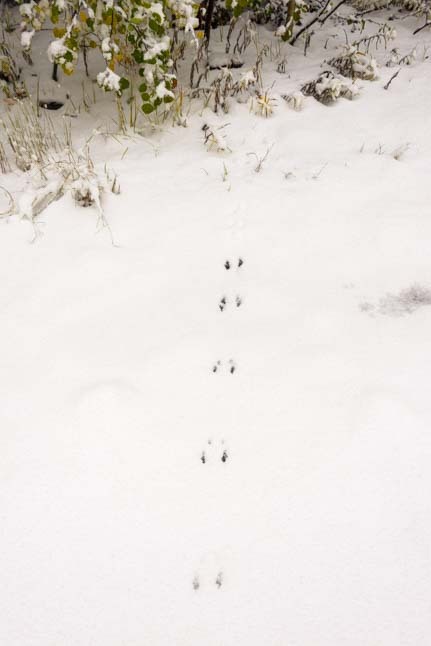 We found fresh animal tracks in the snow. These heaters heat the rig amazingly quickly. We find that our 20k BTU blue flame heater warms our rig at a rate of about one degree every two minutes. So, in twenty minutes we can warm up our home by 10 degrees, and in an hour we can raise the inside temp by 30 degrees. The best part is that we can hover over it and warm our hands, bodies and clothes, just like standing in front of a woodstove or fireplace. We do that a LOT and totally love our little heater for the terrific blast of instant hot air it provides!!! When you’re chilled, there’s nothing like hovering over this heater! We use our blue flame heater year round, and we have used it at elevations ranging from sea level to 10,000′. This past year we traveled primarily in cold places where overnight lows were in the 30’s and 40’s. We went north through Utah, Idaho and Montana in March and April and spent May and early June in the Canadian Rockies. Consequently, we saw quite a bit of snow and hail, and during those months we used our heater almost every day. 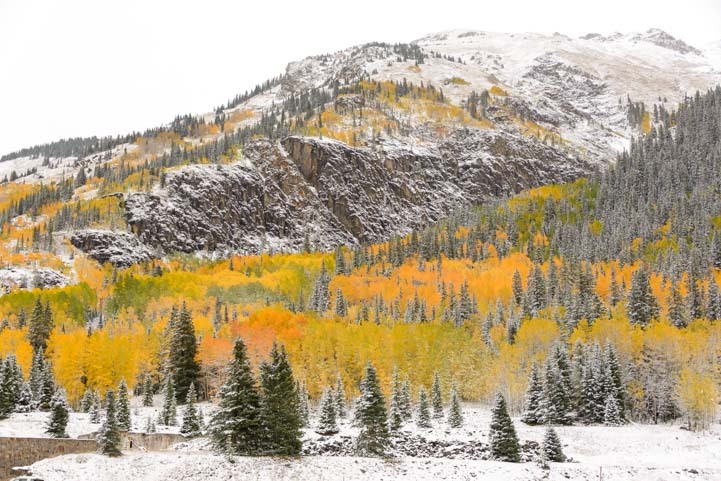 The snow in Colorado fell for hours and gave us a beautiful winter wonderland — in September! 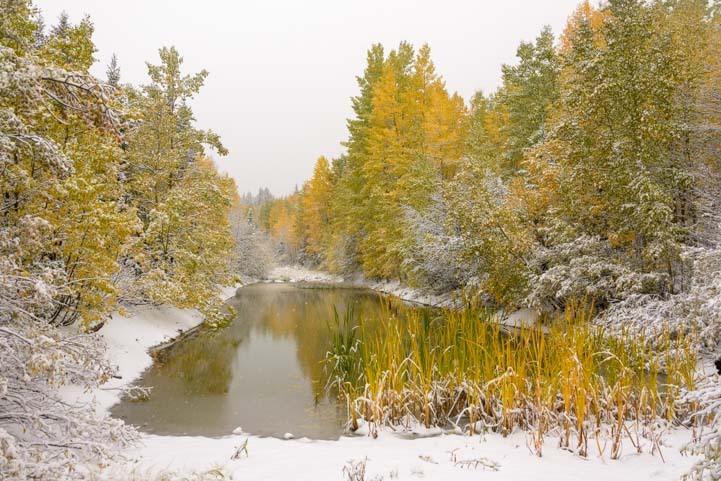 Fall colors with snow – Magic! 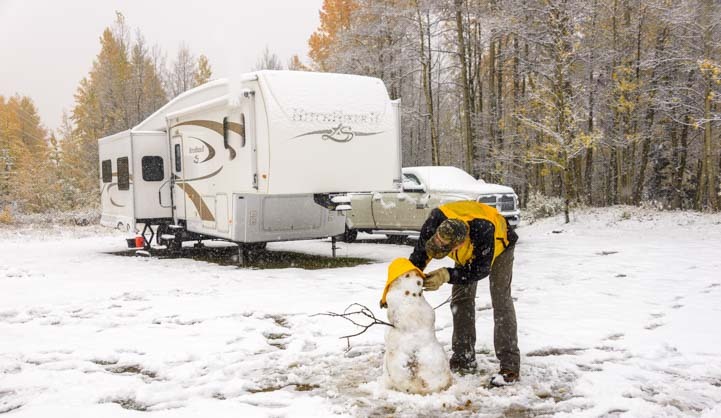 We thawed out in July long enough to get overheated and write a blog post: “How to Beat the Heat in an RV.” Then it was back to the high elevations of Utah and Colorado in mid-August where we saw more hail and overnight lows in 30’s once again. Our vent-free blue flame heater has been keeping us warm during all four seasons like this since Mark installed it in 2008!! It was really cold, but it was so beautiful we didn’t mind!! — The ventless propane heater is awesome as long as there is sufficient oxygen for it to run. 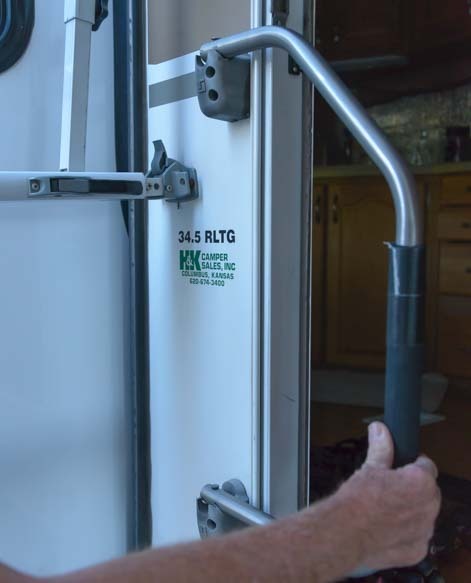 We like to use it in the mornings and evenings, and since we are in and out of the rig a lot, there is a lot of air exchange inside our RV from opening and closing the front door all day long as well as from all the drafts and breezes that blow in the RV windows and microwave vent. 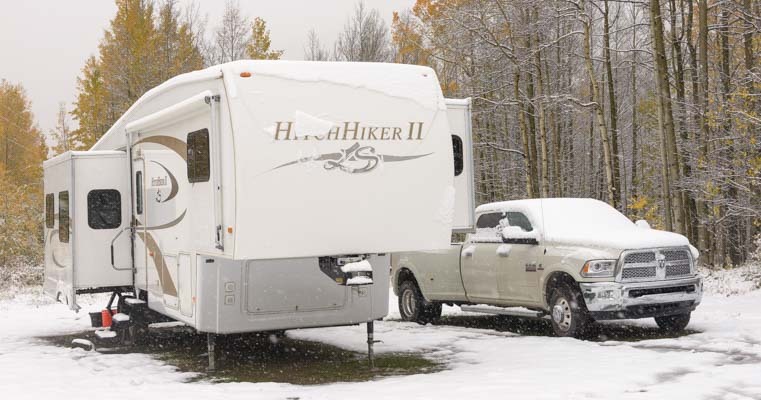 — The RV furnace is best for other scenarios: in cases where there is a risk of the water pipes freezing (the hot air ducts keep the basement and water lines warm), at very high elevations in extreme cold, and at night, because it is vented and continually circulates the air in the rig. The RV furnace is very loud and tends to wake us up at night, however, so we don’t use it overnight very often. So, we use our vent-free blue flame heater for 95% of our RV heating, and we turn to our RV furnace on rare occasions. 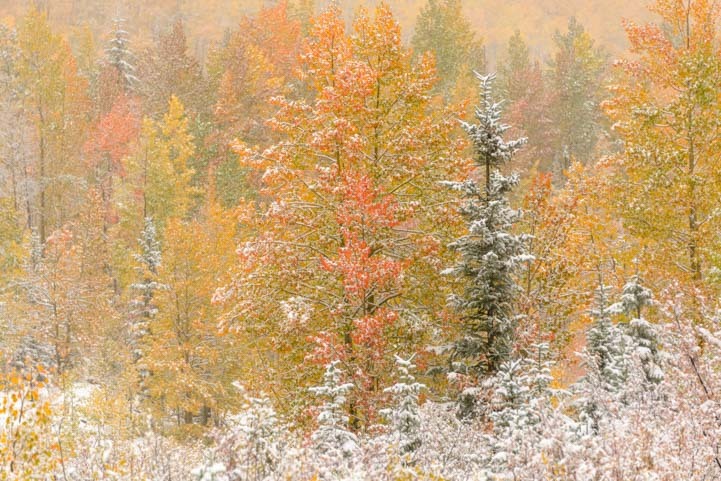 Fall colors and snow — a gorgeous combinations! This snowfall was definitely sticking around a while! 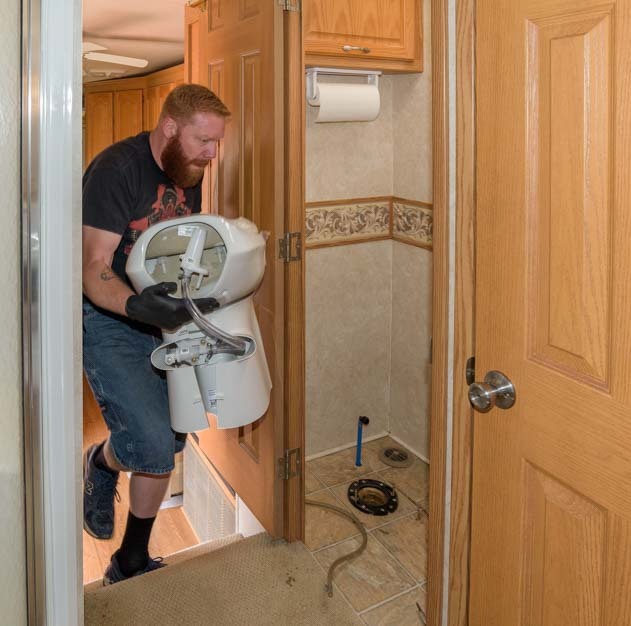 An RV furnace is a vented system, meaning that it releases warm, moist air from inside the RV to the outside, and it brings cold air from outside to the inside of the rig. This makes it very inefficient in its use of propane, because it is essentially heating the outdoors as well as the indoors. Put your hands by the RV furnace vent outside, and they will get nice and warm and a bit damp too! While RV furnaces are safely vented yet very inefficient, vent-free gas heaters are very efficient and are required by law to have an automatic shutoff when the available oxygen goes below a certain threshold (there is a built-in sensor that triggers the shut-off). We know when ours is about to shut off because the flame begins to sputter and make noise. Once it has shut itself off, it won’t turn on again until we air out the RV a little by opening the door or windows for a while. Ironically, propane RV stoves and ovens are not required to shut off automatically when the available oxygen is depleted. To me, this makes them inherently quite a bit more dangerous than vent-free propane heaters. Of course, an RV fitted with propane tanks is basically a rolling bomb, so it’s a very unsafe place to call home (I say this with a smile, because we wouldn’t trade our 9 years on the road for anything)! Every time we have seen our blue flame heater shut itself off (probably 30+ times), the RV stove and/or oven has kept right on a-cookin’ without any hint that our supply of oxygen inside the rig was running out. We could easily have baked something in our factory installed propane RV oven and simmered something on our factory installed propane RV stove for hours while camped at 10,000′ with no inkling that the oxygen in our rig had dipped below safe levels! Which Heater is Best Under Which Conditions? For most of this year as we traveled in cold country, the lowest temperatures we saw were in the low to mid 30’s overnight. Daytime highs were in the mid-60’s to mid-70’s. These kinds of conditions are very similar to what we see in the southwestern deserts in the winter months (except January, which can be colder). These conditions are ideal for a vent-free propane heater. We usually run our vent-free propane heater every morning until the rig is 60 to 75 degrees inside (depending on our mood) and then again in the evening if the temperature inside has dipped below 65. If the windows have fogged up from condensation (about 5% of the time, usually only in the winter), we run the RV furnace too to help dry the air out. 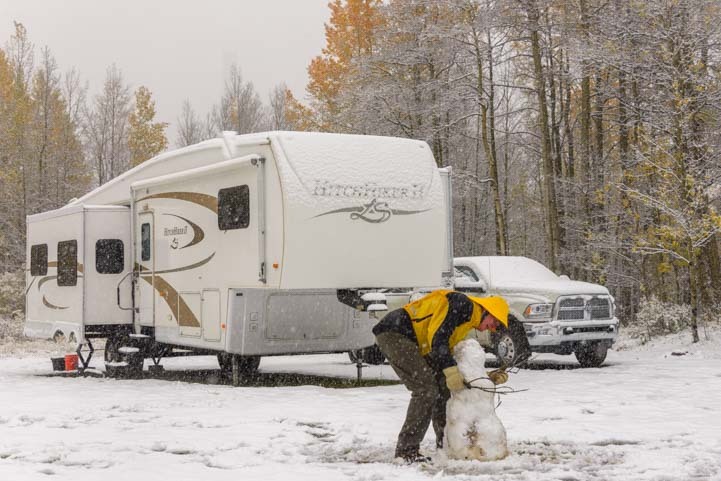 In general, we don’t heat our RV overnight in this kind of climate. We prefer to bundle up with down comforters instead. If we do run the heat at night, we use the RV furnace and set it to 50 degrees. If outdoor temps drop into the 30’s overnight, the RV furnace will come on once or twice in the pre-dawn hours. 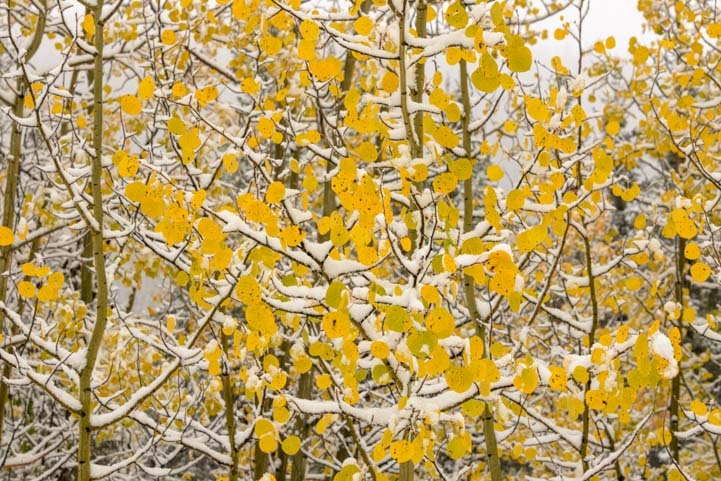 Golden aspen leaves in snow. Ironically, if the outside temps dip really low — into the 20’s or teens — and daytime highs don’t get much past 50 degrees, then the RV furnace will start coming on before midnight and will come on every hour for 15-20 minutes as it struggles to keep the rig at 50 degrees. Since we are light sleepers, this is extremely annoying. So, at the times we would want to run the RV furnace most — overnight when it’s really cold — we opt not to! On overnights that we don’t heat the rig, when we wake up in the morning our bedroom is around 10-12 degrees warmer than the outside air (bedroom door closed all night) and our living area is around 5-7 degrees warmer than the outside air. It is routine for us to wake up to temps in our trailer that are between 37 and 42 degrees. 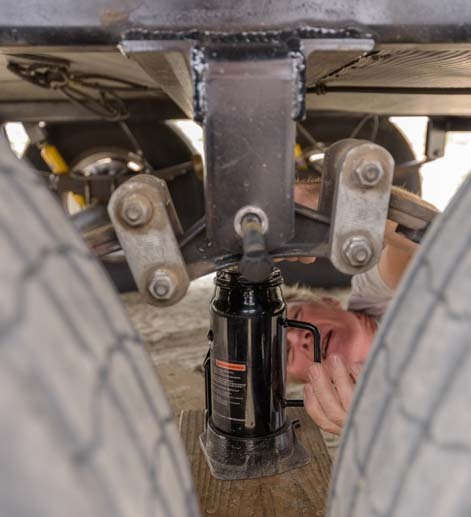 For us, that is a small price to pay for living off the grid, however, for many RVers it is good reason to get electric hookups and have more substantial and consistent heat in the rig overnight. The colors of Fall in Colorado. There is a lot of debate about whether you can operate a ventless propane heater at high elevations. 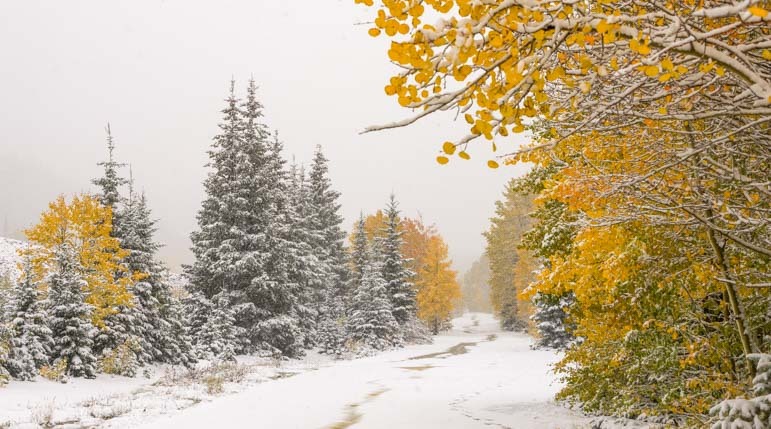 By the time we got caught in that September snow storm in Colorado two weeks ago, we had been living at elevations between 8,000′ and 10,000′ for 5 straight weeks, running our vent-free propane blue flame heater every morning and evening without a hitch. Along with many weeks spent heating our rig at high elevations in previous years, including 8 weeks or so at 6,000′ or higher this past spring, our 5 weeks at 8 to 10 thousand feet this fall kind of proved the point for us: it’s no problem to run a vent-free propane heater at high altitudes in cool weather. But in sub-freezing overnight temperatures and daytime highs in the 40’s under stormy skies at 10,000′ elevation, we’ve found a vent-free propane heater is best used in combination with the RV furnace. 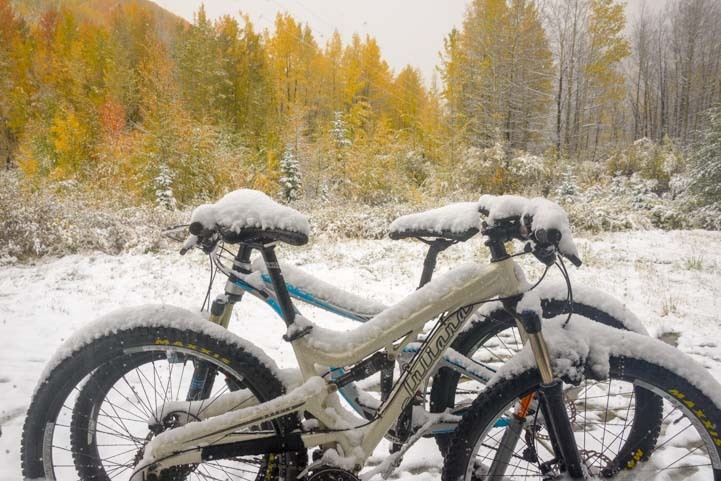 Well, we won’t be biking any time soon!! Until the the snowstorm came to our mountaintop spot in the Colorado Rockies at 10,000′, we hadn’t been using the RV furnace at all. But once the temps dropped to the 20’s (lows) to 40’s (highs) at that elevation, we couldn’t rely on our blue flame heater exclusively any more and had to change our heating strategy for three reasons. 1) There is less available oxygen at 10,000′ than at lower elevations, and once the oxygen in the rig dipped below a certain level, the blue flame heater would shut itself off automatically. Because it was so cold outside, we weren’t thrilled about opening the windows and doors to let in more air just so we could turn on the blue flame heater again. It was time to use the RV furnace. 2) Our RV roof and ladder — along with our solar panels — was covered with snow and ice. Mark wasn’t jumping up and down with excitement to climb up there to clear off the solar panels, and I wasn’t about to get up on that slippery roof either. So, our batteries were no longer getting charged by the sun and wouldn’t have enough juice to run the RV furnace. 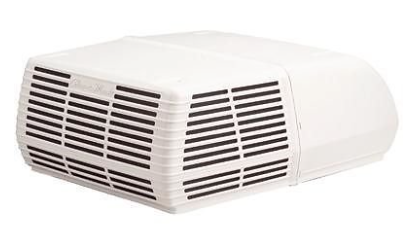 3) Vent-free propane heaters emit a lot of moisture. We had just had several days of torrential rain, and everything in our rig was wet. Our shower was filled with raincoats and rain hats hung up to dry, our boots and socks were wet and muddy by the door, our pants were wet and hanging in the bathroom and our bath towels refused to dry. While our blue flame vent-free heater would exacerbate the moisture problem, our RV furnace would help dry out the air inside our buggy. Doing all these things gave us a nice dry and toasty warm environment to live in during this cold spell in snowy conditions at 10,000 feet. To implement this heating strategy, we did two things. 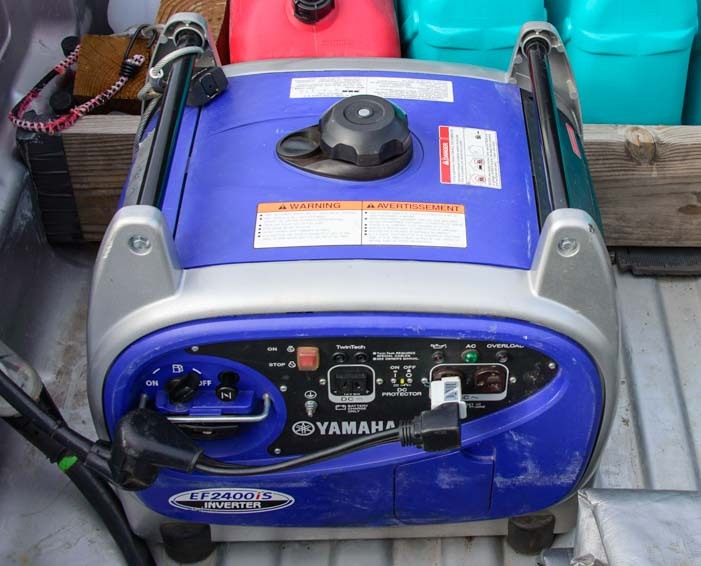 We stocked up on gasoline and propane and ran our Yamaha 2400i generator and RV furnace a lot. Sometimes we also ran the blue flame heater alongside the furnace. Our Yamaha generator got a good hard workout for over a week. The generator ensured that the batteries got fully charged. Because we were running our RV furnace so much, which burned up lots of electricity, the batteries were being depleted much faster than normal. So, not only did we need the generator because the solar panels were snoozing under the snow and ice, we also needed it because of running the RV furnace. A few weeks prior we had been roasting in the summer heat. What a crazy life we live in this RV!! In general, we ran the RV furnace every morning until the rig was 65 degrees inside and then ran it on and off during the day and in the evening. If the air wasn’t too moist, we also ran blue flame vent-free heater alongside the furnace to warm things up faster. The vent-free propane heater never shut itself off, so the RV furnace was doing its job of circulating the air. Getting creative heating our RV made it possible to enjoy views like this as it snowed. Using the RV furnace also lessened the possibility of the water pipes freezing. The heater is ducted through the belly of the rig, and the warm air passing through the ducts helps warm the nearby water and sewer pipes. If the temps had gotten below 20 degrees, we would have run the RV furnace once or twice overnight as well just to be sure no ice formed in the pipes. If we had had brilliantly sunny days every day, we may or may not have needed the generator. Our 490 watt solar panel array may have been able to charge the batteries fully, despite the additional load from the RV furnace. Also, we probably wouldn’t have needed to use the RV furnace so much because the sun would have warmed up our rig and dried it out a bit during the day. See how flexible and variable all this is??!! 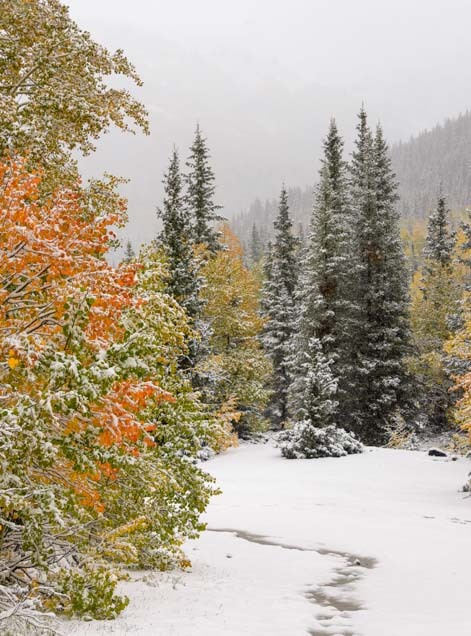 This is why we came to Colorado at this season… Wow!!! We have descended out of the clouds now and have been living at elevations between 5,000′ and 6,500′ for the past few weeks. The RV furnace is back on vacation and our trusty blue flame heater has taken over all the RV heating duties. Our generator is on break for another 6 months or year, and the shore power cord is buried somewhere in the basement once again. Snug as a bug in a rug!! 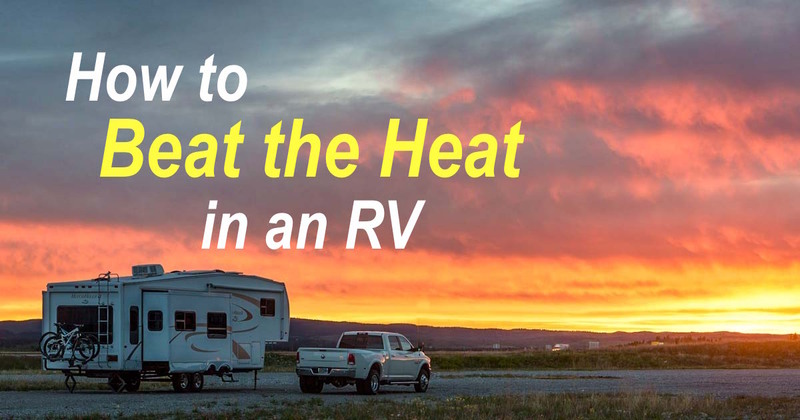 There are a lot of ways to beat the heat in summertime when you’re traveling in an RV. The most obvious is simply to head to a cool place when a heat wave hits. 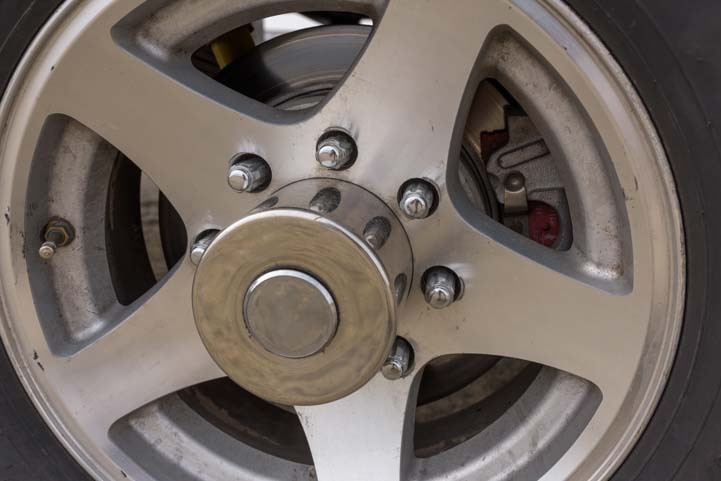 Afterall, your home has wheels! Cooler places are located either in high elevations, and/or up north, and/or by a big body of water — the ocean or a lake. This may seem simplistic, but places in the eastern states like Acadia National Park in Maine, where you might get out on a boat, or the White Mountains in New Hampshire where you might catch a cool train ride to the top, are good bets. 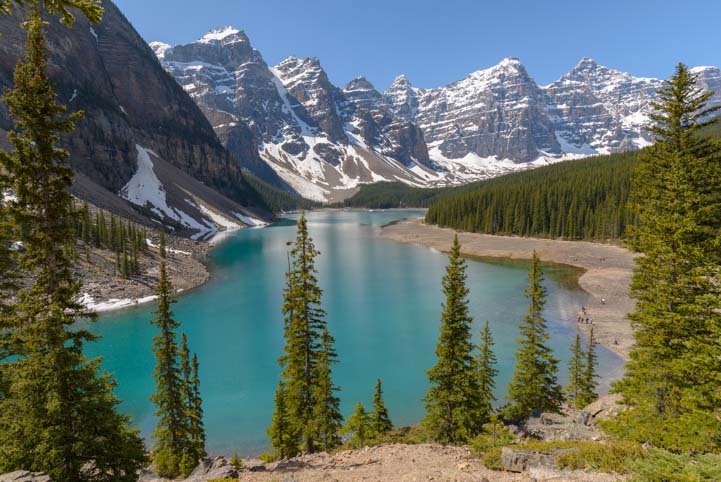 Moraine Lake in Banff National Park is a cool place, even mid-summer. In the west, the key to temperature is elevation. 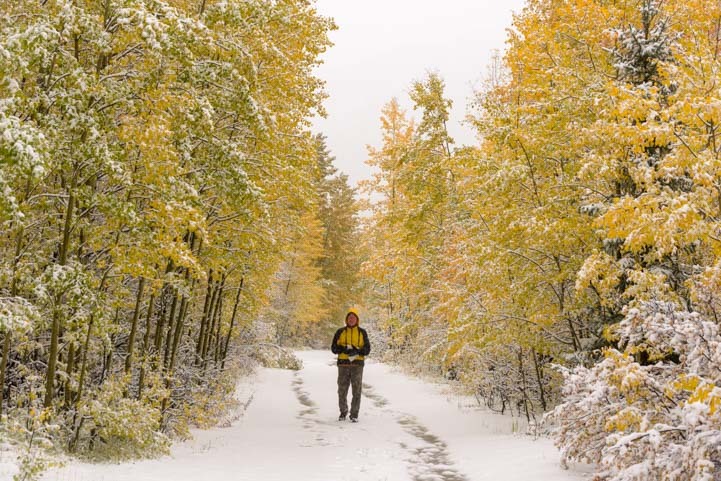 Many folks who are new to the western states are surprised to find out that there can be a 20 degree difference in temperature between two places that are just 150 miles apart. 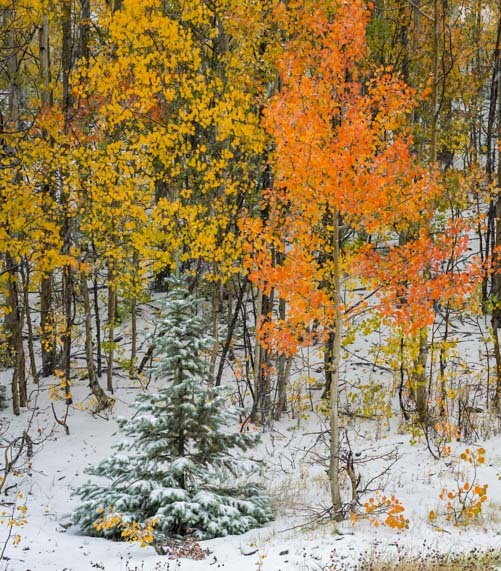 For instance, Phoenix, Arizona (1,100′ elevation), is 20 degrees hotter than Flagstaff, Arizona (6,900′ elevation). And the North Rim of the Grand Canyon (9,000′ elevation), (about 200 miles further away) can easily be another 10 degrees cooler than that. Likewise, Stanley, Idaho is about 15 degrees cooler than Boise, Idaho. It is just a few hours north but is 3,500′ higher up. In Utah, Zion National Park (3000′ elevation) is 10 degrees hotter than Bryce National Park (9,000′ elevation), and if that’s still a little toasty, a run up to Cedar Breaks National Monument (10,000′ elevation) will be just a bit cooler still. Camping near trees in the mountains is pretty cool! 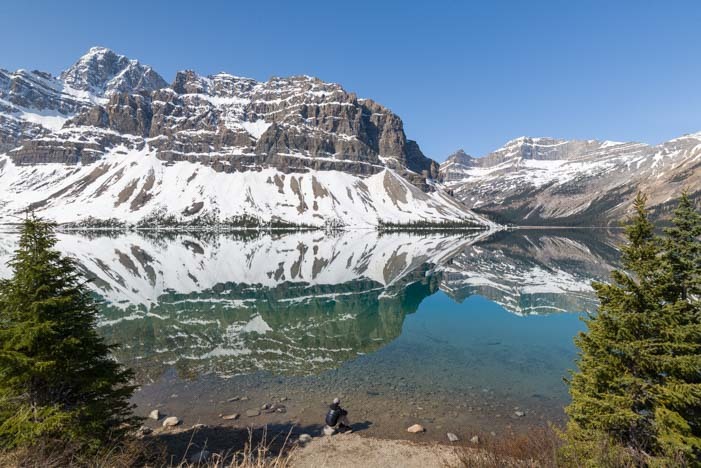 Generally, you can’t go wrong in the Rocky Mountains, and a trip to Ouray, Colorado (7,700′), or Banff National Park in Canada will definitely be much cooler than most other places when a heat wave buries North America. Similarly, the coasts enjoy wonderfully cool sea breezes. The whole west coast, from San Diego to the Olympic Peninsula in Washington is much much cooler than the communities that lie directly inland (over the coastal mountains), 150 miles from the coast. Life is definitely cool at the beach (Lake Pend Oreille, Sandpoint, Idaho)! Bandon, Oregon, on the Pacific coast is 15 degrees cooler than Bend, Oregon, which is in the inland desert, baking away behind the range of coastal mountains that stop the flow of cool air coming in from the Pacific. If the ocean isn’t easily accessible, spending time near a big lake can do the trick. Want to get cool? Find your inner child and play in the water with a toy wagon. Large lakes offer “sea breezes” in the afternoons, and many lakeside towns have fantastic waterfronts, like Seneca Falls, New York, in the Finger Lakes, and McCall, Idaho, on Payette Lake. The worst part of the day is the late afternoon and evening, and that’s a great time to get out of the rig. A late afternoon or early evening outdoor picnic under a shady tree in a place with a breeze or cool grassy lawn will work wonders. A trip to the air conditioned library or bookstore with a little cafe inside can be a delightful change of pace. A hot afternoon is a perfect time to take in a matinee at the local cinema. If the laundromat is air conditioned, the heat of the afternoon might be the time to get that chore done, or if your laundry is already clean, doing the week’s grocery shopping could give you an hour or two of air conditioned respite at the supermarket. Sometimes, it’s just too darned hot to survive without air conditioning, and in that case it’s really nice to turn it on. We boondock every night, and we have just 490 watts of solar power on our RV roof and 434 amp-hours of battery capacity in the basement. Our generator gets a good workout a few times a year running our 15k BTU air conditioner. This RV roof AC unit takes some oomph to run! So, the only way we can get air conditioning in our trailer is to drag out our Yamaha 2400i gas generator and set it up to run our Coleman 15,000 BTU air conditioner. Some folks say this can’t be done, but we’ve been doing it for years. 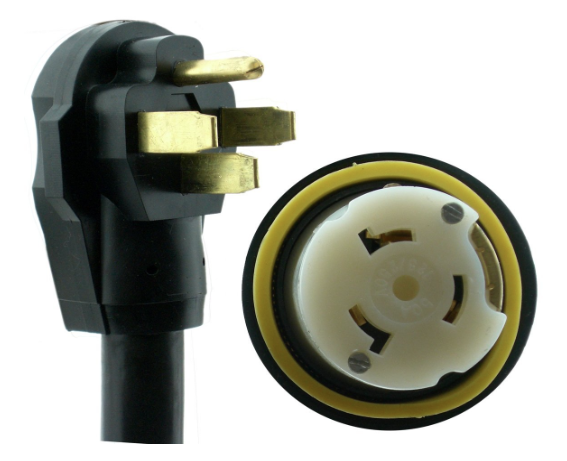 We use a variety of adapters to plug the generator into the shore power outlet on the outside of the rig. 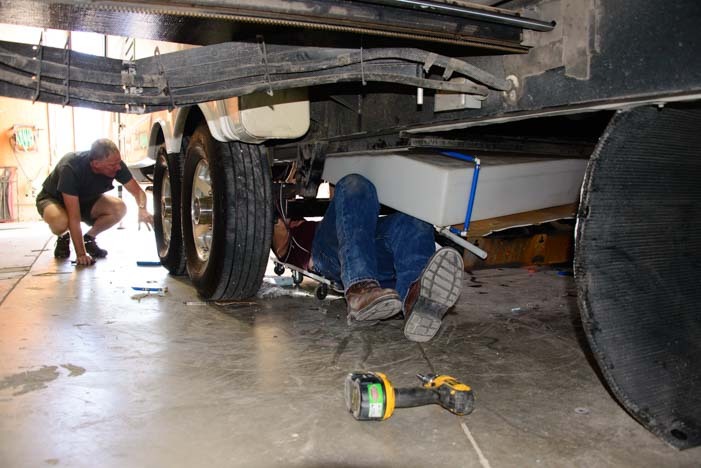 When the generator is powering the RV this way, the generator supplies power to the converter inside the trailer (or inverter/charger), which charges the batteries as efficiently as possible using a multi-stage charging algorithm (if the converter or inverter/charger is a “smart” charger). Make sure the genny is warm and let it power the fan on high for a while first… THEN switch on the A/C. If the last step trips the breaker on the generator, set the System button back to Off, restart the generator and try again. On a few occasions it has taken us 2-3 tries to get the air conditioner going. However, most of the time it fires up on the first try. We always run it for 4-6 hours when we turn it on, and it purrs along just fine. However, we run the air conditioning just a few days each year. The rest of the time we stay cool using other means. 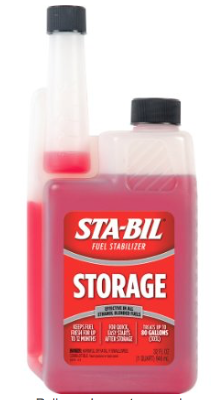 To keep the gas in the generator (and in the gas can) fresh and to ensure quick starts after storage and to prevent gumming and varnish, Mark puts the stabilizer Sta-Bil Gas stabilizer in the gas. The toughest time of day is the afternoon when the sun is in the southwest and western sky and is slowly baking the RV. Sometimes it seems to take forever for the sun to set while everything inside the rig quietly fries! No matter what the wall and roof insulation R-factor is for an RV, the windows are where all the heat comes in. So, keeping them shaded as much as possible throughout the day makes all the difference in the world. Every rig has a different arrangement of windows, but if you can position the biggest ones to face north or east and the smallest ones (or the wall with no windows if you have one) towards the west and southwest, the difference to the interior temperature will be astonishing. If there is a way to block the afternoon sun entirely by parking next to shade trees or a building, that is even better. 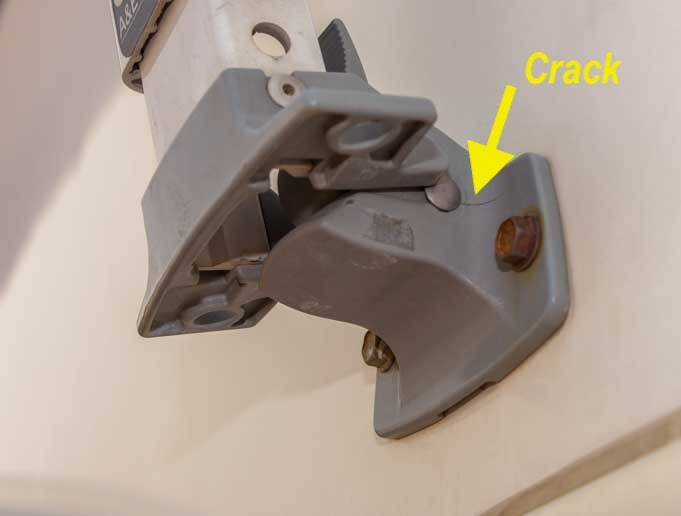 Even if the awning will only shade a small part of the RV’s walls and windows for a few hours of the day, this is still helpful! When an RV wall gets hot, you can feel the warmth on the inside of the rig. And you can especially feel it in the cabinets. There’s nothing like a hot bottle of olive oil in the kitchen pantry! Even though it’s shading just one small window, the awning is keeping the whole wall cool. Modern rigs have wonderful powered awnings, but ours is the old fashioned manual crank type of awning. The other day we heard two RVers complaining about how putting these old awnings out was really difficult and was a two man job. 1. 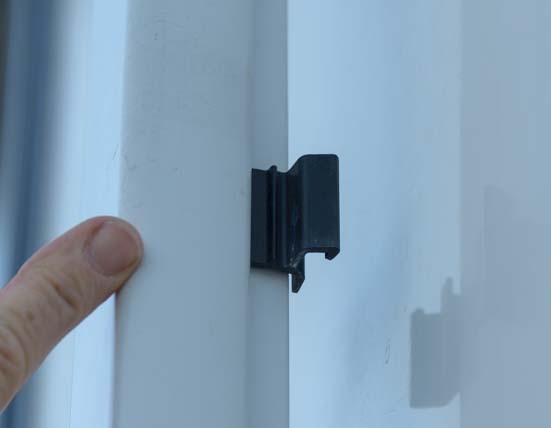 Unscrew the knob on the back of each awning arm. 4. Pull down on the lever to open it. 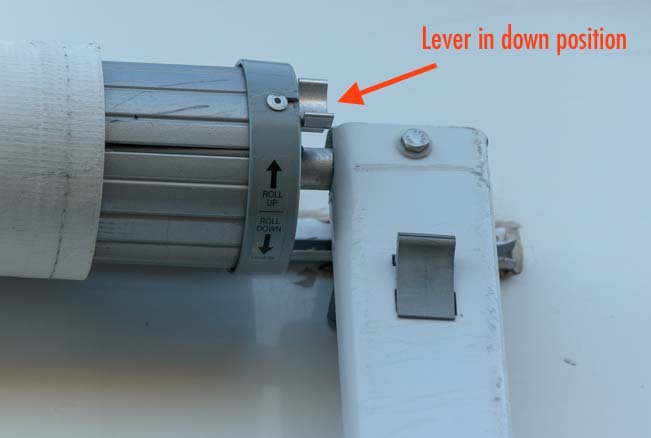 The roller lever is now in the down position. 10. 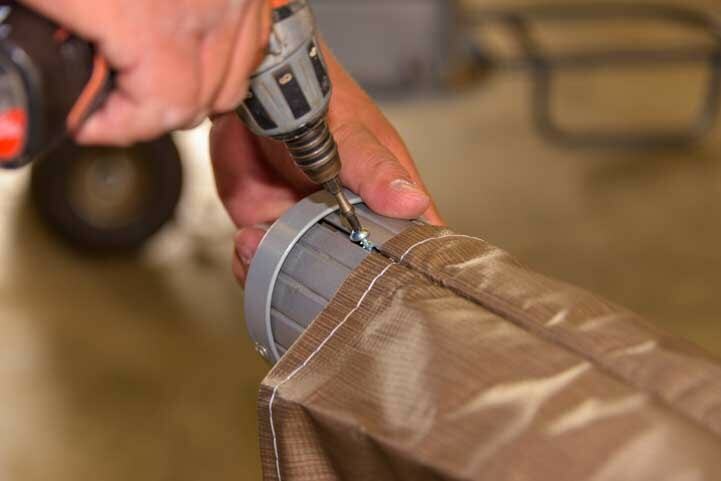 Pushing down on the awning arm to keep the canvas taught, tighten the knob. 11. 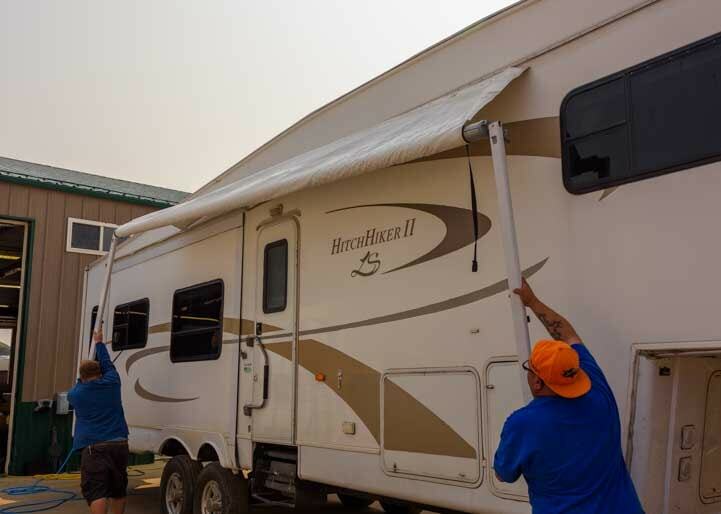 Open the big awning handle to raise the awning up. If it looks like it might rain, position one side of the awning a little lower than the other so the water will drain off of the awning. 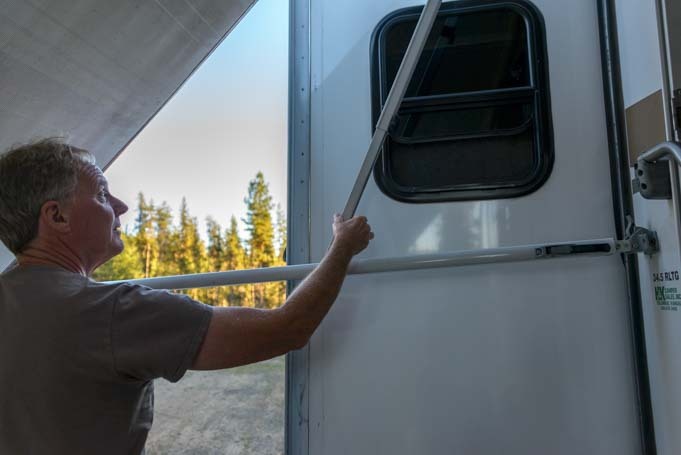 When Mark closes up the awning for travel, he puts velcro straps around the arms to keep them from accidentally opening as we travel. 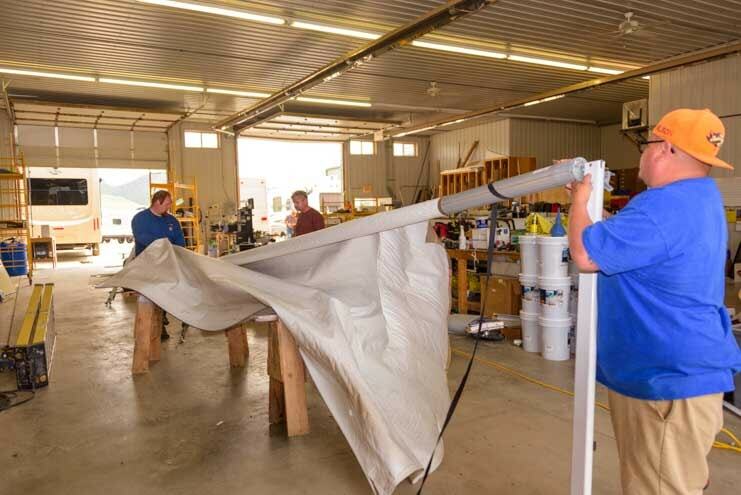 Another neat awning trick is to get an awning shade extension that drops from the edge of the awning to the ground. This provides shade from touching the rig even when the sun is at a low angle. 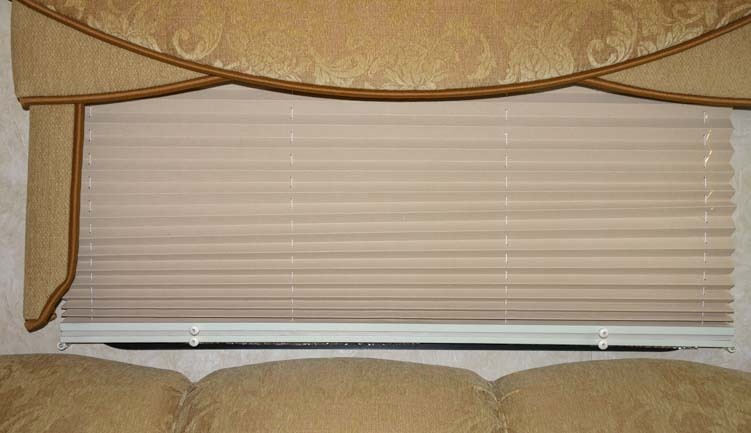 The day/night shades in most RVs are great for reducing sunshine in the rig, but do little for eliminating the heat that pours in through the glass and metal frame. Pulling down our night shades doesn’t block much direct sunlight. 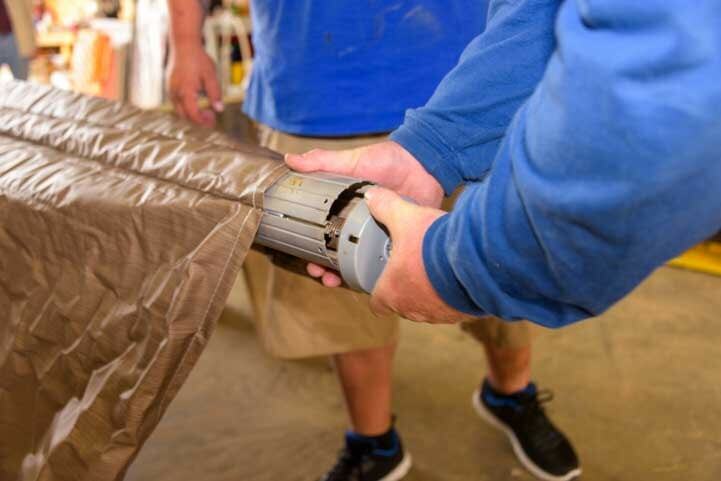 We cut Reflectix, which is a bubble wrap kind of aluminum foil that comes in a huge roll, to fit each window (a pair of scissors is all you need). We labeled each piece for the window it fits into. 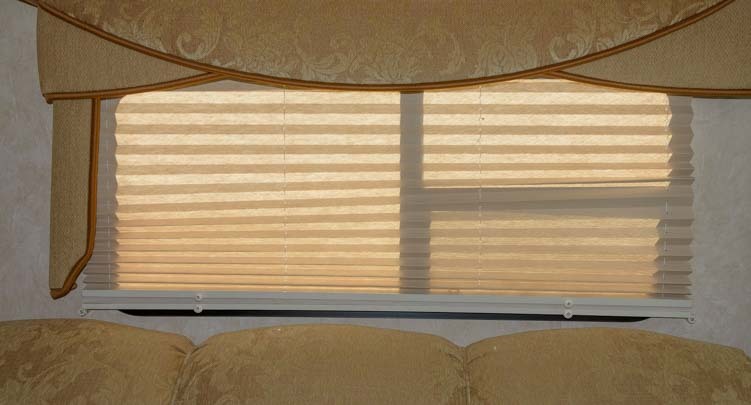 We raise the RV’s day/night shades, press the piece of Reflectix against the window, and then lower the shade to hold the Reflectix in place. A layer of Reflectix behind the shade blocks all the sun! 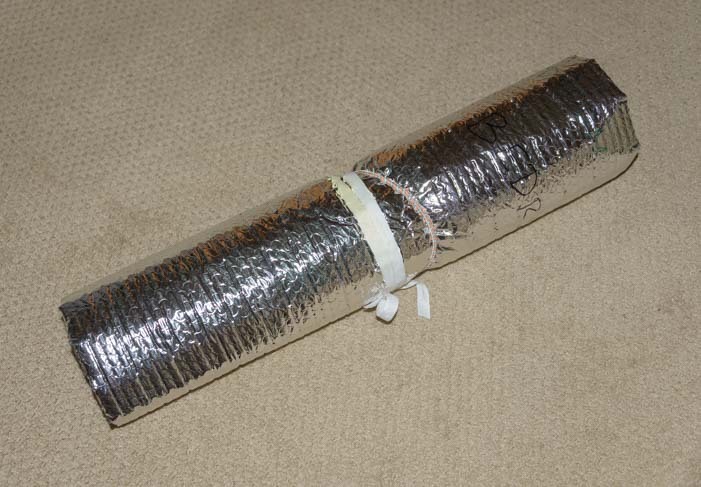 and put vent insulators in them. In our big rear window we jam a pillow under the large piece of Reflectix to hold it up. Otherwise it would drop to the floor. If we are going to leave the rig for a while, we close all the windows and put an RV Vent Insulator in each of the roof vents. It is amazing to come home after many hours of running around to find that the rig is still fairly cool inside. We rely on two different types of fans to stay cool. 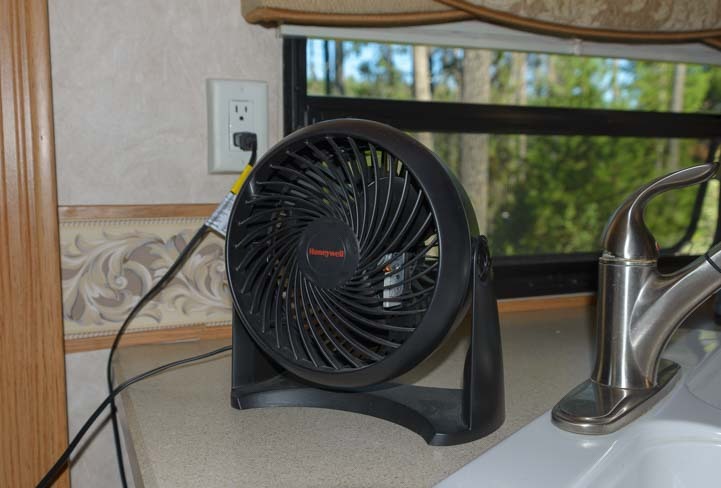 We have a Fan-tastic Vent Fan in two of our trailer’s four roof hatches. These are designed to push a maximum amount of air in or out of the rig. We set them to push the air out of the rig, and then we open the windows on the shaded side of the trailer to let the cool air from outside come in. 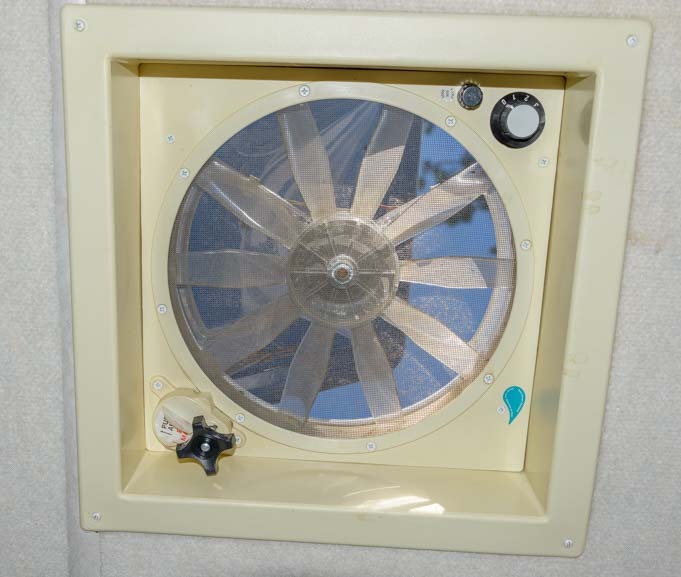 If we were to replace our Fan-tastic Fans, or if we wanted to upgrade another hatch to one of these or a similar type of vent fan, we would choose a very simple model that does just the basics. Our Fan-tastic Fans are whiz-bang models with remote control, rain-sensing, auto-opening, auto-closing, slicing and dicing and who knows what else. Unfortunately, they have minds of their own, and they won’t listen to reason. They auto open and auto close at the weirdest times, they don’t necessarily know when it’s raining, and they make it impossible for the mechanically challenged (ahem…me) to turn them on or off or to open and close them. There are way too many buttons that do way too many different things. Also, Mark has had to rebuild various parts of both of these fans, and by the colorful flow of expletives I heard him let loose on these jobs, I would gather that it was not easy. While vent fans help move fresh air through the rig by forcing hot air out the vents and pulling cool air in through the windows, portable fans are a godsend to aim right at you when you start reaching the boiling point. We have a standalone, portable 12 volt Fan-tastic Endless Breeze Fan (and DC extension cord) so we can move it around the rig. We got this fan in Quartzsite one year for our (not yet purchased) sailboat and we’ve used it a lot in the years since then. But it is extremely noisy. Forget trying to sleep with it running nearby! It’s also kind of silly to spend so much money on a 12 volt fan when a smaller and quieter 120 volt fan will do just as good a job, if not better, for a fraction of the cost. All you need is an inverter. 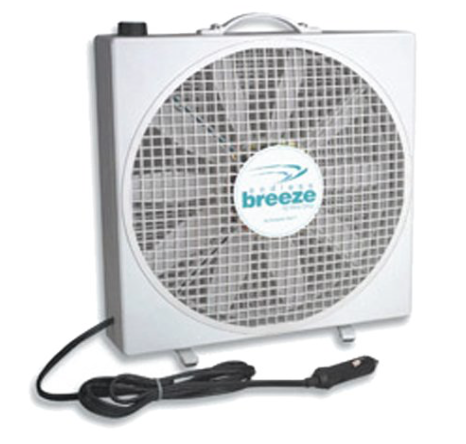 …A small, quiet, cheap portable fan will run on an inverter just fine! Our little portable fan is terrific, but there are lots of portable fans in all kinds of styles that are just as good. Last of all, there’s nothing that can cool down your body temp like an ice cold drink. A smoothie in a blender tastes wonderful and can bring your core temp down quite a bit. We make ice using old fashioned ice cube trays in our freezer, and we use a few cubes and frozen fruit in our smoothies to ensure they are as cold as possible. Our Osterizer blender draws 1000 watts, which is well within the limit for our 2,000 watt pure sine wave inverter. Smoothie time – Get cool with lots of ice and frozen fruit!! 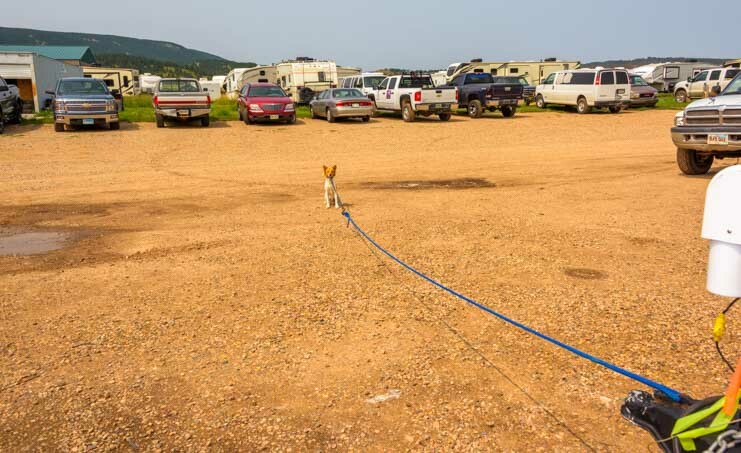 Those are a few of our tips for surviving the dog days of summer in our RV without hookups. It can take a little finagling and strategy, but these things have kept us cool in our trailer for ten summers now!